Here’s something i got from Korea 2 months ago and i finally started using it after the Maxclinic one which i got in April finished up. I used to remove make up with cleansing oil but i switched to Oil to Foam cleansing oil to remove my make up. This is used in the 2nd step after using the Biore cleansing water or Biore Jelly up remover to remove eye make up. Cleansing = 3 steps for me and that includes thorough make up removals. 3rd step – Foam cleansers. I love how this cleansing oil turns to foam when you lather your face with water. I don’t like how oil cleansers are soooo hard to remove even with foam cleansers. Some cleansers are too mild and may take longer time or quite hard to remove the cleansing oil on the face. 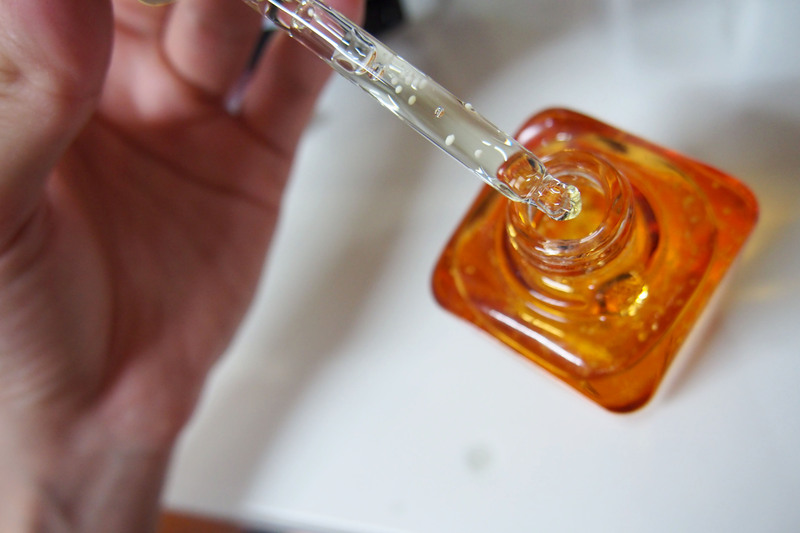 Or the cleansing oil is too oily and too strong for the cleansers. So it is good to get oil to foam cleansers because they don’t leave that oily feeling and it removes your make up. The Max Clinic one is good but not sold in SG. Blogged HERE before. Because it turns to foam after you lather with water , it rinses off easily. YAY ! Im gonna stock on this ON: and Max Clinic ones on my next trip in March/April. I maybe going for a short 5 days in Jan to check on the wedd stuff. Got this at KRW 7,500 after 50% discount from OLIVE and YOUNG. Lucky enough to get this at 50% off because when i want to go back to buy another bottle to stock up , it was back to KRW 15,000 and so i didn’t buy. Something you can buy and try as a 2nd step make up removal. Or if you are someone who puts on light make up , i think this one can remove your make up base well enough. Im turning 30 soon and im slowly introducing anti-aging products to my skin. I have sooo many sample bottles of this AGE AWAY range from HERA that i think the samples alone can last me probably 6 months or more. Starting to feel old and can feel the skin is no longer like last time. A little bit different from 4 years ago because now i realized i need to maintain it quite abit more than before. I like this range alot. I haven’t gotten any breakouts yet (not pimple kind of breakouts but rashes). Because when a product is too strong or rough for my skin , rashes will start appearing and they are the abit painful and itchy kind. It will take 2 days for it to go away. But yay to this one.no side effects. I think im like a K-travel guide. Friends often ask me where to go in Korea. Because they have been to Seoul soooo many times and they want to go elsewhere. They want to travel for 10 days. Seoul , Jeju and Busan. These are the 3 popular places. To be honest , 3 days in Busan or 3 days in Jeju is not enough. If you have the time , 5 days will be great for you to comb the entire place and go to more places. 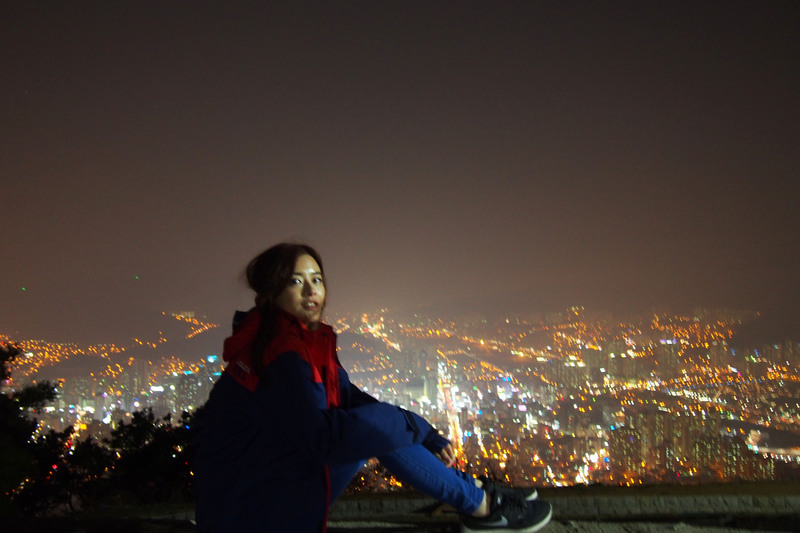 Most people put a week in Seoul because there are more to see. Actually i find that Seoul is more for shopping. But if you want to have a rich experience of the culture , you can go to these places. 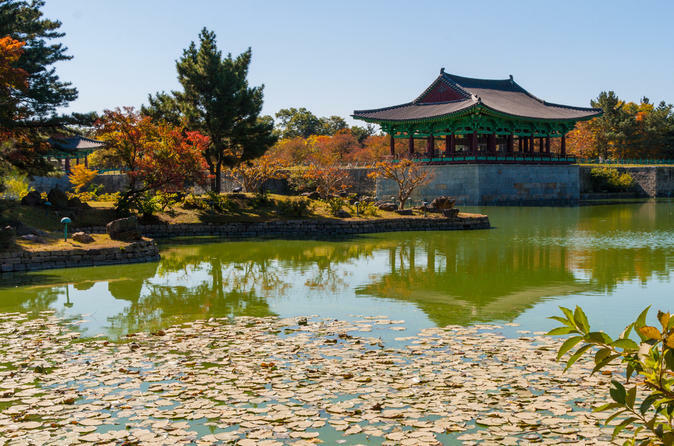 It was once the capital of the ancient kingdom of Silla and you can see many ancient and traditional Korean houses and palaces. Awesome place to go in Spring and Autumn because the trees , leaves and flowers blended in so well with the architectures. 2 days 1 night here will do. 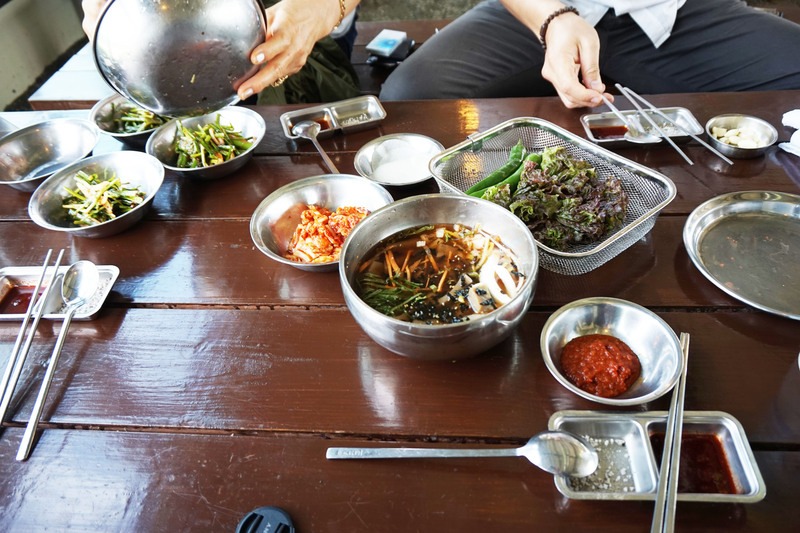 If you love bibimbap , Jeonju is the place you should try. 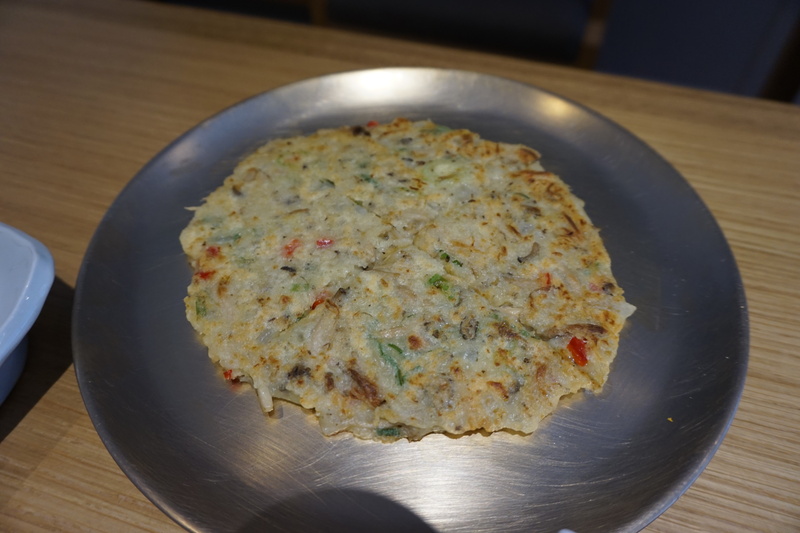 Jeonju is famous for its bibimbap. 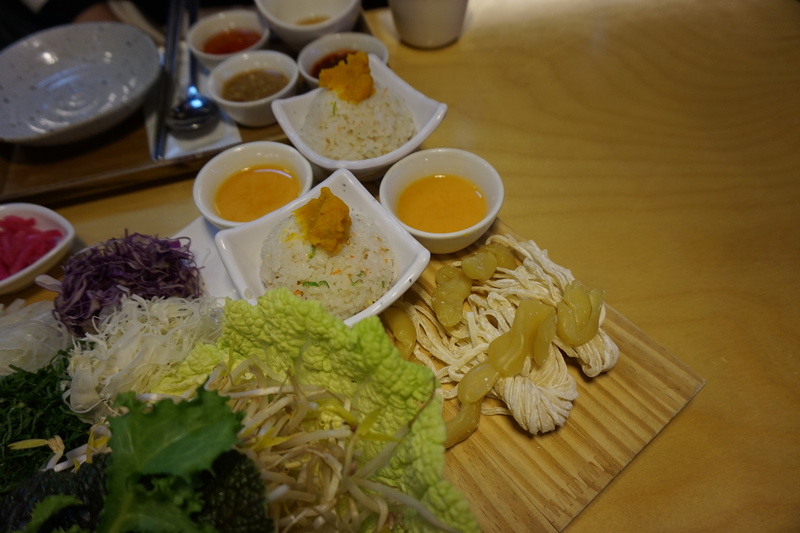 The Jeonju Bibimbap ! 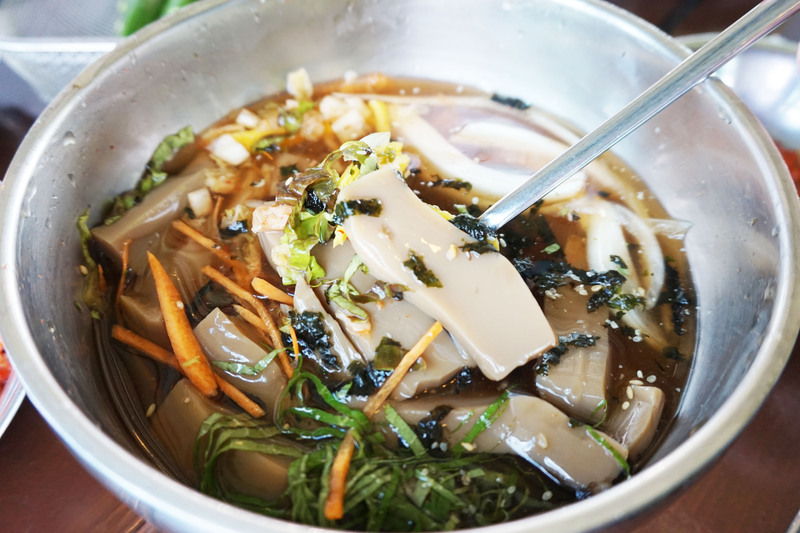 Jeonju is famous for its food. So remember to eat and eat and eat your way there. It is about 5 hours bus ride from Seoul so it will take about 2 or 3 hours via KTX ? Quite a small town so probably 1 day is enough. 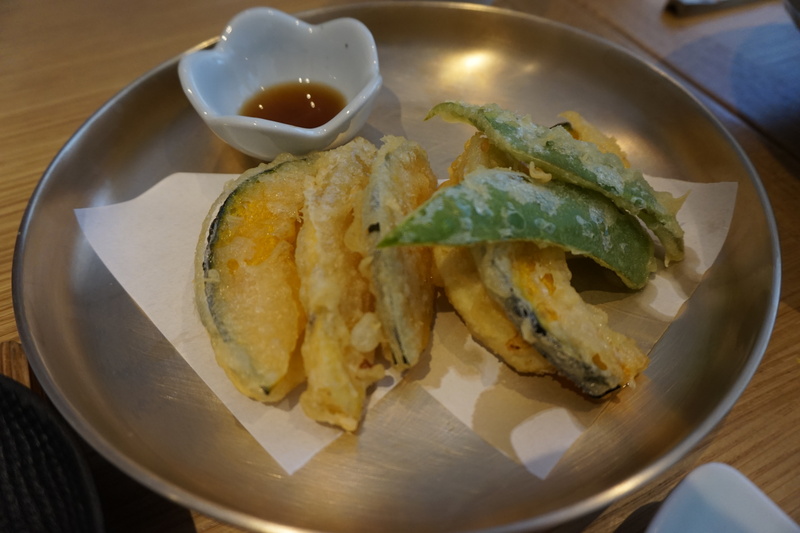 You should visit the Hanok Village. If im not wrong , you can book a Hanok stay there. 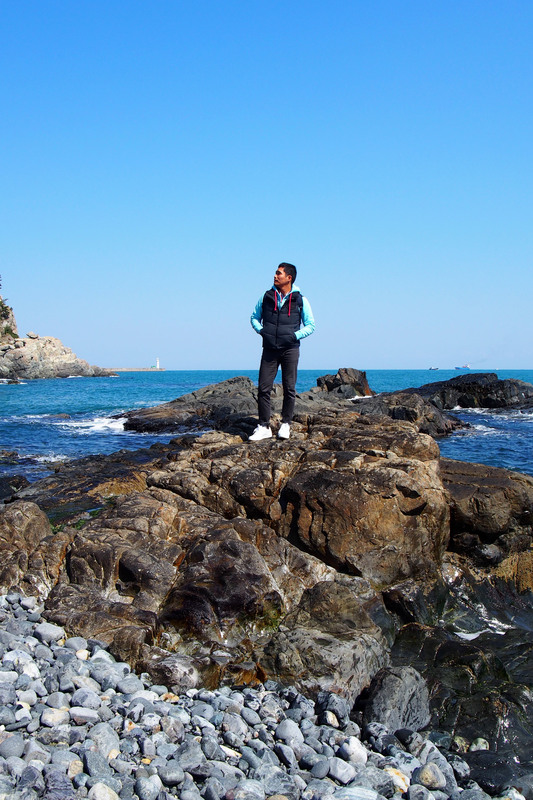 Tongyeong is located at the southern peninsula of South Korea. 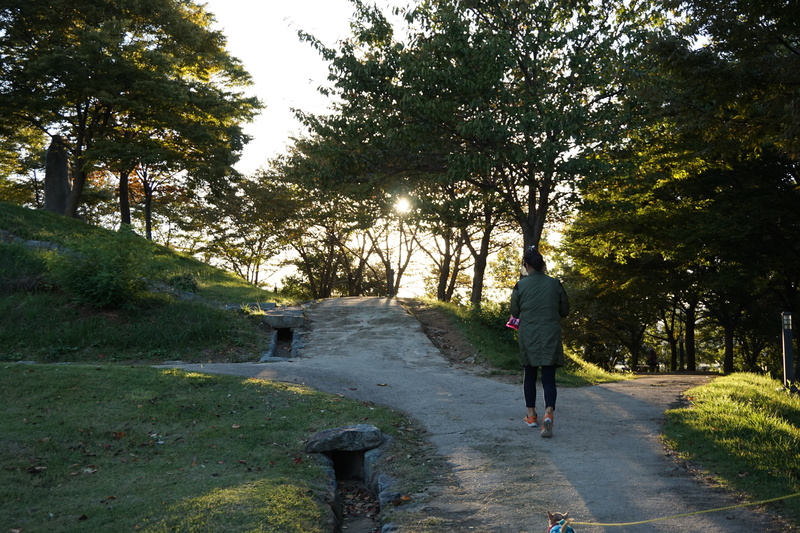 If you are a fan of K-pop star Song Joong Ki and you watched the movie Innocent man , you will know this place because it was shot here at Tongyeong at this place called Dongpirang. You can find alot of paintings on the wall and the shooting locations. Famous food here is the Ggulbbang ( Honey Bread ). Very cheap. About KRW500 per piece. 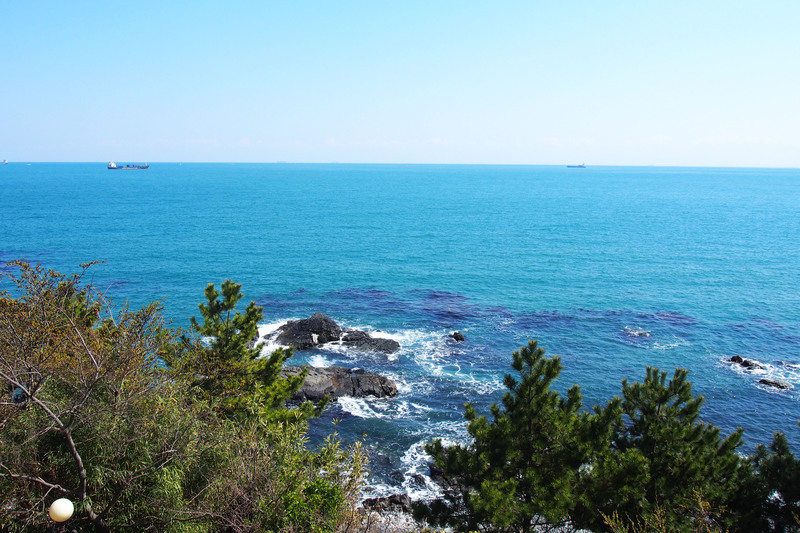 1 full day here will do and you can move on to other or take a ferry to Jeju. Good place to go in Autumn is the Naejangsan. 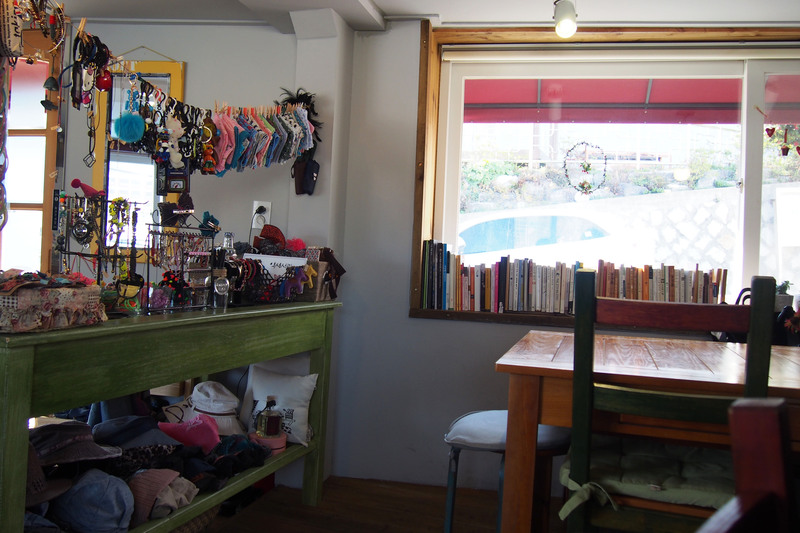 it is located at outskirts of Jeonju. You can find temples and beautiful waterfalls here. Don’t wear like me when you go there. I can’t climb up the mountain because of my clothes so i was only at the base. Just half a day here will do unless you want to do mountain hiking or trekking. 1 day stay will do and you can move on to Busan from here. Located an hour drive away from Busan. Famous place for its spring blossoms. 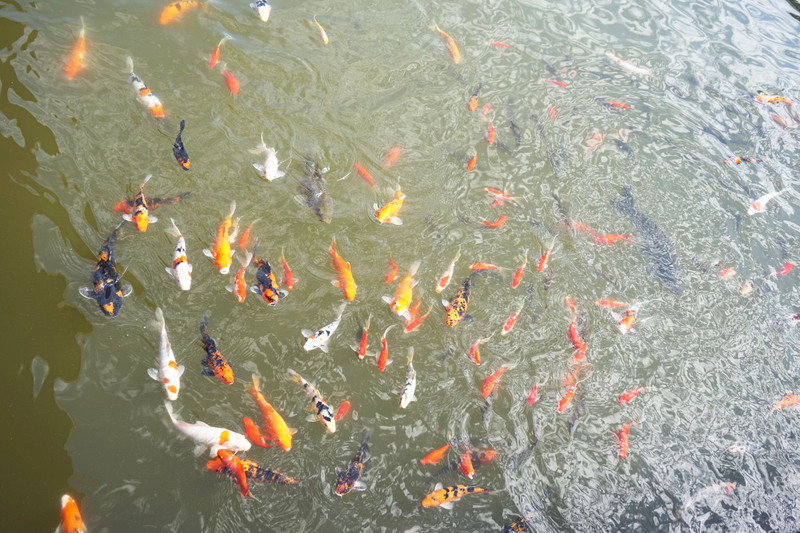 Crowded with alot of locals during Spring. 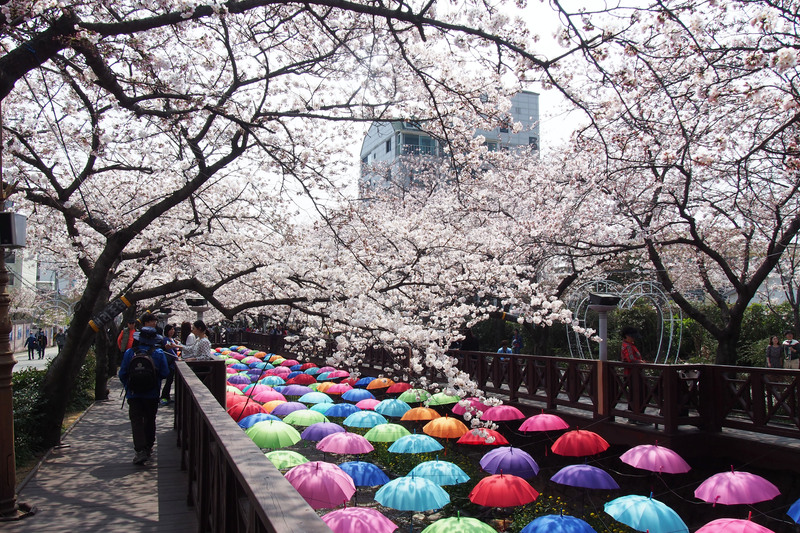 Best place i have ever been to in Korea in Spring. Super nice and even the mountains have “speckles” of white cherry blossoms. So nice ! I want to go back here again next year in Spring ! Cherry blossoms everywhere. 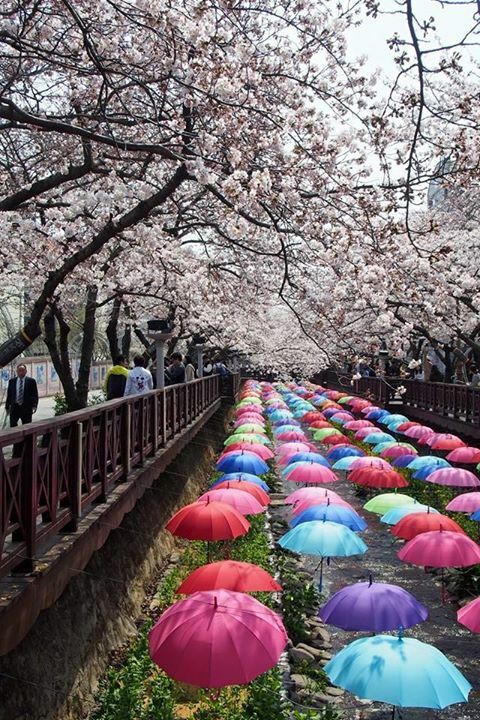 This is the best place in Korea for cherry blossoms. Best place to go to during Winter because of its ski resots and the snow capped mountains. Damn cold. I have never been there but i want to !!! I was asking Oppa if i can have my honey moon here hahaha he wanted to faint already because i wanted my honeymoon in Jeju island and Gangwon-do ! 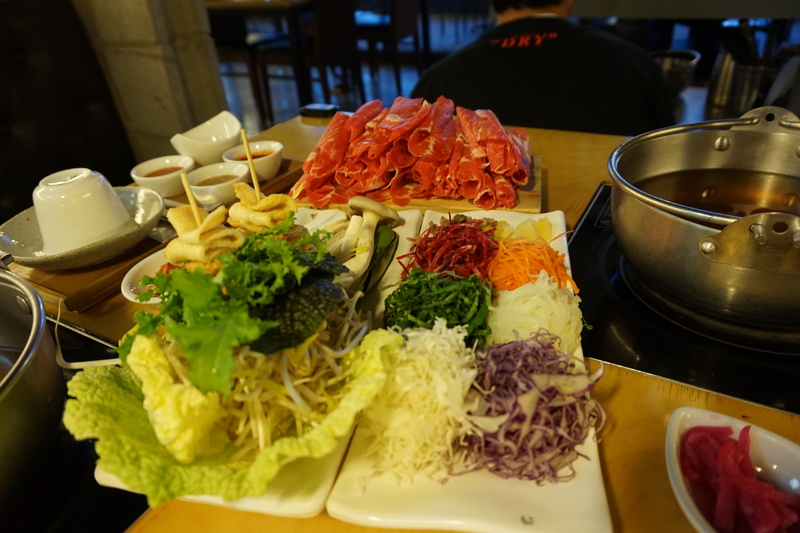 There are other places also like Daegu , Ulsan , Gwangju and more….i’ve been to Ulsan and 1 full day there will do 🙂 If you were to skip Seoul , Busan or Jeju because you have been there many times , you can go to at least 7 cities for a 10 days trip to Korea. It was the day after Chu Seok. Omoni has to rush back to her motel because there are 50 indonesian tourists checking in that day. So Oppa and i continued the night meeting his Uni mates. 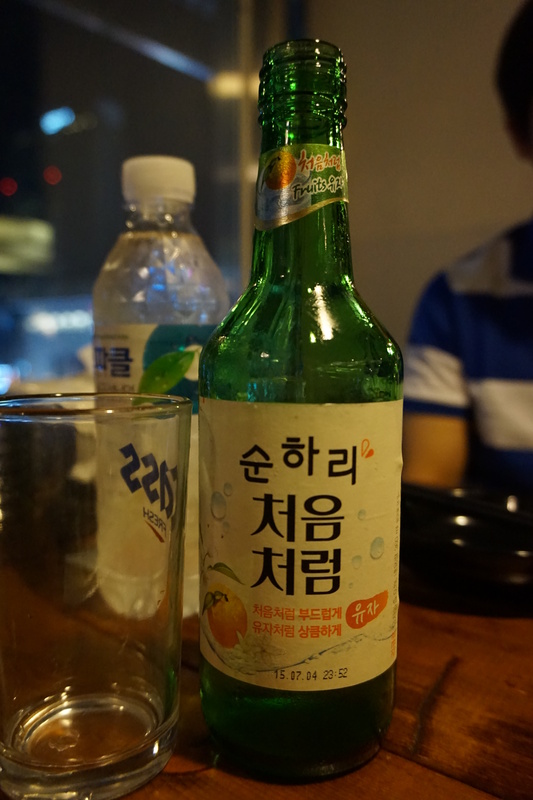 It was my first time drinking peach soju. Very nice and better than the original one because it is a little fruity. Girls will like it better. There are grapes , peach and apple flavours. KRW1,200 per bottle. Cheaper than your bottle of coke. Korean chicken. Beer + Chicken. This was the 2nd round. We had the first round and after that we moved to the 2nd round and then 3rd round. Never ending. I felt tired after the 2nd round already because in SG , we dont have the habit of going places for drinks and food. It can start at 7pm and ends at 3am in the morning or sometimes 4 am ( eat , drink and talk and it just keeps going on for hours ) . I was quite amazed by this culture at first but after 2 years , im used to it already. The day after Chu Seok , Omoni , oppa and i had lunch with his paternal uncle at their hometown in Busan which is Haeundae . His mother started to introduce me to their relatives and im supposed to visit his grandmother too. 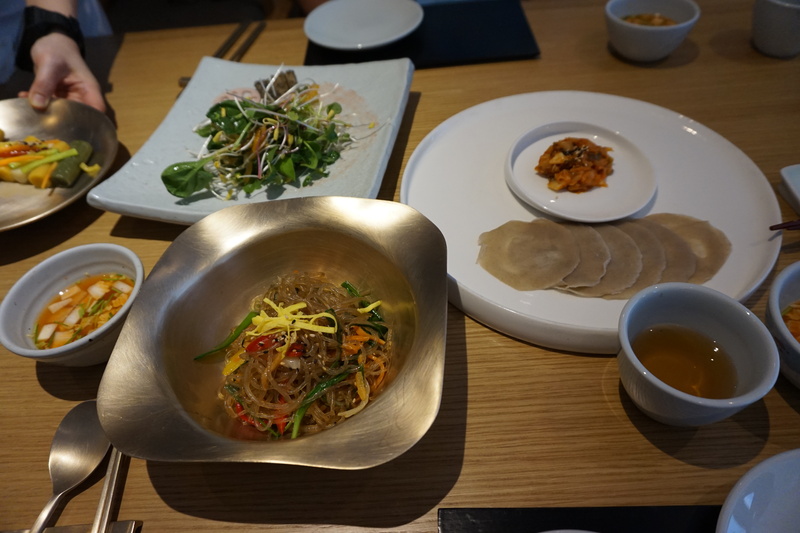 We had traditional Korean course lunch at a fine dining restaurant. 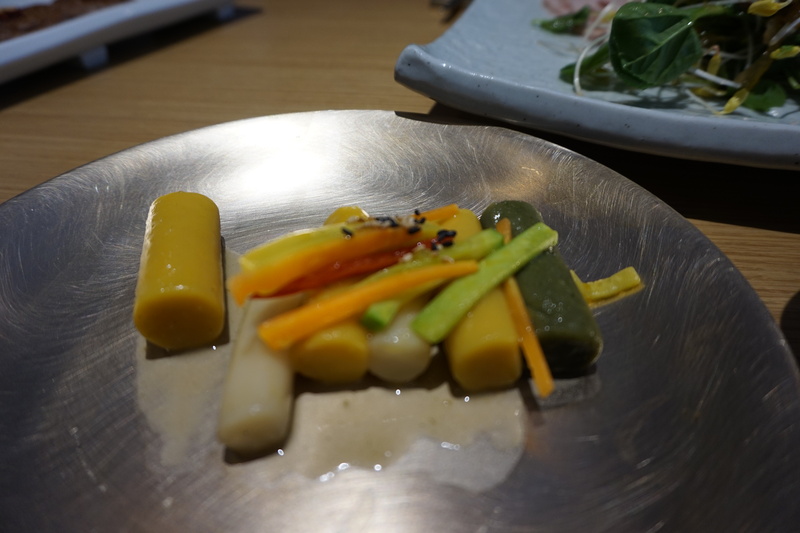 A traditional course that were used to be served to royalties. The food just kept coming and coming. I think we had over 18 dishes. They came in small portions. Name of restaurant is Ye Yi Je . It means past and present. We had our lunch near Hotel Paradise. 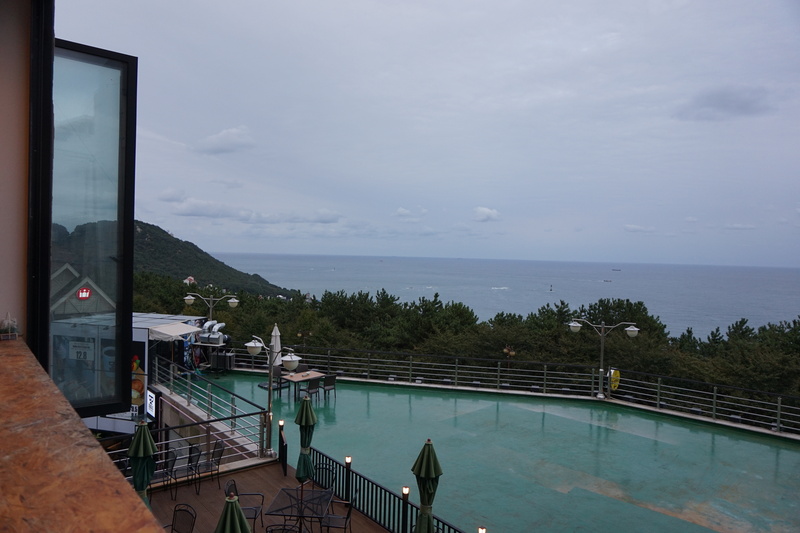 After which we went to Dalmaji-gil (달맞이길) in Haeundae. It is like the Montmarte in Paris. 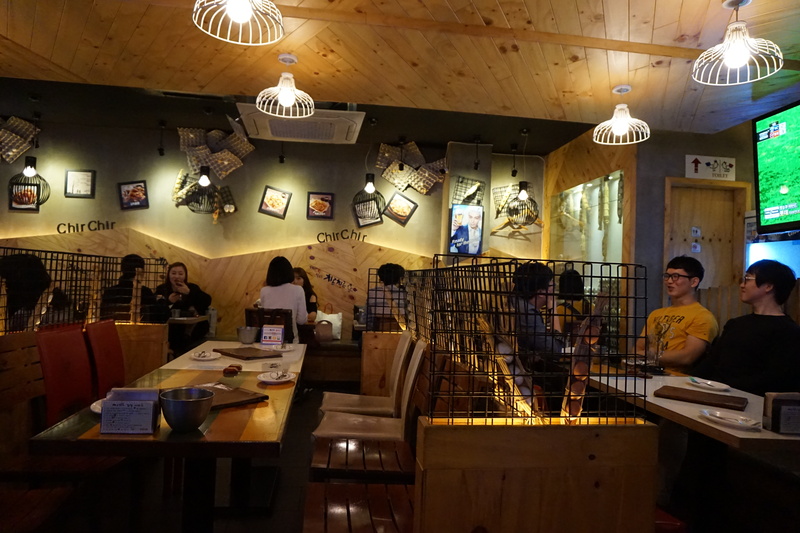 Alot of hipster cafes serving nice and affordable food. You will get to see alot of wedding photoshoot studios there too. Some of which we were eyeing at. 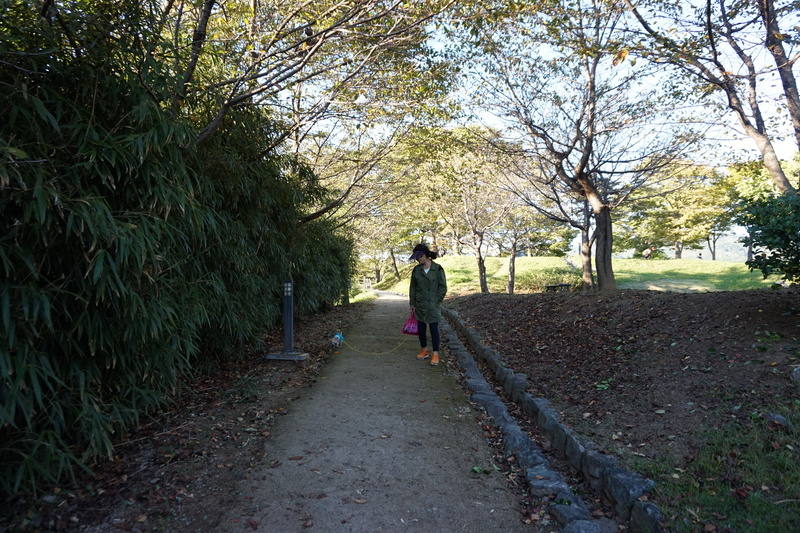 This is a good place to go to during autumn and spring. 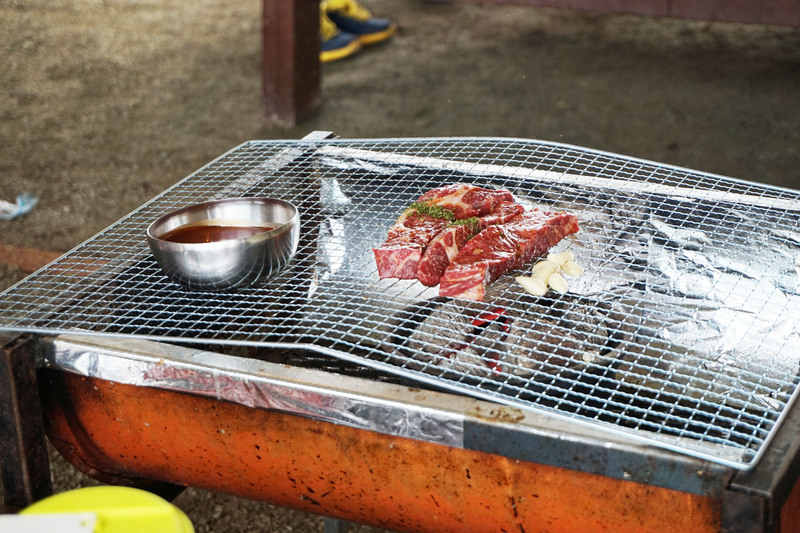 Because you can sit at the alfresco or indoor cafes and admire the maple leaves during autumn or cherry blossoms during spring. The trees along the street and road will look beautiful and colourful during these 2 seasons. 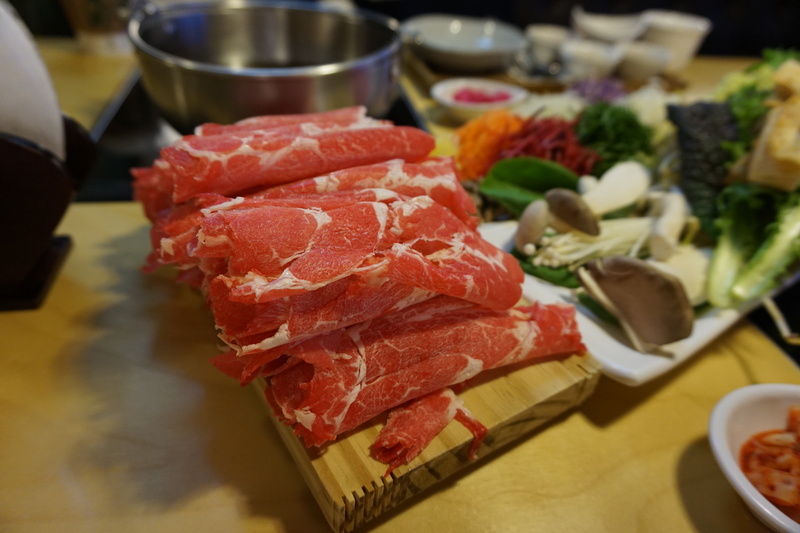 Oppa’s friend opened a shabu shabu restaurant so we decided to pop-by. His restaurant. We went there abit early so it was empty. But crowd starts streaming in during dinner time. 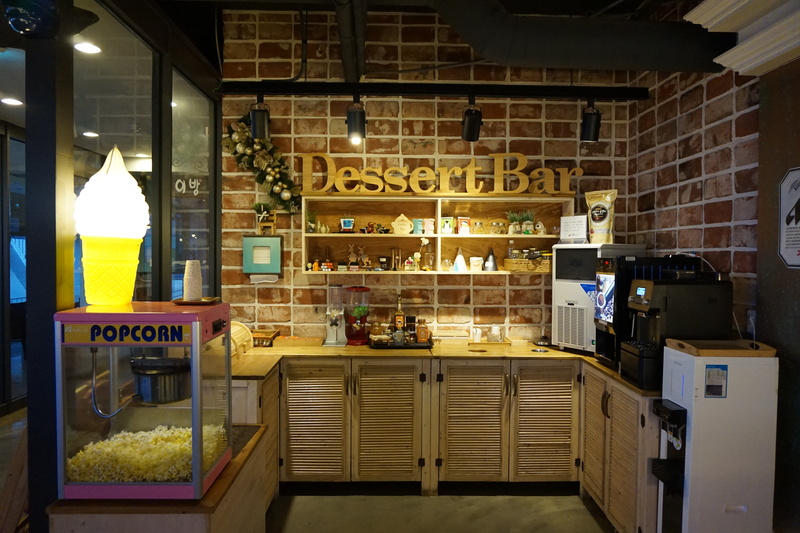 Self-service dessert bar where you can help yourselves with free flow of coffees , popcorns , sweets , teas , biscuits , cookies etc etc. It is complimentary for all customers. You are supposed to pour the rice into the soup at the last part and stir it so that it will become porridge. It is sooo yummmy ok ! That bowl of yellow stuff was beaten egg which you are supposed to add into the porridge to make it sweet. I can have many bowls of these ! The plastic looking thing is the clear vietnamese rice roll wrap. Texture was like plastic when it was hard. Just soak into this red solution which i guess is red vinegar . Then the harden wrap will become soft and you can start doing your own vietnamese spring roll wrap with all the veges. 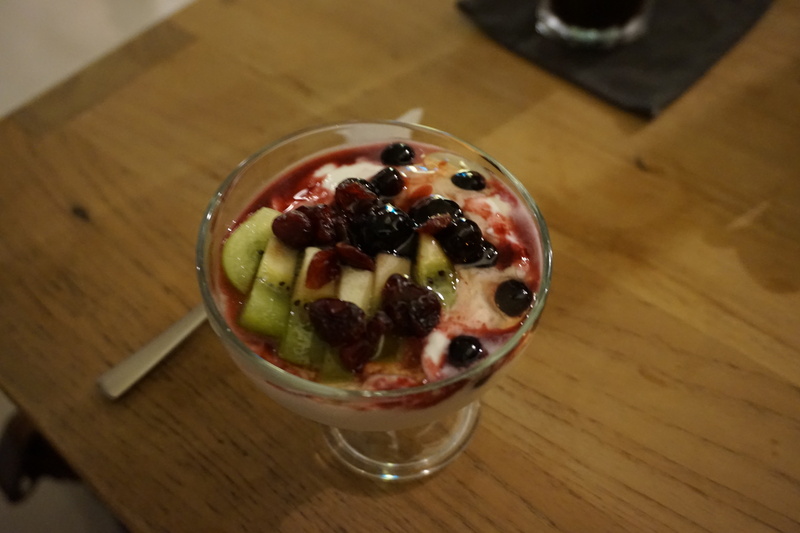 After that , we decided to chill out at a cafe for desserts and some catch up. One of his friend was a Korean air stewardess so i managed to exchanges some travelling tips and places to go in Europe with her. Dalmaji-gil. 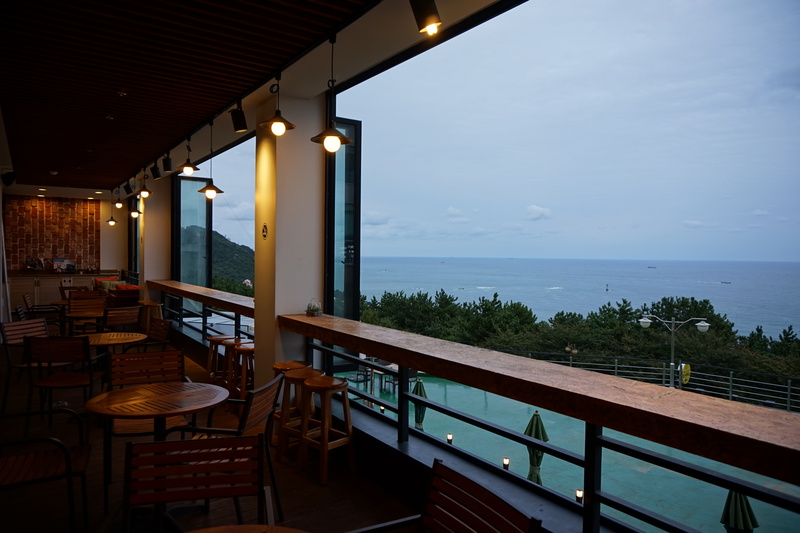 You can see some Japanese islands from Dalmaji-gil by sitting at the top floor of the cafes. 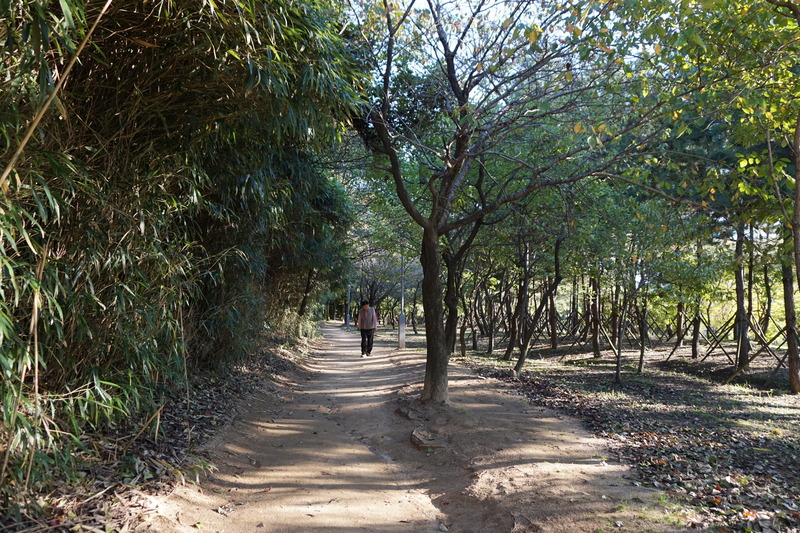 Imagine these rows of green trees turns red and yellow during autumn or filled with cherry blossoms during spring. Me , oppa and his friends whom i called Onni because they are older than me. 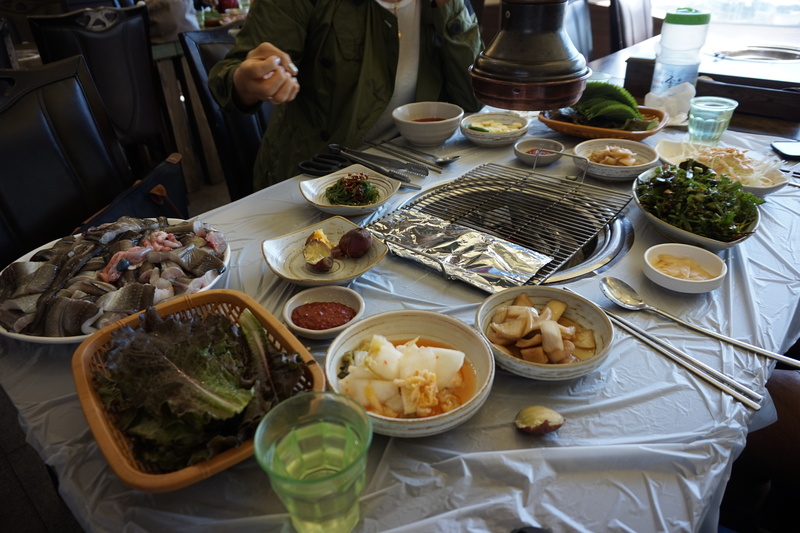 On the day before we left for SG , his mother brought us to a famous live eel bbq restaurant at the outskirts of Busan. 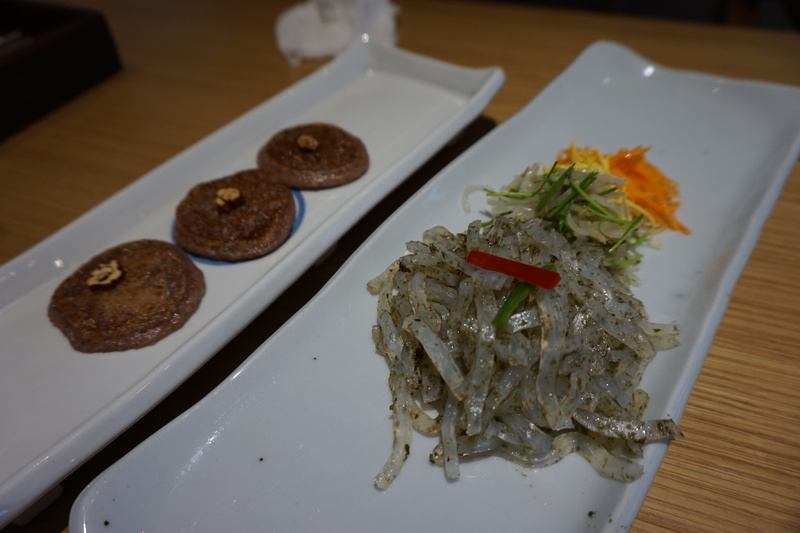 You can see alot of restaurants there serving live eel bbq. 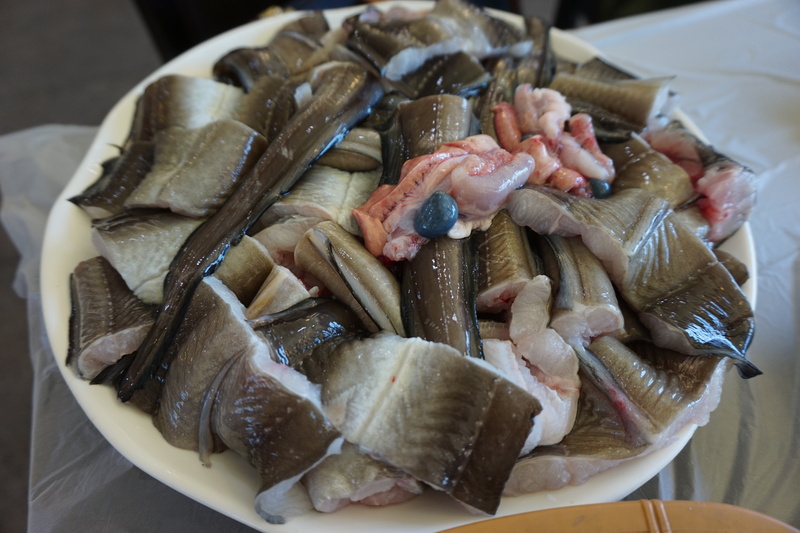 Yes , the eels were sliced and cut live before BBQ so you can see the muscles still twitching when they serve the plate below onto the table. I posted a video on my instagram. To be honest , it tasted better than frozen eels. 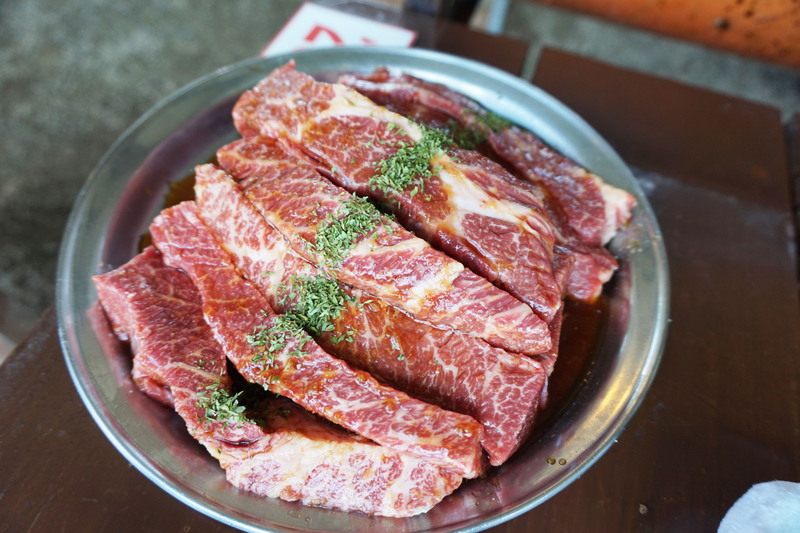 The meat is very tender , fresh and qq. 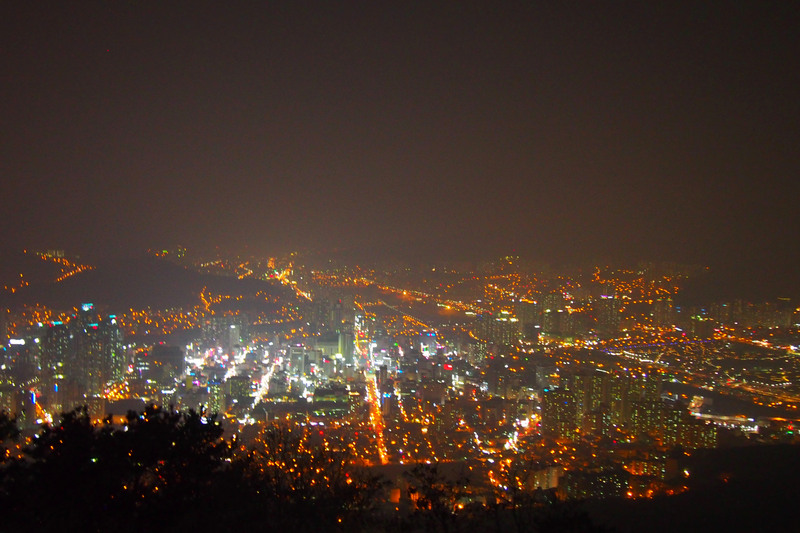 If you are traveling to Seoul and Busan , you should travel to the outskirts of Seoul and Busan too. Because you can find many nice , good and cheap food . Not only that , you can enjoy and embrace nature and the fresh air. Nice and cooling weather at 20 degrees celsius. 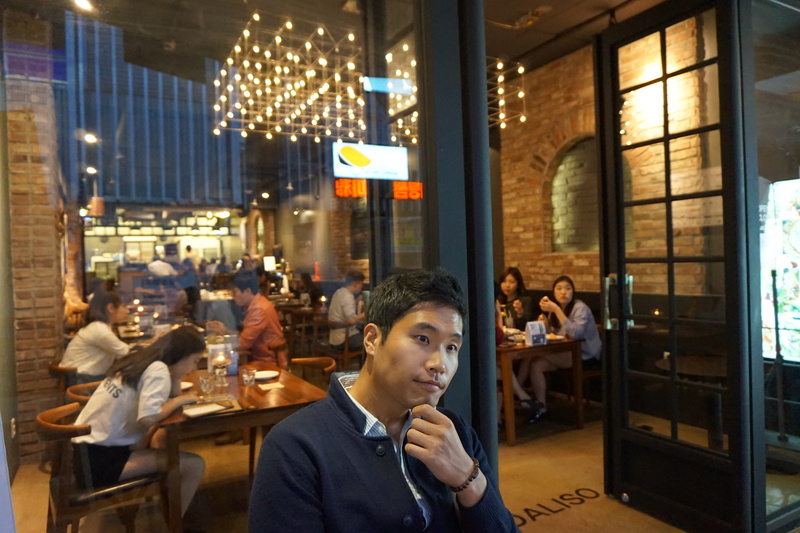 Eat and eat and eat until looked so chubby and cui in Korea. Lol. 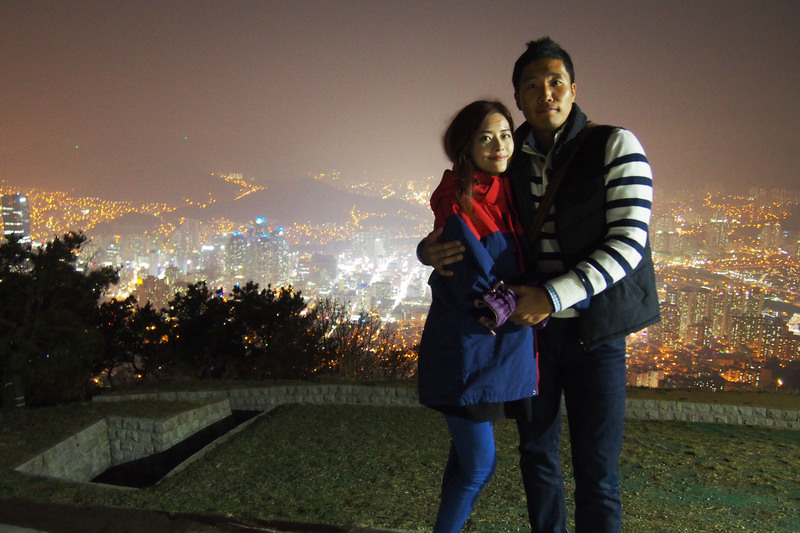 After our hearty meal , we went for a stroll up a little hill near Omma’s house. Even Bomi joined us too. We always stayed at the biggest room in Omma’s motel whenever we are there. This was the room on the 8th floor which we always sleep in whenever we are at Omma’s motel in Gimhae which is 20 mins drive from Busan. 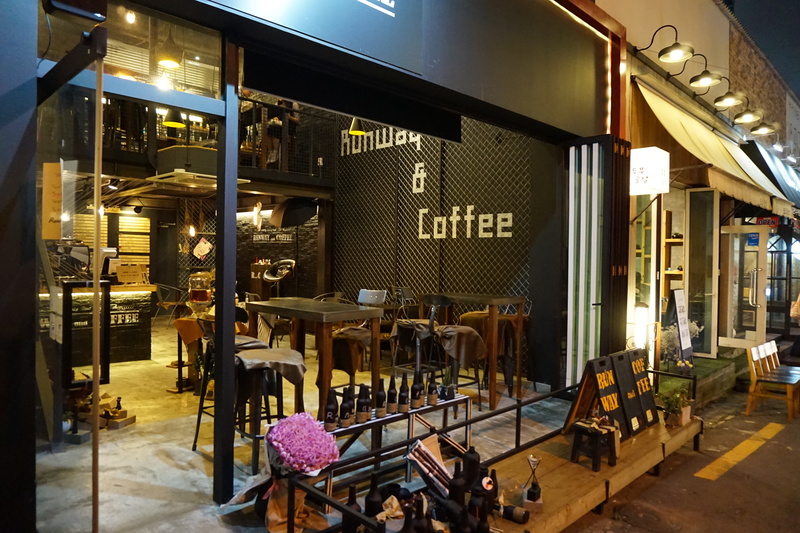 It is 10 mins from Gimhae airport. Gimhae and Busan is just like Incheon and Seoul. Airport of Seoul is in Incheon and airport of Busan is in Gimhae. 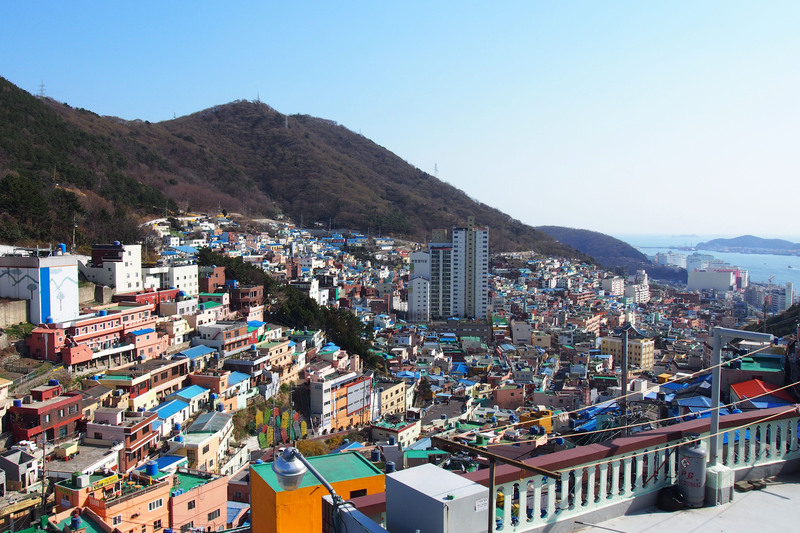 Busan is the 2nd largest city in Korea after Seoul. Yes in Busan , you can find the world’s largest shopping mall (Centum City / Shinsaegae ). Will intro more about Busan next time. And here is another big room. 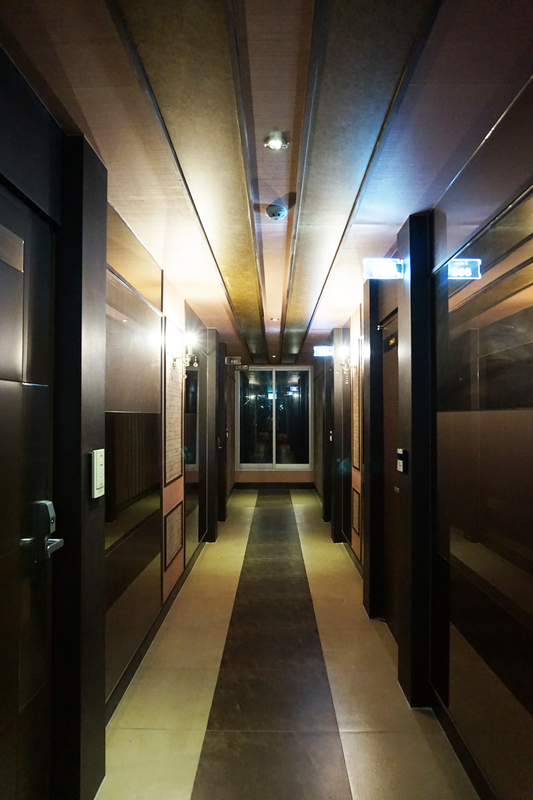 Room rates range from KRW50,000 to KRW 70,000 depending on the no. of pax. The airport of Seoul is at Incheon and the airport of Busan is at Gimhae. 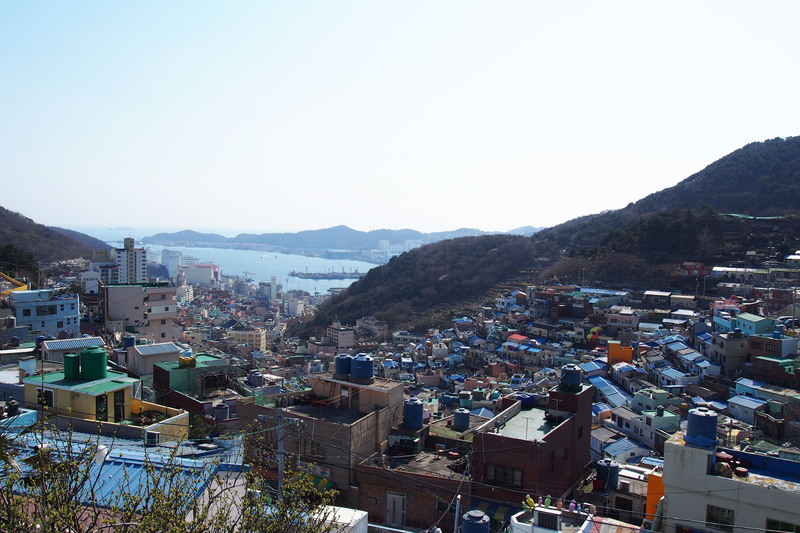 Most of the time , we stayed at oppa’s brother’s apartment in Seomyeon, Busan. 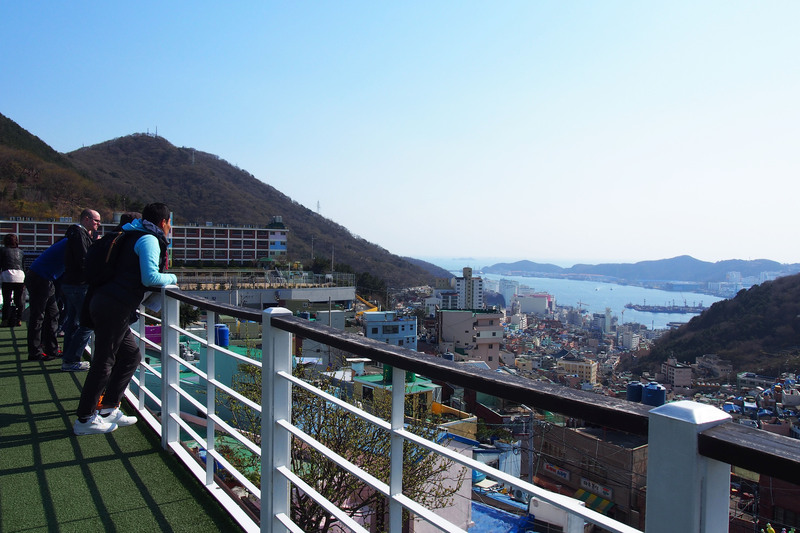 We go to Gimhae and help his mum out at her motel over the weekend. Hehe finally done documenting my 2nd trip to Busan. Looking forward to the next trip !! Back to work today and i really miss the autumn weather in Korea. Imagine clear blue sky accompanied with a nice breeze and the air was very fresh especially at the mountains in the day. The haze condition in SG is getting worst. It was bad before i left and even after 2 weeks , it got even worse. My nose itches and i kept on coughing whenever im outdoors. This post is going to be lengthy one with my personal thoughts , 2 good news to share and also continued updates on my Korea trip. A couple of my friends who have been following my blog and instagram asked me why haven’t i been updating my social media platforms as often and why have i not even started snapchat ? To be honest , i really enjoyed my trip this time without considering so much about taking pictures just to update on my social media accounts. I don’t want to keep thinking about what pictures or visuals to update on my instagram page or other social media platforms. I don’t want to spend time arranging the food nicely on the table for visual purposes. I just snap a simple pic and enjoy eating the food while it is hot and nice. I want my blog to stay true where i jot down all my daily life and memories. I can be abit blunt sometimes but they were straight from my heart and mind.. I want to keep the pictures for memories and document my travels , food i ate , places i have been to and share genuine reviews and tips with people. Sometimes , i even flip back my past posts to refer to when i need to and read my old posts with my bf. Because i forgot how to get to that place or what brand , what address or how it looks like after awhile. Now that i am turning 30 next year , i just want my life to be simple. Enjoy time with my love ones , document and share my travel experiences , beauty and make-up journeys. I enjoying sharing and exchanging tips and feedbacks with readers too. Just simple and sweet. It is also time for me to settle down. I know i have some regular and long time readers of my blog who have read about the ups and downs that happened in my life. And i am also glad to have their support. It was really touching to receive their emails with words of encouragement during my down times. During my down times , i was in no mood or in any good condition to reply anyone even though i read their messages because i wish to be alone. But i do felt touched by their words even though i didn’t express it out. And also i made friends with my readers and even customers. Like i said , it is time for me to settle down , so i have 2 good news to share with you especially with people who were there for me and always encouraging me. Oppa and i are already planning for our wedding in Sept 2016. We are looking for photo studios to shoot our pre-wedding photos in Seoul or Busan and also to look for wedding venue in Busan. Whereas in SG , we are looking for a venue for the ROM ( + event styling and catering ). The main wedding will be in Busan. Planning to do pre-wedding shoot in Spring 2016. 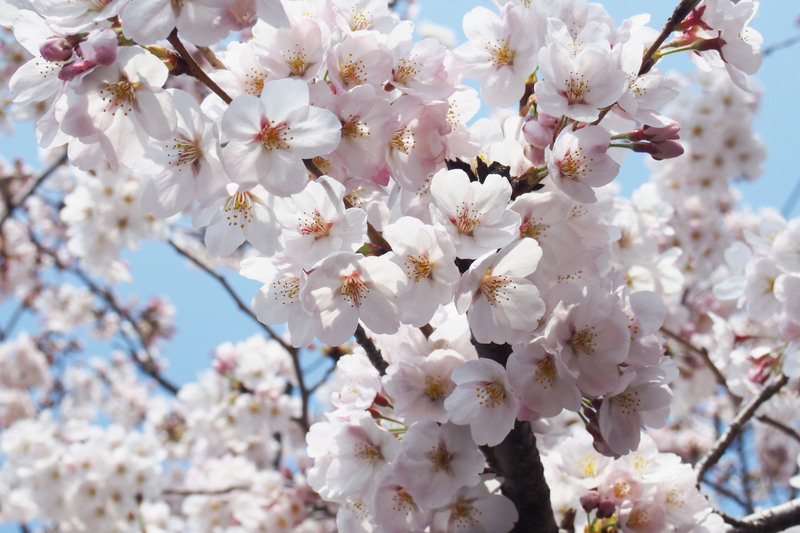 It will be nice because of the cherry blossoms. I will be tailoring my own hanbok for the wedding on my next Korea trip. I am thinking of pastel tones ( Ivory top with Peach/Pink bottom skirting). It will be a Korean + SG wedding. The ROM in SG will be a small affair. We ever thought of holding it on a yacht with a few of our close knit relatives actually because he was a ship navigation 2nd officer, has license to operate a ship vessel and he loves the sea. We were also considering holding it at a nice cafe or somewhere with a touch of nature because i love gardens and flowers and the budget is more affordable. 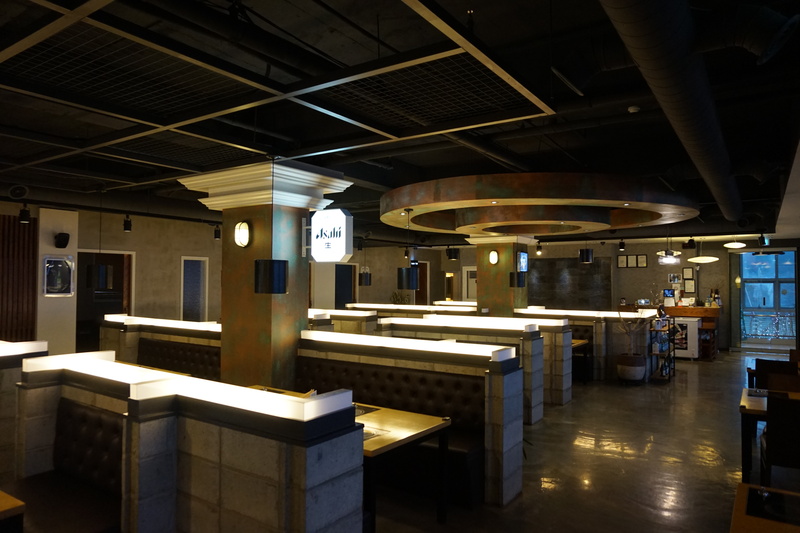 Here is one of my shortlisted venue in Busan. Something garden-ish. For 2 years , this man has never made me worried and he really takes good care of me. He supports me in whatever i do and he understands my fear and bad experiences with trust in relationships so he always assures me. He feels and thinks that it is the responsibility of the man to take care of his woman and his family. After going through ups and downs in my life and in relationships , i know what i want in a marriage. I only hope for a happy and simple marriage life. Just need someone to be there for me and to be there for me for life and our family. It has been my dream marriage since young which is to have a happy family with my kids and a dog. I will document down my planning process and hopefully to share and exchange tips with fellow readers who are in SG-KOR relationships or weddings. If you ever held a SG-KOR wedding , please drop me an email at peonykissblog@gmail.com. Well, Here comes the 2nd good news ! I am embarking in the Financial Planning career. I have always been interested in the Finance industry since graduating from SIM with majors in Banking and Finance. For 3 years, I worked for a Private Bank and I am happy to be back into the finance industry once again. To be back, it is something that I have always wanted to do. And this time, I will be at the front line happy at crossing lives and getting in touch with people at the same time. So from now instead of just blogging about my make-up and skincare reviews and Korea travels , i will share some of my financial planning work experiences and financial matters too. So what about AE ? I guess this will be what most people will be curious about. It is still running by my family as usual. There were a lot of shifting and moving to a new office for the past 2 months but you can expect a new collection this coming Sunday ( previews are up on facebook page ). 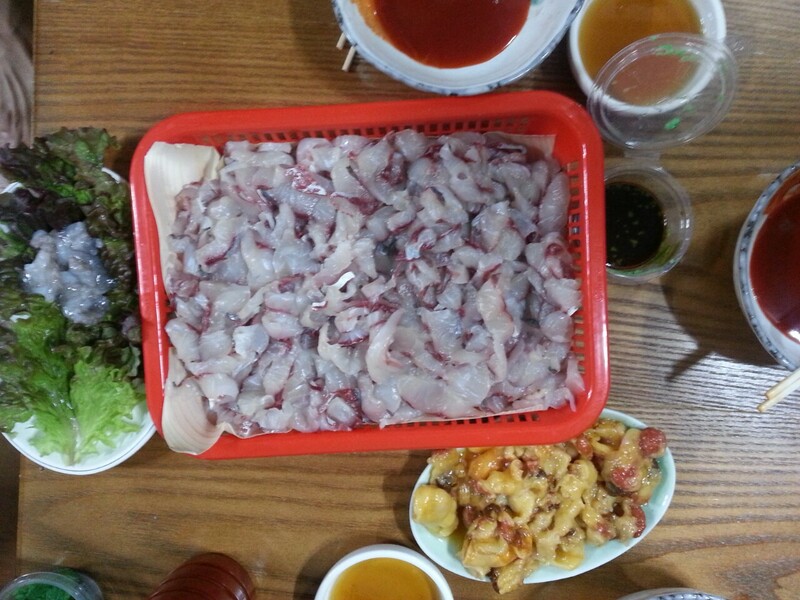 I celebrated Chu Seok ( Korea Thanksgiving Day ) on 27th Sept with Oppa and his family. And that was when i met some of his extended family members. I spent the day in the kitchen helping his mother with the food and to serve the guests. It was a tiring day because the cooking and preparing started as early as 5am. All ended after lunch time and all of us knocked out till evening. Because Oppa’s dad passed away more than 10 years ago , his relatives will come over to pay respect to his father on Thanksgiving Day. It is the day where Koreans pay respect to their ancestors and family members who passed away. Only the men will be paying respect and the women in the kitchen. Men must be dressed formally in suits , pants and shirts. Managed to snap a pic secretly while preparing to serve lunch. After the lunch , i helped his mother to clear up before i KOed. 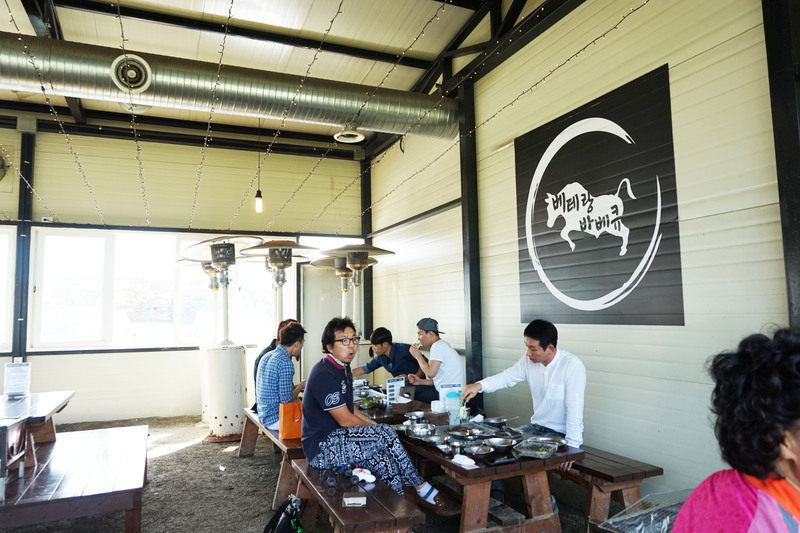 Next day , Jinjae oppa took leave and drove us to a small own near Ulsan for the famous and popular beef BBQ. 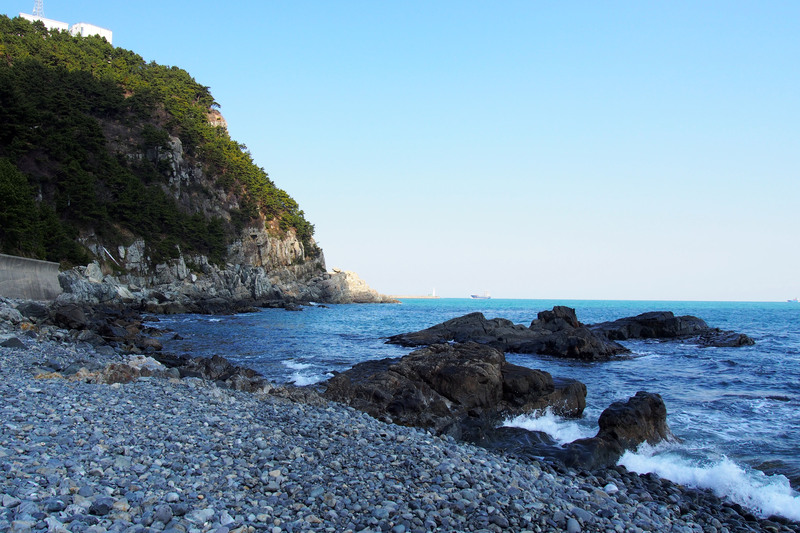 It is an hour drive from Busan. I just realized that the best food are located at the countryside. Cheap and good. Supposedly to go to Gyeongju this Sept but Oppa has to renew his driving license because he has not driven for 10 years. So he has to attend a 2 day course and take the driving test again. So we shall bring the Gyeongju trip to next year. Busan itself is so big. Went there 2 times and stayed there for 1 month in total but i have not been to every corner of Busan or even the outskirts of Busan. It was a fun car ride chit chatting with each other and Ommoni is happy to have her 2 sons by her side and traveling with her. 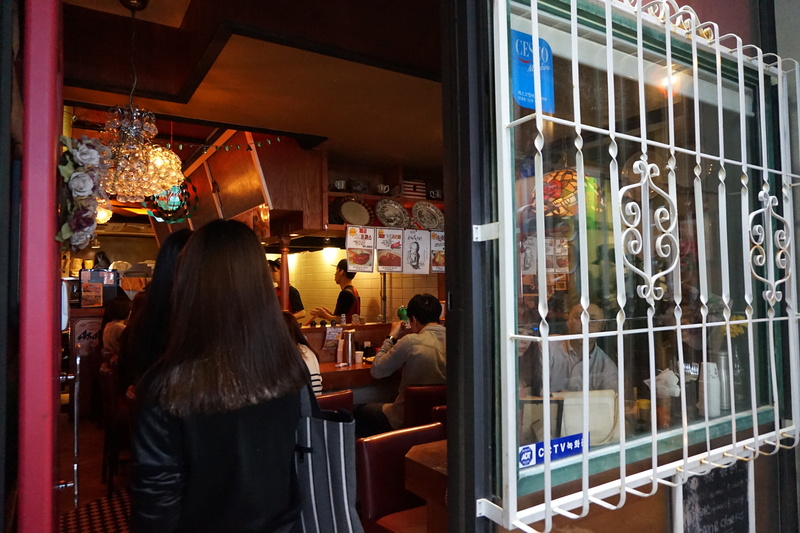 The BBQ place was so popular that we have to wait for 30 minutes. You can wait at the shelter near the pond. 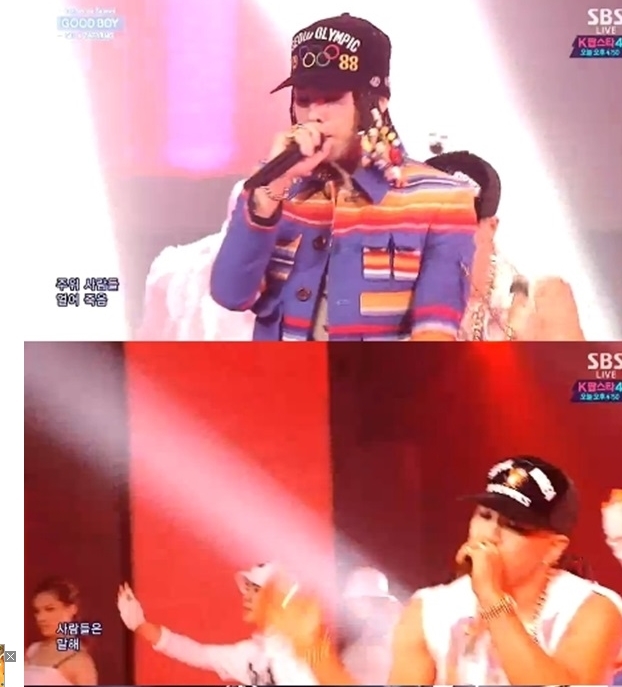 Saw GDragon and other celebs wearing the Seoul Olympic 1988 cap before. So when i saw it while shopping at a fashion concept shop , i have to get it ! It is the last piece too. 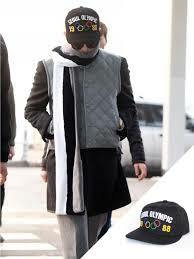 He also wore one in the latest Big Bang US world tours concert held few days ago. I looked at what caps the celebs wear whenever i watch Running Man , Infinity Challenge , Returns of superman or any other variety shows because their caps are all so nice. The HALYANG cap which Kang Gary from Running Man is often seen in is a hot item too. 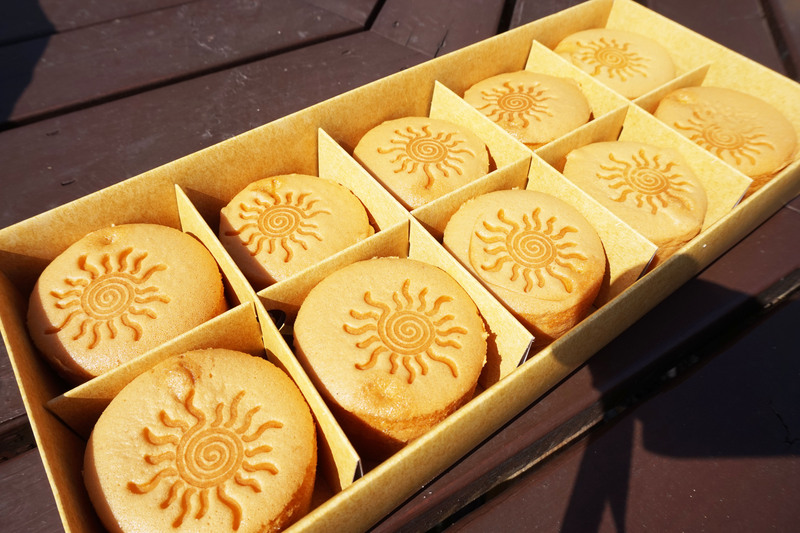 Can see many places selling it when i was shopping in Busan. Look who joined us that day ? The youngest in the family , Bomi ! We have to hide her in the bag when seated in the restaurant. 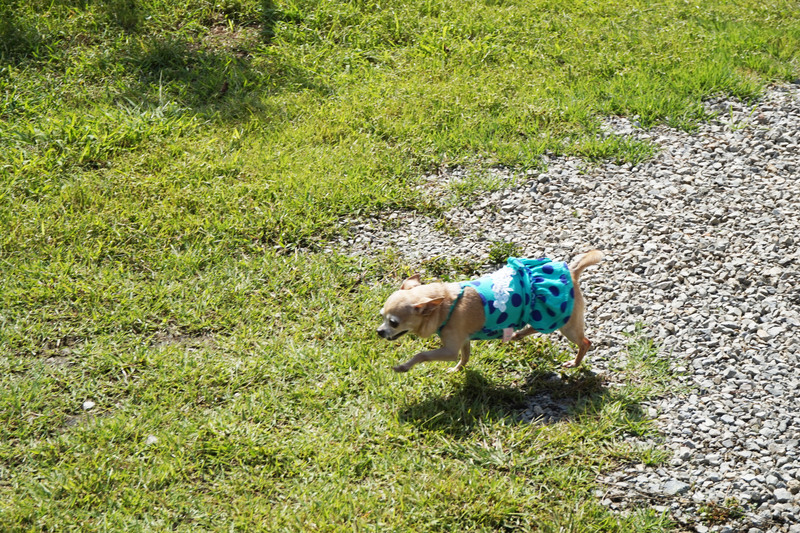 But she managed to sneak out after smelling the BBQ beef. 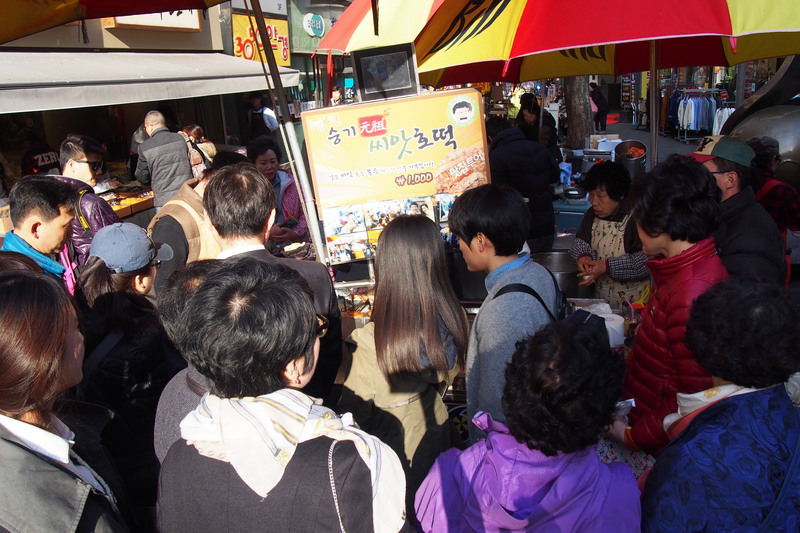 While waiting , we went to buy the Hae Bbang ( custard bread ) which is quite a popular snack in this town. My bf and his bro. They are my 2 big pillars and bodyguards. Jinjae oppa is such a good cook ! The pastas and food he cooked are so great. First time trying Samjang soup and it tasted so nice ! I want to learn to cook this ! After our hearty meal , we drove to this big field which was just 5 minutes away from our lunch place. Popular hangout with the locals. Weather was perfect , grass were green and clean and you can see many families having picnic and chilling out on the field. 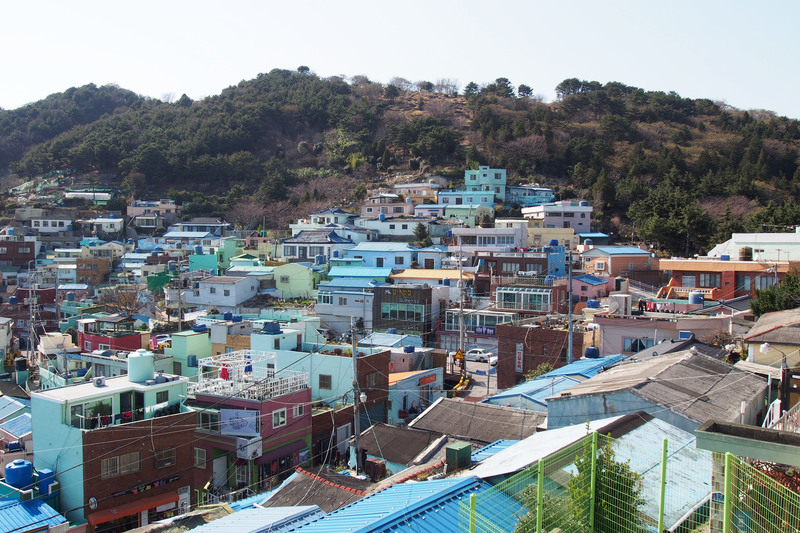 Ulju is a town in the city of Ulsan located at the easternmost of South Korea. 2nd largest mailbox in the world and you can post your postcards and receive them a year later. I don’t know is it the angle or my flat hair…why i looks so bah bah here ? Back to Busan after our trip to Ulju in Ulsan. We went to cafe street which is just opposite our house. 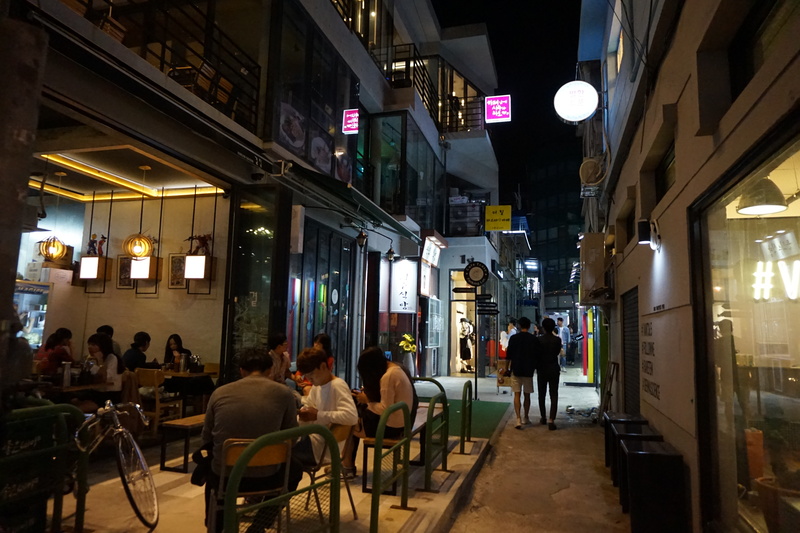 This cafe street is Busan’s version of Dempsey hill + Holland Village + Haji Lane. 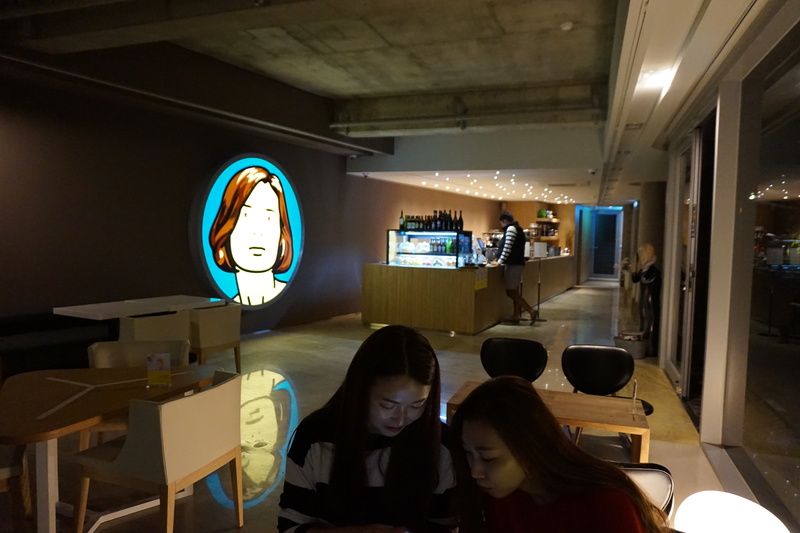 Alot of concept cafes here and the prices are affordable and cheap. 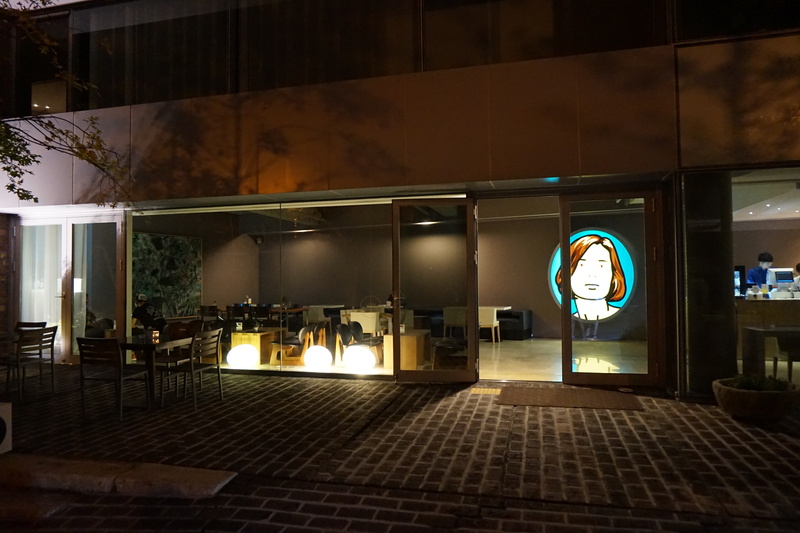 You can find many interesting cafes with unique decors and concepts. 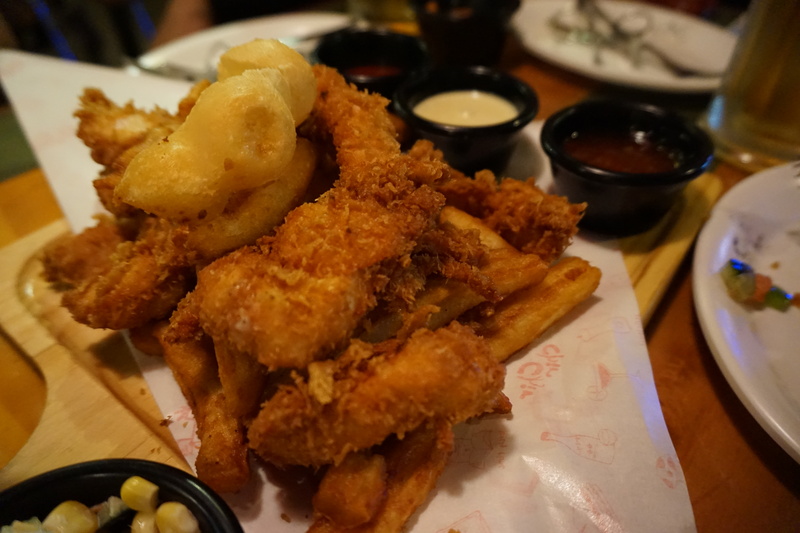 Fans of lobster rolls can enjoy lobster rolls at only KRW 15,000 with fries. Wanted to try this but it was full house. Saw the rolls from the window and they looked so delicious with generous servings of thick juicy lobsters. 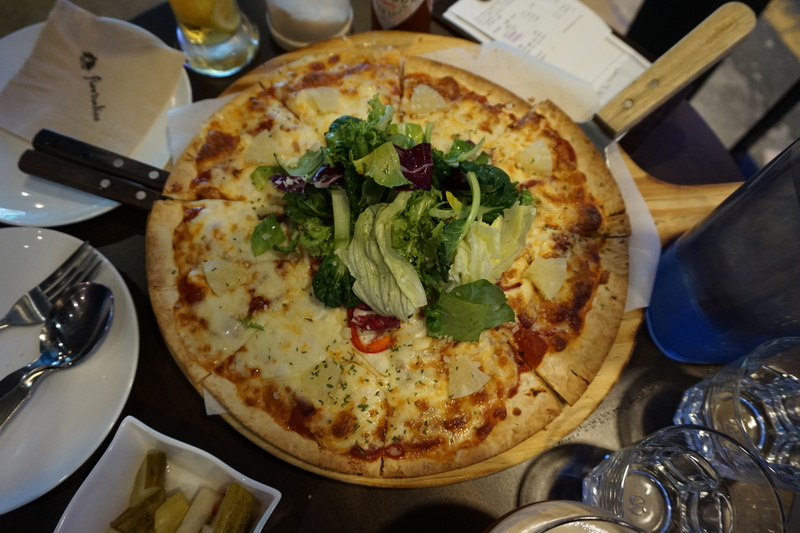 This big pizza is only KRW 15,000. So huge and we struggle to finish it. Bread and side dishes are free flow. You can toast your own bread at the “SELF” corner. “SELF” in Korea means self-service. After our pizzas , it is time for dessert. 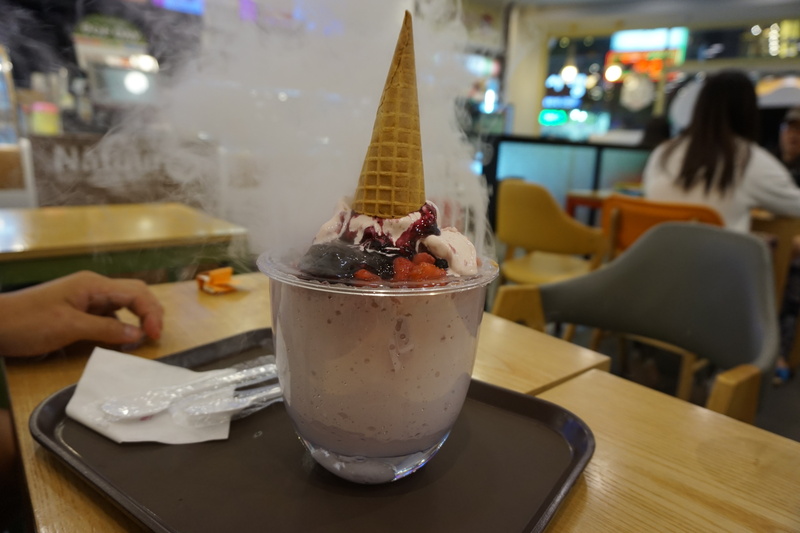 Saw a promotion and this strawberry ice cream bingsu cost only KRW 3,900. So yummy with generous servings for strawberries and raspberries. 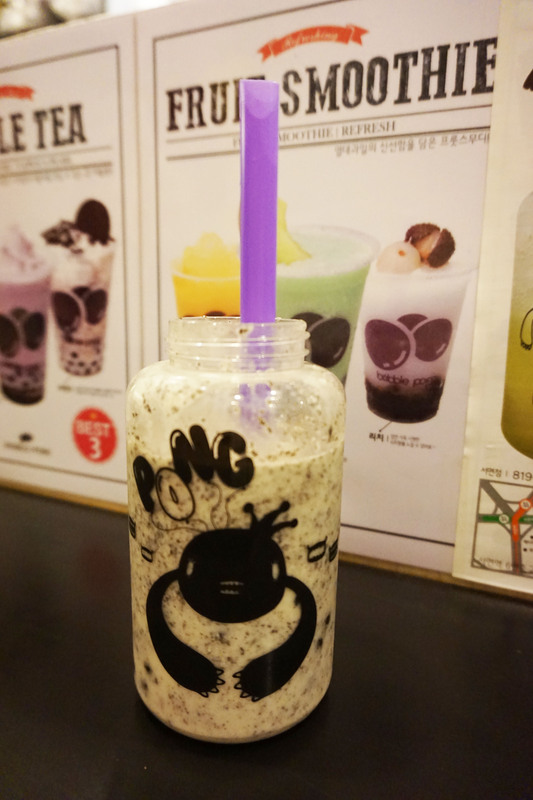 After which , we went for our favourite bubble tea – Bubble Pong. It is located across the road from NC Shopping mall’s Lotteria. My favourite bubble tea place and i have it almost everyday. Served in a cute little bottle which you can bring home if you order the large size. That’s how we ended our day 10 ! Just started using some of the new skincare products i bought from Korea. Loving it and shall review it soon. 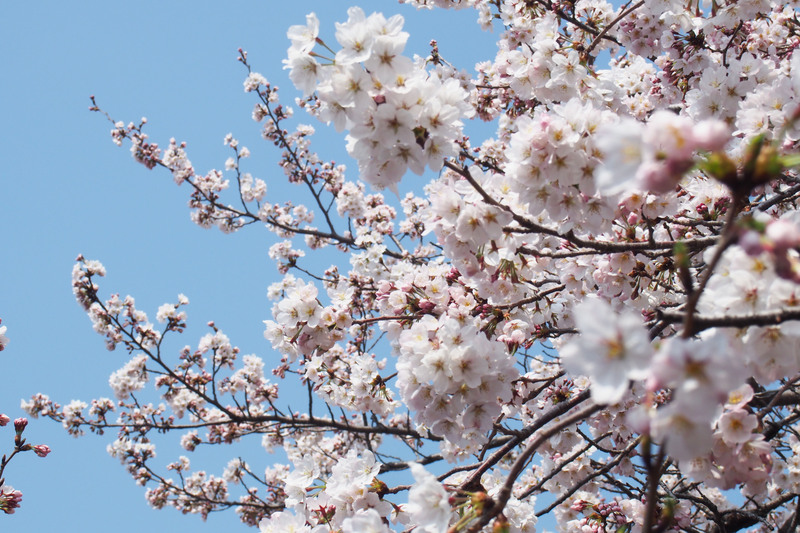 Fortunately when i got well , weather turns slightly warmer and cherry blossoms were everywhere . 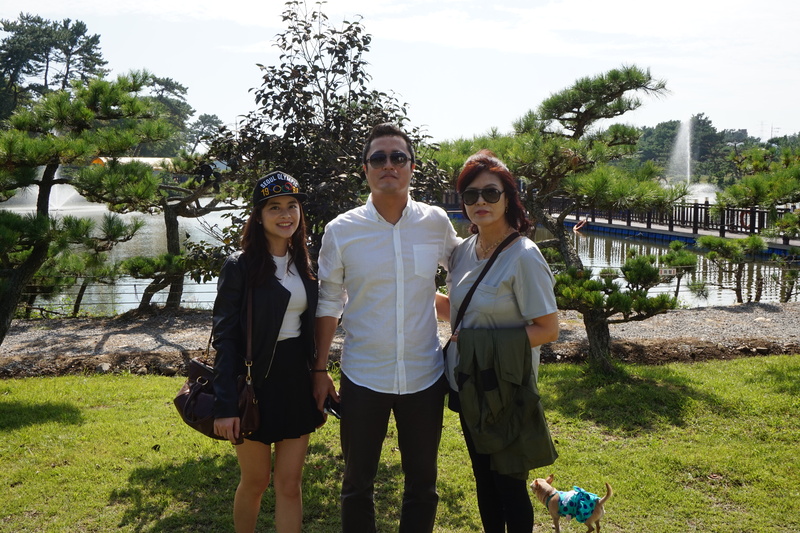 We went on a family trip to Jinhae which is an hour drive away. 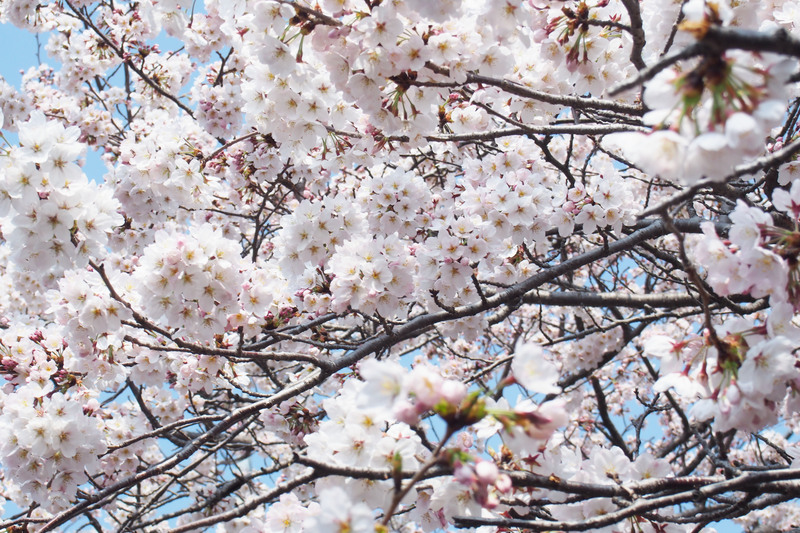 Jinjae oppa ( my bf’s brother ) took day off so that he can bring me there to see cherry blossoms. So kind of him and he is a really cool guy. He is tall , with a stable job at the top life insurance company in Korea , has a bachelor pad and is a really nice guy. Lol..any single ladies out there ? 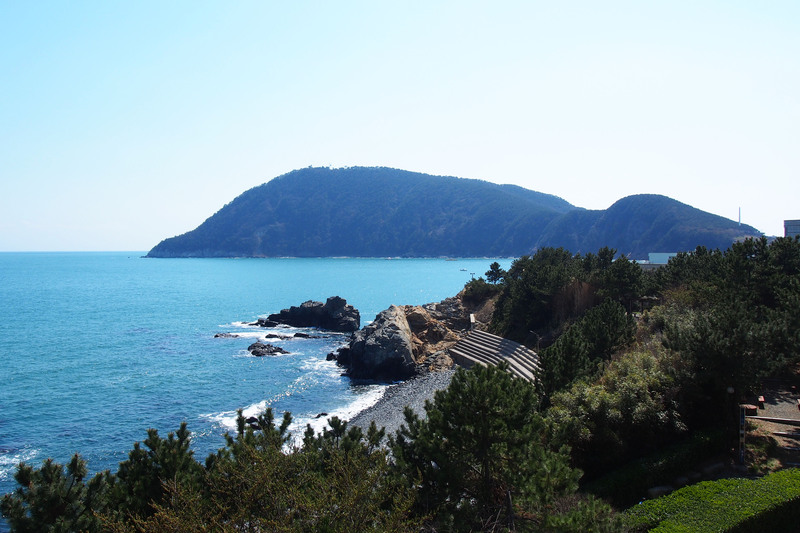 Jinhae is an hour drive away from Busan. 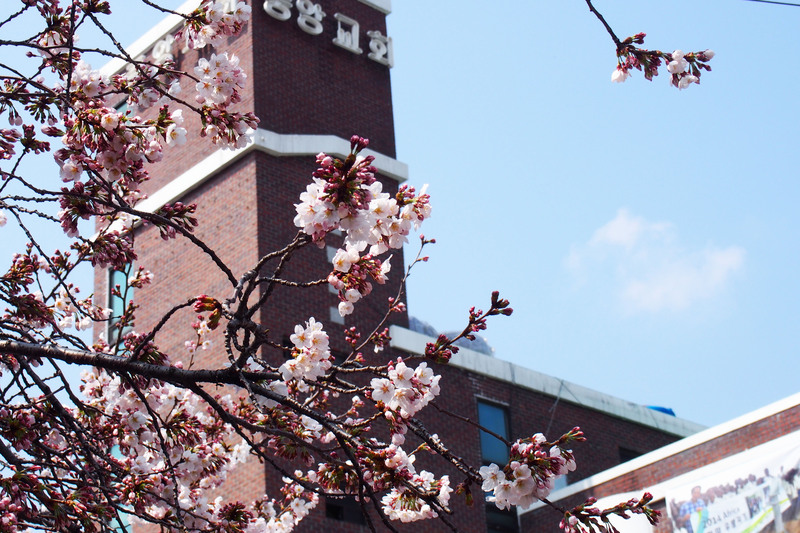 It is famous for its cherry blossoms at Romance Bridge and the railway station. 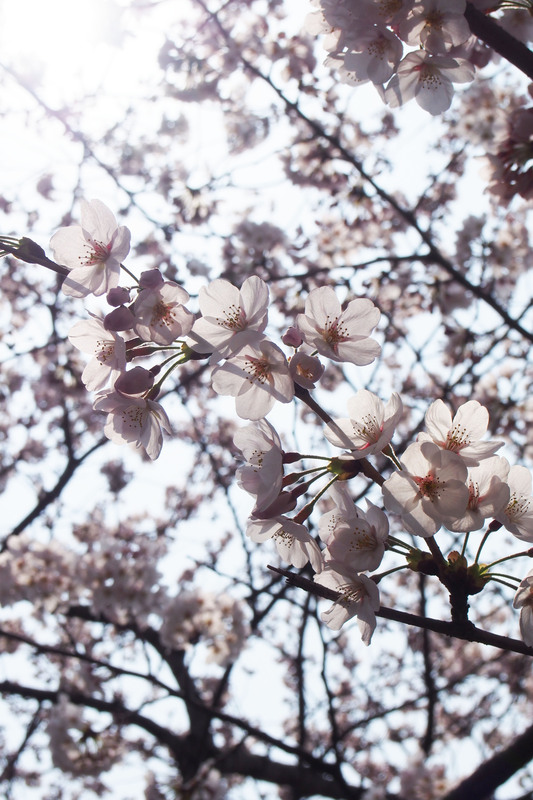 I am really lucky to see full bloom cherry blossoms on that day because after that day , it rained EVERYDAY till the day i departed from Gimhae airport. 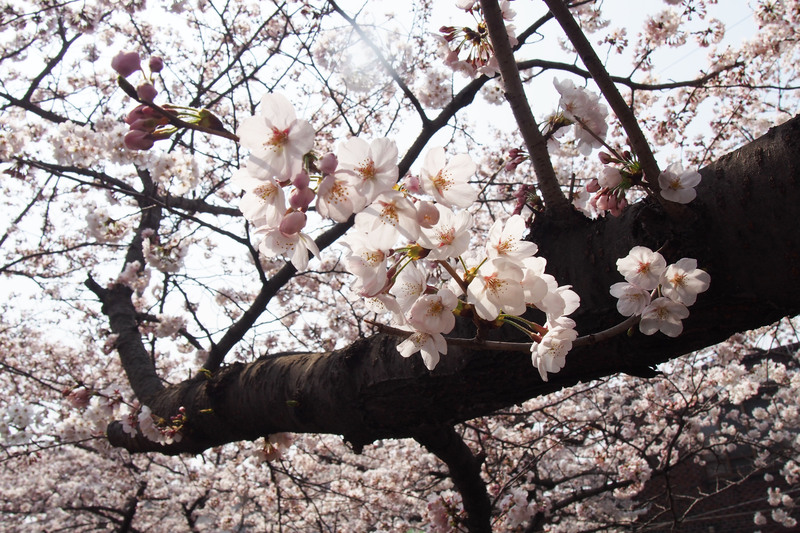 Of cos , you can see cherry blossoms in Busan too. 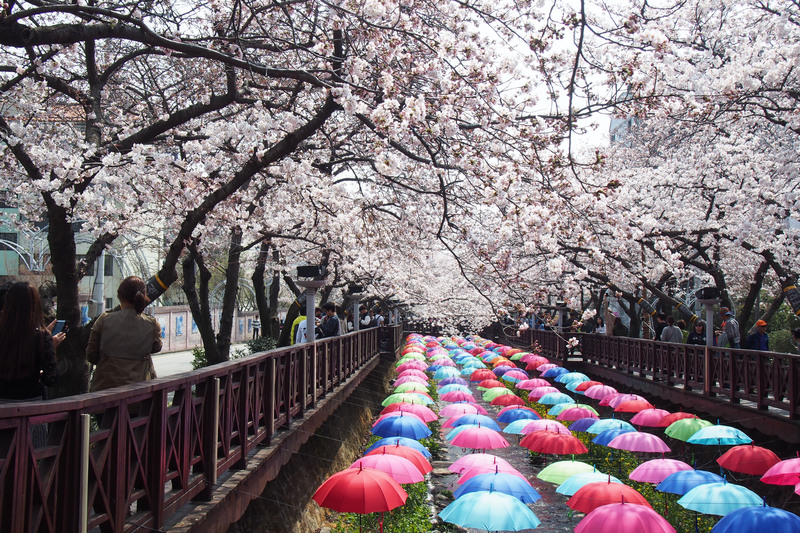 The cherry blossoms lined up along the streets and the best place to see them in Busan is at Namcheon-dong. There is this particular street that looks really nice with the cherry blossoms. 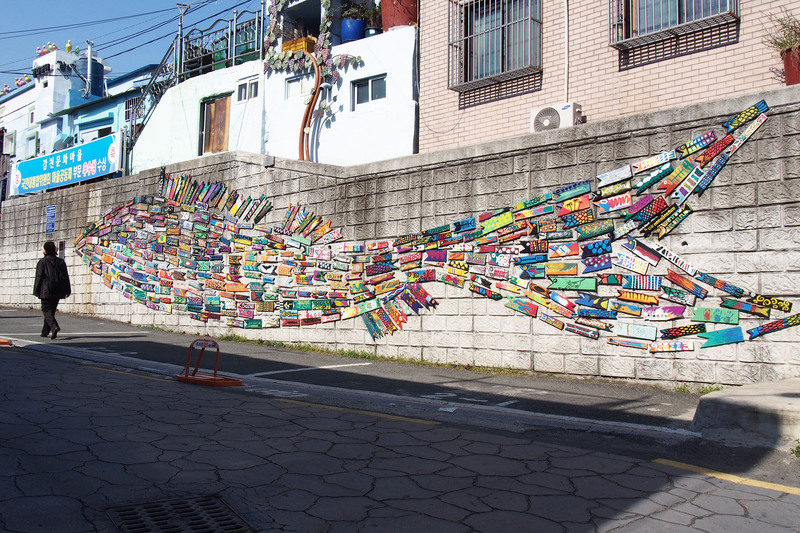 Ok , back to Jinhae. 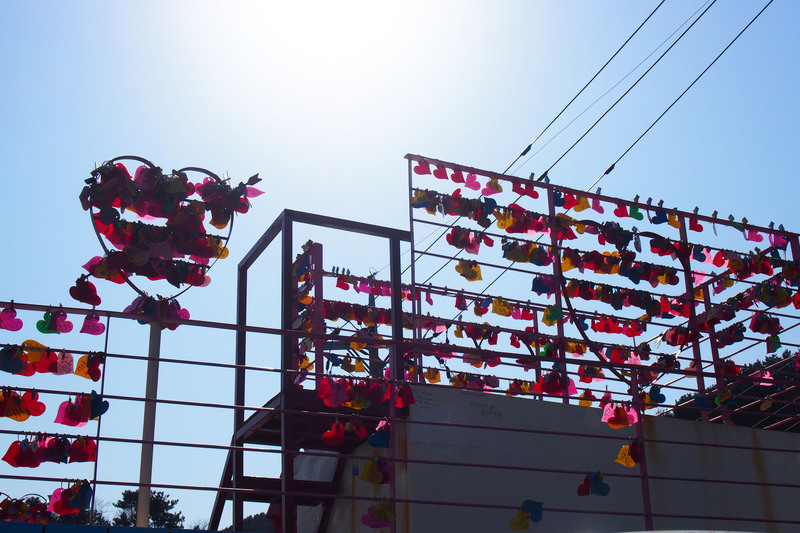 Jinhae is a small town so you can just spend few hours there. We spent like 3 hours there before we went for lunch and back to Busan. 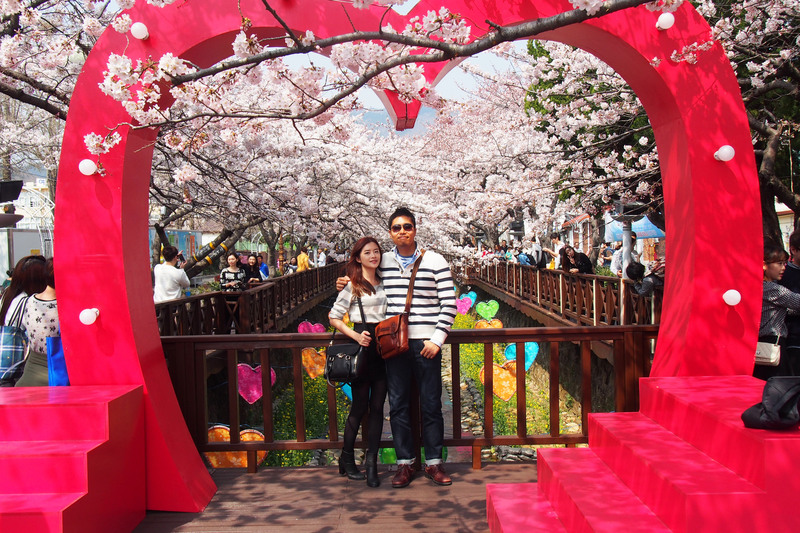 Jinhae is very crowded during Cherry Blossom Festival in Spring . 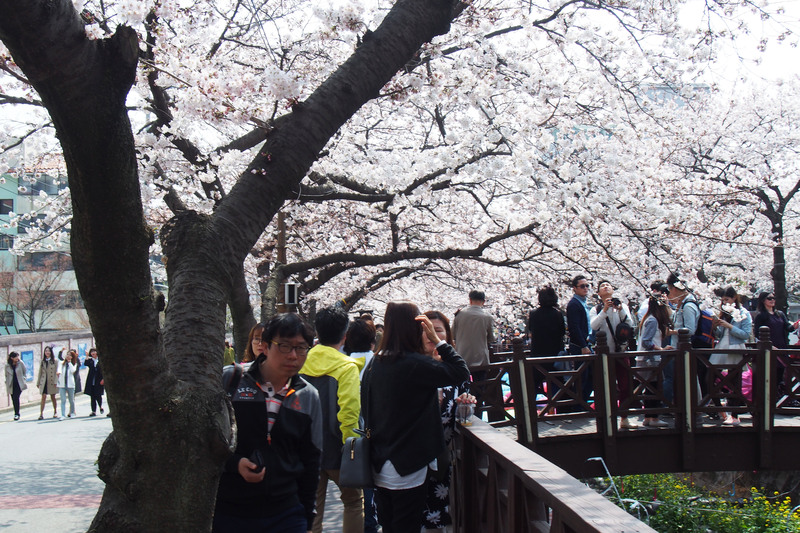 People and tourist flocked here to see the cherry blossoms , have picnic under the trees and take a stroll along the river canal. 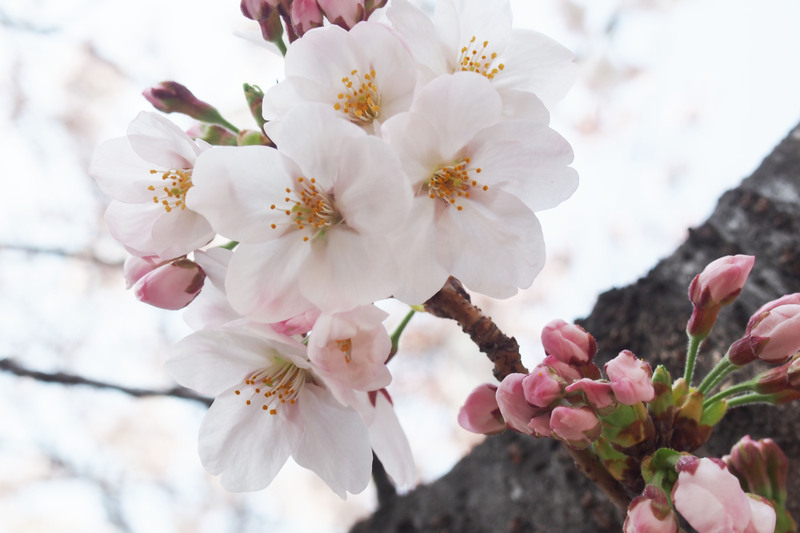 There are both white and pinkish cherry blossoms. All so nice ! And just next to this place is a HUGE mountain. The backdrop looks damn nice. 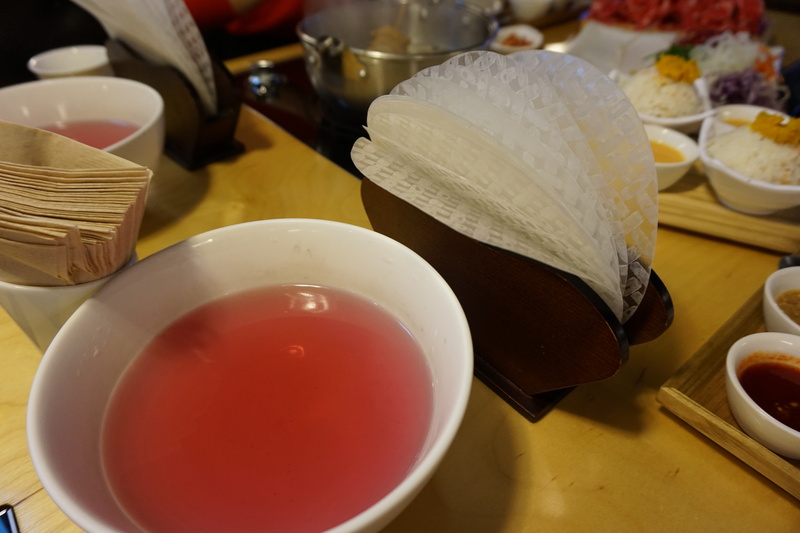 After spending 3 hours taking a stroll and pictures of the pretty cherry blossoms , Jinjae oppa drove us to a restaurant located near the base of a mountain and along the coast for the nicest and freshest live eel bbq ! 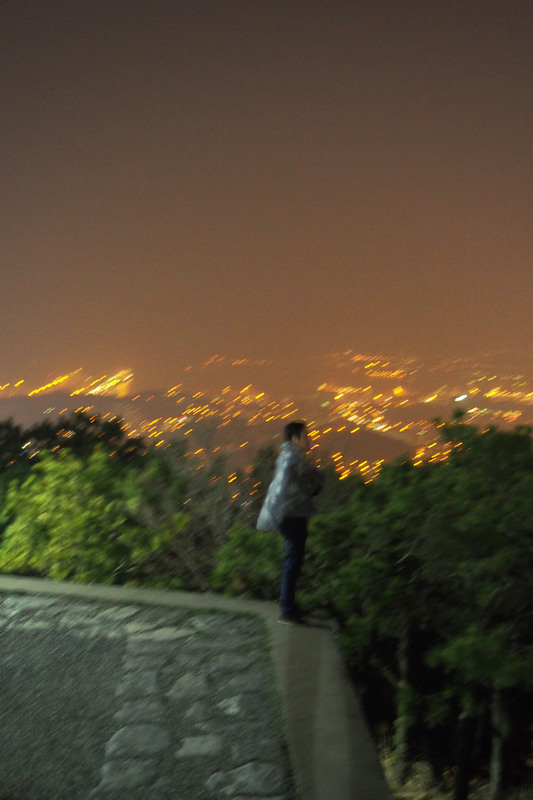 At night , we drove up to Mount Hwangnyeong. It is the best place to see sunset in Busan. But we were at the premium outlets in the evening and can only go here at night. It was very cold. 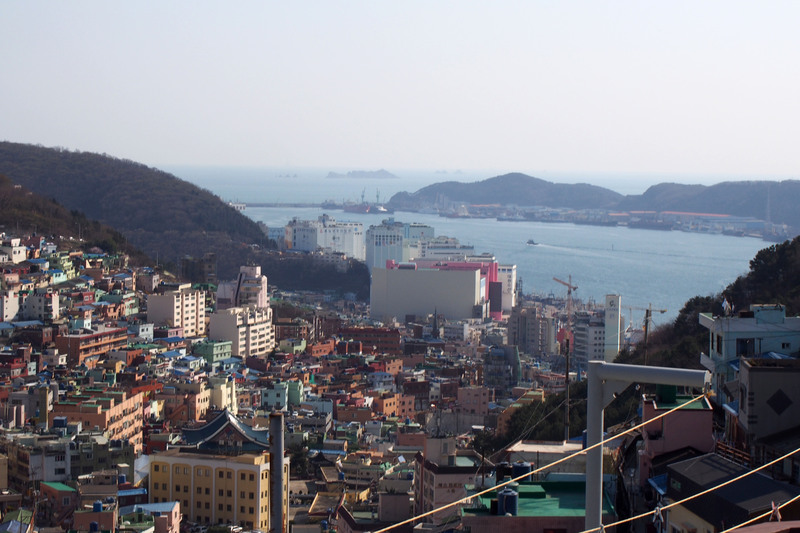 Not only do you get to see beautiful Busan’s sunset here but you can get to see 360 degrees view of the entire Busan. 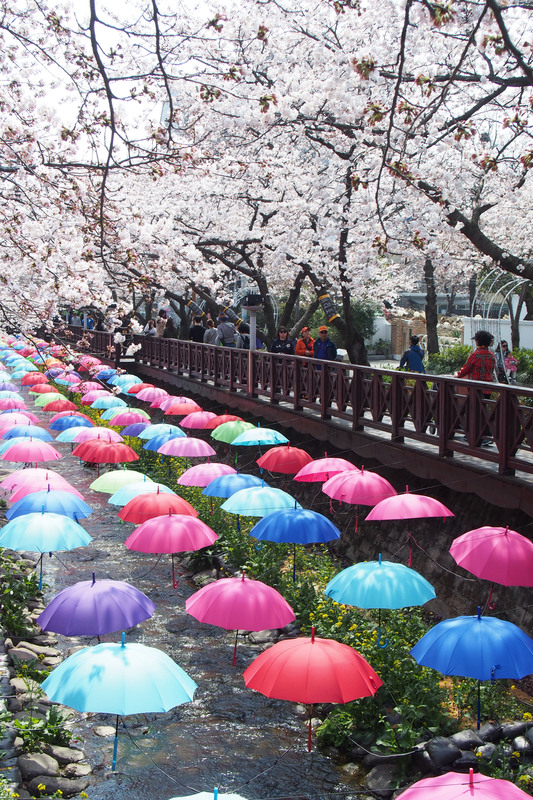 It is located near Namcheon station so you can put your cherry blossoms sight seeing and sunset viewing on the same afternoon. Take MRT to Namcheon station (exit 4) and then take bus number 38 to Hwangnyeong mountain or you can cab there. 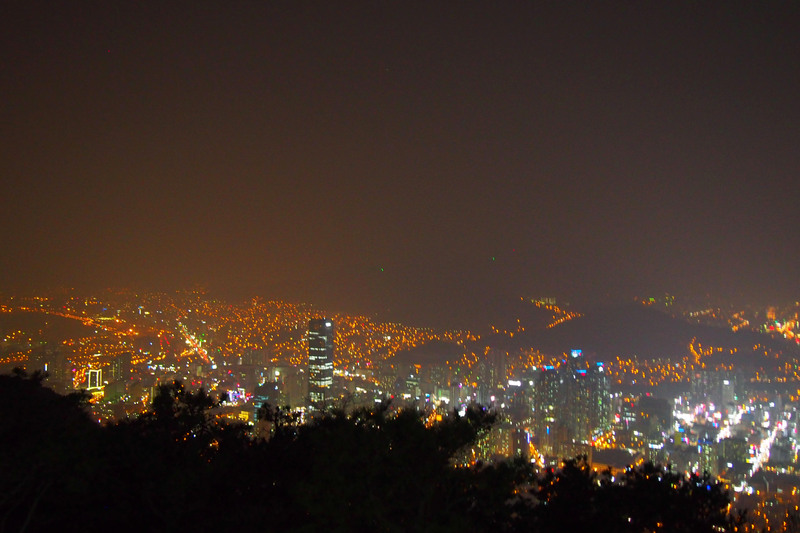 City night view of Busan . 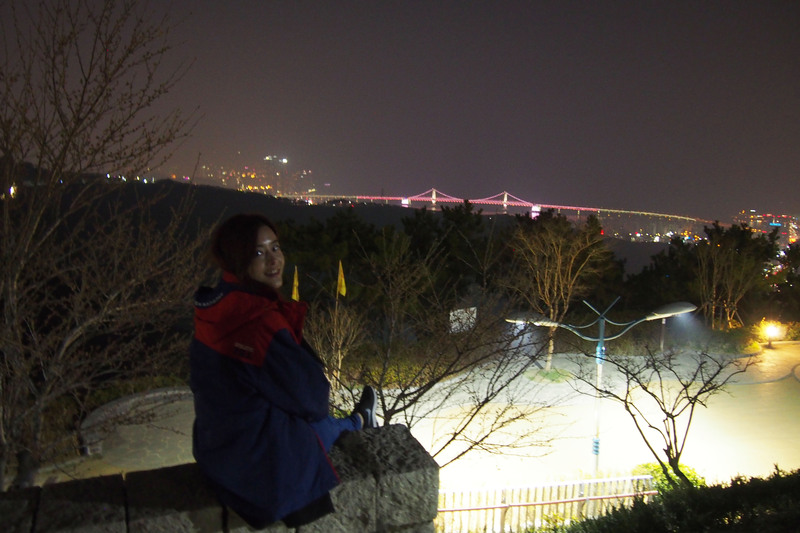 Gwangan bridge is brightly lighted. Jinjae oppa with his fleece blanket because he forgot to bring his coat. We were all cold and hungry. 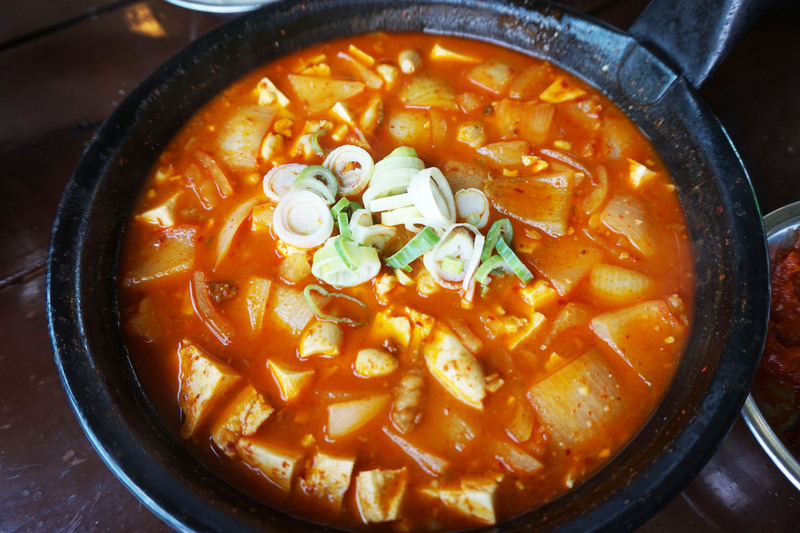 It was 10pm and we went to the famous “Hae Mae Ddokbokki” at Namcheon for dinner. 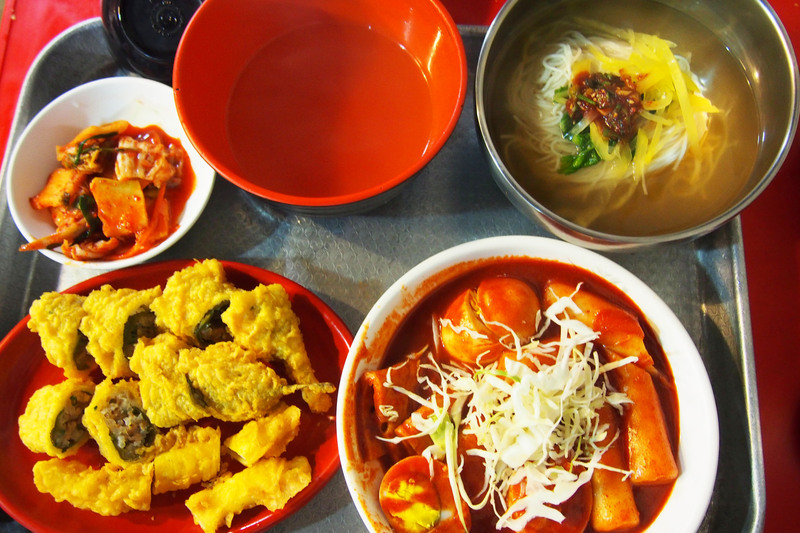 This place is famous for its noodle soup and Ddokbokki. It is cheap and nice. The soup is free flow too. 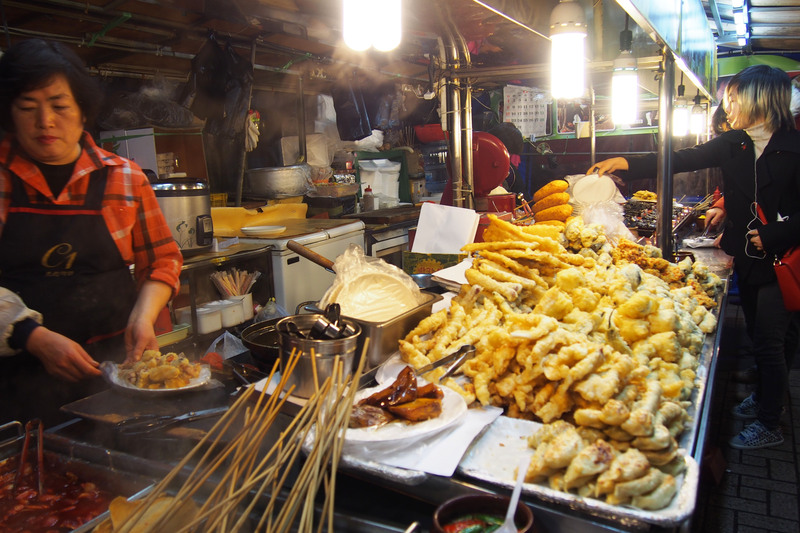 It is a humble street stall located at a back alley. All of us were dead tired and too tired and zonked out once we arrived home in Seomyeon ! I fell very sick the night after i came back from Nampo-dong. I was resting at home and Oppa went to the bank to settle his accounts. I slept through the entire day till Jinjae oppa came back from work and drove us to Oppa’s mother’s motel in Gimhae because it was her birthday. It was terrible. I was vomiting and having non-stop clear water diarrhea. Felt really terrible. My stomach was grumbling and growling sooooo loudly. I think it was stomach flu. 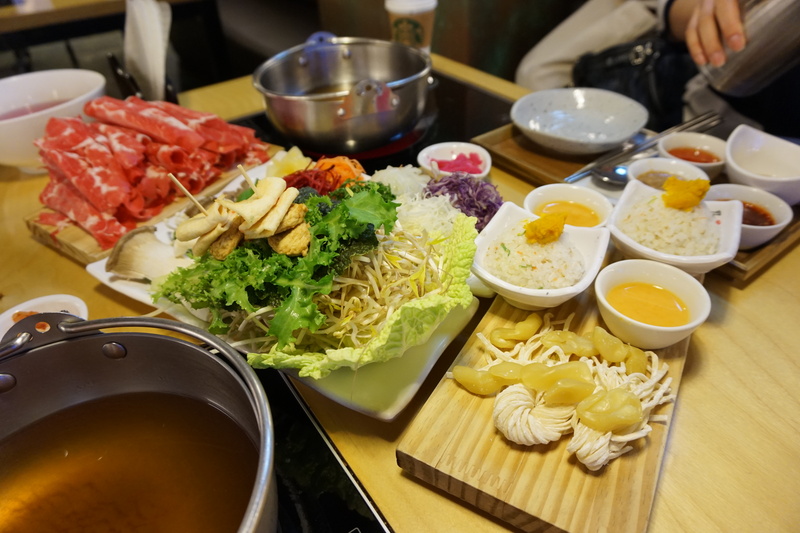 I felt very sorry because it was Oppa’s mother’s birthday and instead joining them to celebrate , having Korean BBQ and cut the birthday cake , i have to sleep and rest in the room. Felt really bad because i vomited right infront of her..but luckily , i found a plastic bag and not messing up her motel floor. The motel housekeeper helped to set up the heating pad on the bed for me , made our room and i just fell asleep after that. 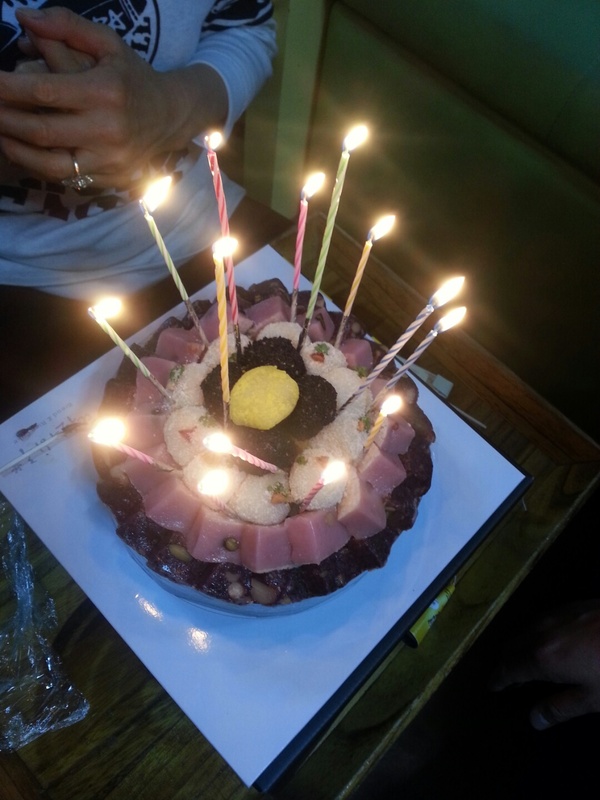 Oppa sent me a picture of the yummy cake 😦 But i can’t eat it. So the next day , Oppa’s mum drove me to the hospital just next door. Because i was too weak to walk , she drove there even though the hospital was just on the next street which is 2 mins walk away. Put on IV dripped , consulted the door who spoke a little bit of English and collected my medication. The price was only KRW 68,000 . I thought i have to pay like hundreds of dollars and i was checking whether i can claim from my insurance. I was really surprised. No wonder Oppa would rather go back to Korea for medical check ups etc because he maybe able to claim from his insurance company and it is also cheaper even if it is non-claimable. I paid SGD 90 at my local GP just opposite my house when i had fever or SGD 60 for a normal flu. I don’t know why but suddenly after i came back from Korea , i felt like everything in SG is so expensive. So for 5 days , i was bedridden , vomiting and having diarrhea the whole day and was too weak to even walk. I can’t eat anything. Whatever i ate just came out. I ate nothing but still i have so much vomit and diarrhea to excrete out. And what’s worst was that it was all clear water. So dehydrated that i only peed once a day. But thanks to Oppa and his mother , i got well pretty fast . She prepared honey drink and porridge for me. I wanted to cook myself but she insisted i should rest and she reminded me daily to not to eat oily food via kakaotalk messages. 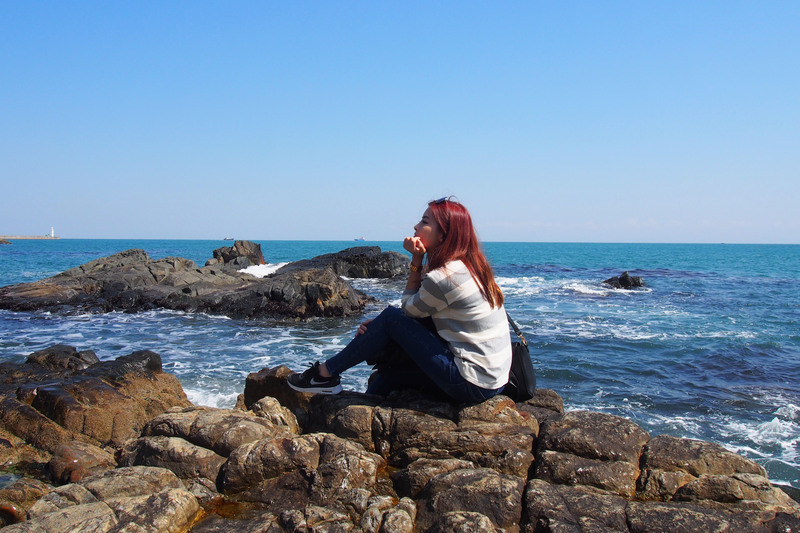 On the 3rd day after i fell sick , i managed to drag my feet to Haeundae beach with Oppa to meet his friend for lunch at his restaurant and a walk to Dongbaekseom (Dongbaek Island) . 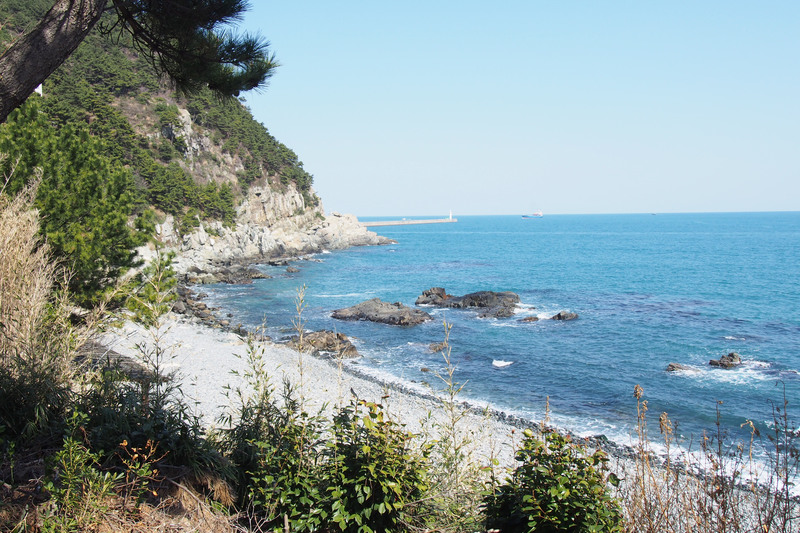 How to get to Haeundae Beach ? Take the MRT line and stop at Haeundae station. The beach front is just 5 minutes walk away. 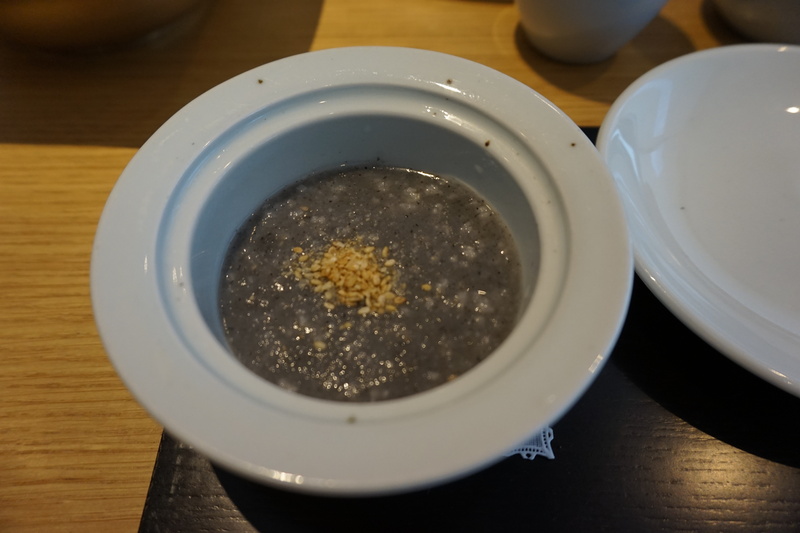 Oppa’s friend’s restaurant specializes in Duae-Ji-Kuk-Bab (Pork soup with rice ) . I had no mood for the food and just drank the soup. It is really nice. 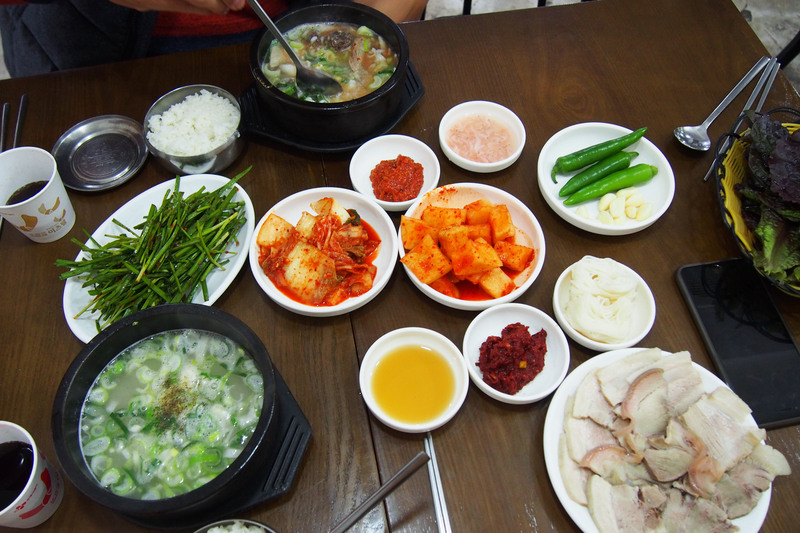 You can find alot of such restaurants selling Pork Soup with rice in Busan. It is just like our Bak Kut Teh but just that there is no peppery taste. After that , we went to starbucks for hot coffee. I wasn’t feeling well and the weather was cold and rainy so i didn’t want to walk along the beach. Too windy. 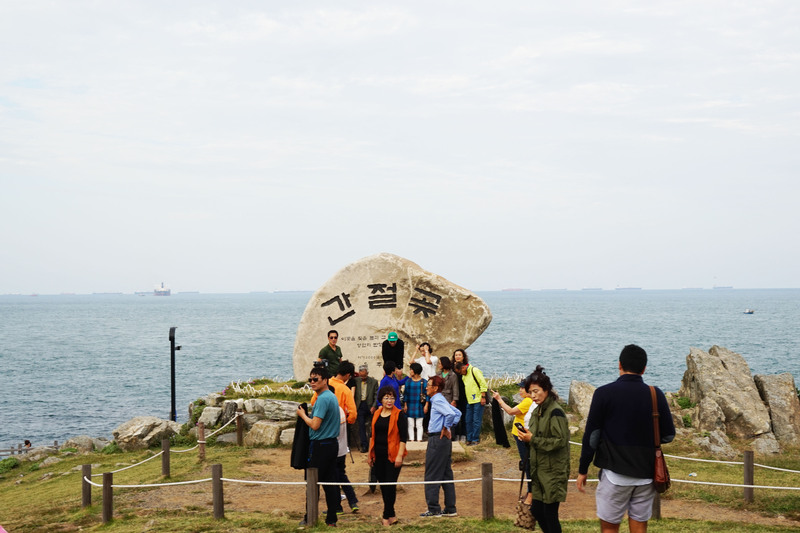 Thereafter , we walked to Dongbaek Island ( Dongbaekseom ) . 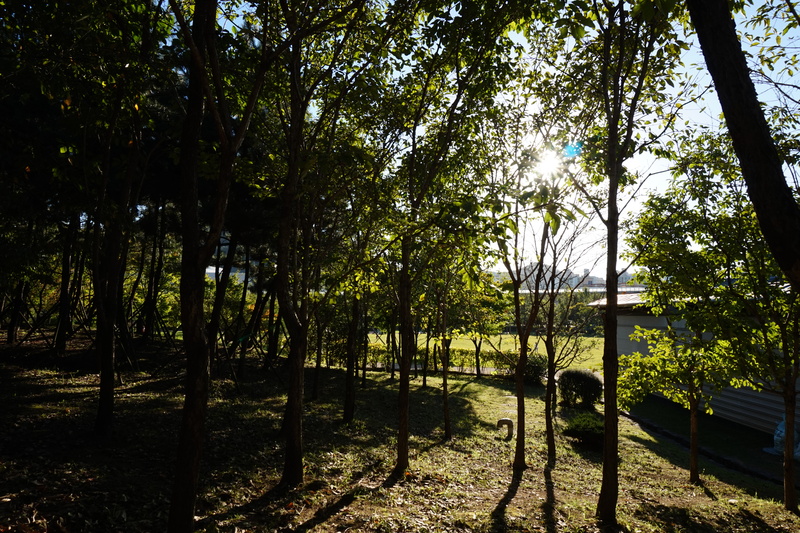 Dongbaekseom Island is a very small island with many Dongbaek trees. 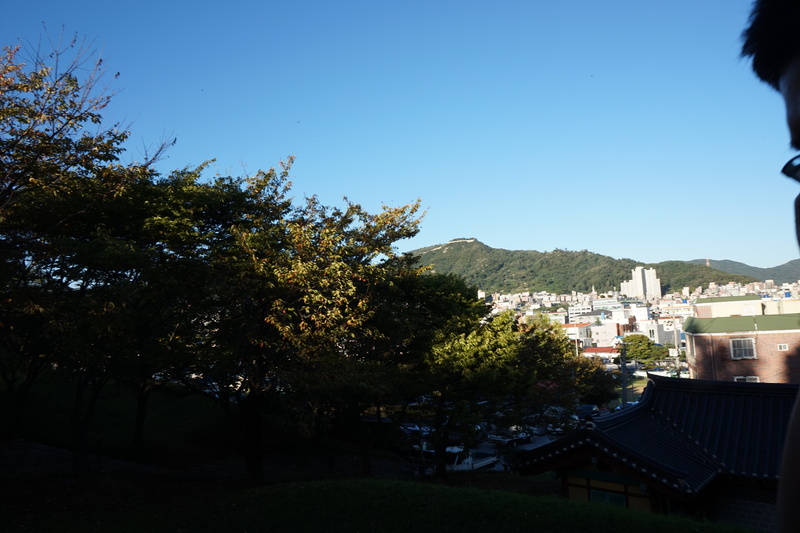 At the top of the island, there is a statue and a monument of a scholar and writer during the Silla Dynasty. It is an island linked to the mainland Busan . 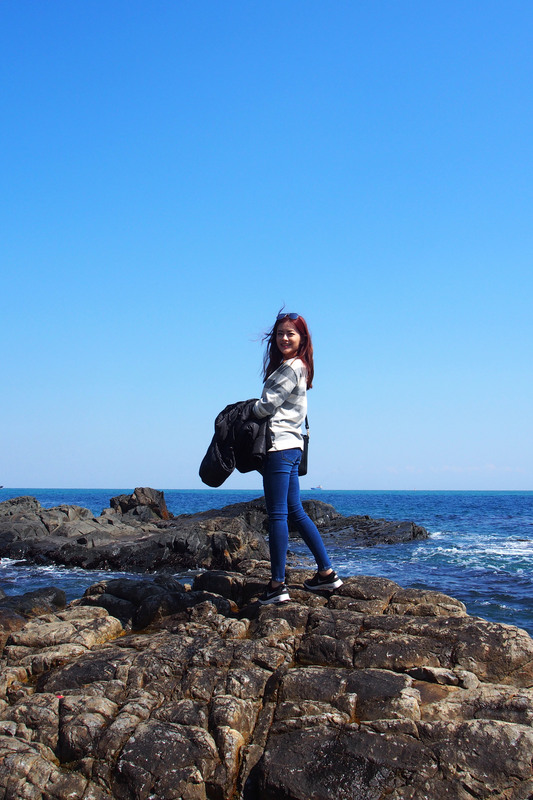 So you can walk from Haeundae beach. 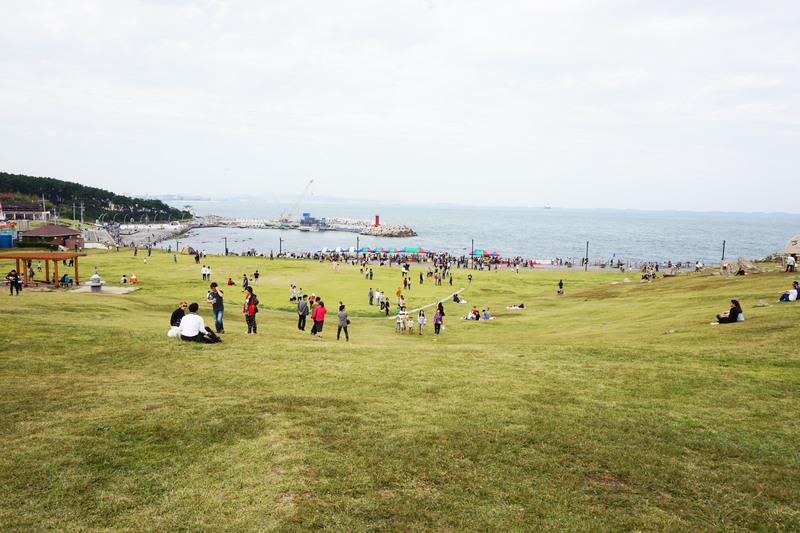 If you are going to Haeundae Beach , you can put Dongbaek Island together on the same day. It is at the right side of Haeundae beach ( you will see The Westin Chosun Hotel ) and further up , there is a bridge/road that links to Dongbaek Island. If weather was good , you can see Oryukdo Island ( “Or” means 5 , “Yuk” means 6 , “Do” means island ). The reason for its name is because depending on the tide and condition of the day , sometimes it looks like 5 island and sometimes looks like 6 islands. It is a rock island that was made purely out of stones. 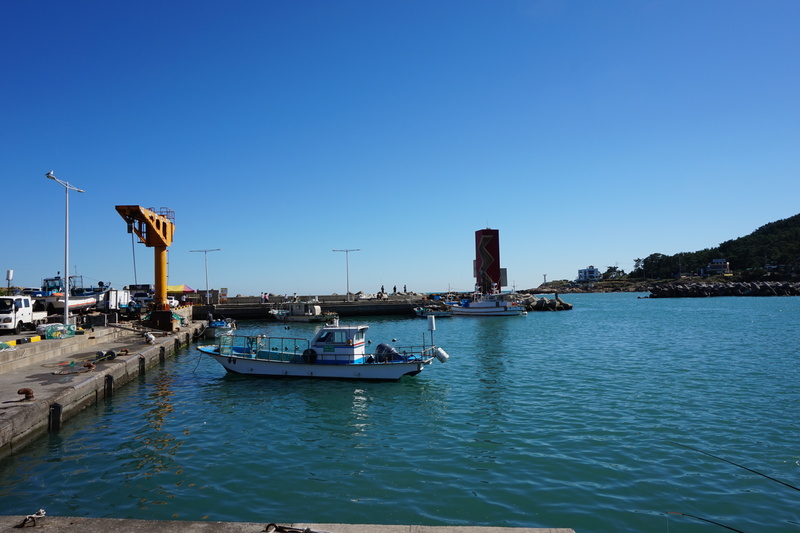 You need to take a ferry tour around the islands from Haeundae. 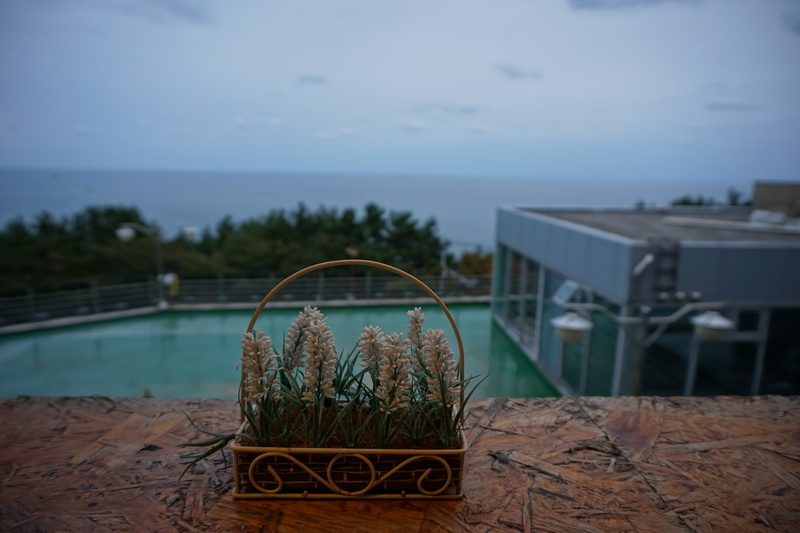 I didn’t manage to take pictures at Dongbaek Island because it was raining and windy and i wasn’t feeling well. So i totally have no mood to take picture and just want to go somewhere warm. We took at cab later to Centum City Shinsaegae. The world’s largest shopping mall. It was sooo huge ! Don’t even have the mood to shop because i kept going to the toilet to vomit. We ended the day early and went back to Seomyeon to rest. Next day , Oppa’s brother cooked yummy spaghetti for our breakfast before we head to Sajik baseball stadium. 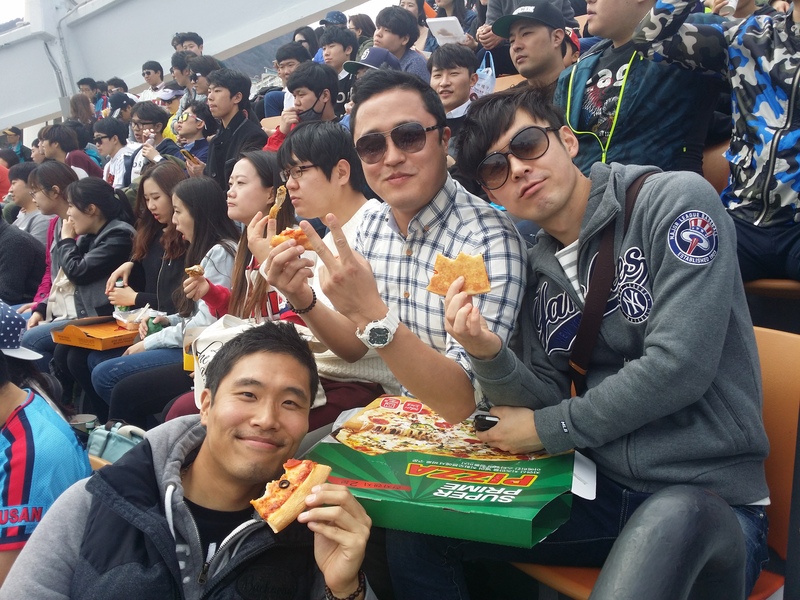 Before that , we went to the nearest Lotte Mart to buy beer , coke , water , pizza and fried chicken. My condition was 60% and the smell of any oily food makes me nausea and feel like want to vomit very badly. By then i already lost alot of weight lol. My arms were like stick. I was 51.5 kg before and after fell sick , my weight dropped to 47kg. Wearing the old Lotte jersey and ready to cheer for the team at Sajik Stadium. 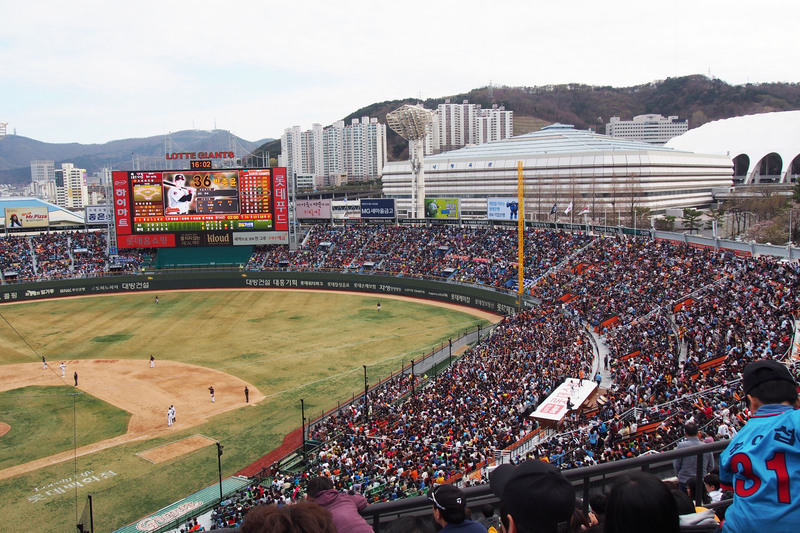 Sajik stadium is home ground for Lotte Giants which represents the Busan team. 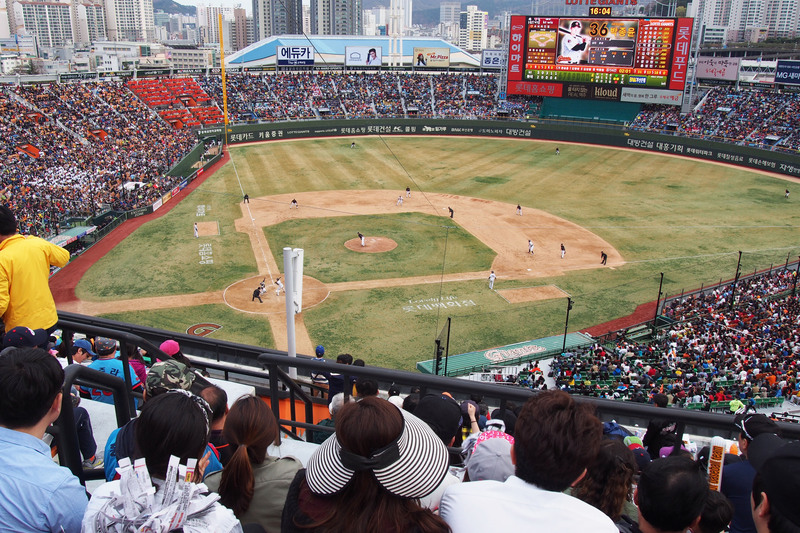 You have to buy the ticket inorder to watch a baseball match. You can buy and book your seats online or at the stadium main entrance. Full house. First game of Spring. Baseball matches were stopped in Winter and only resume in Spring to Autumn. 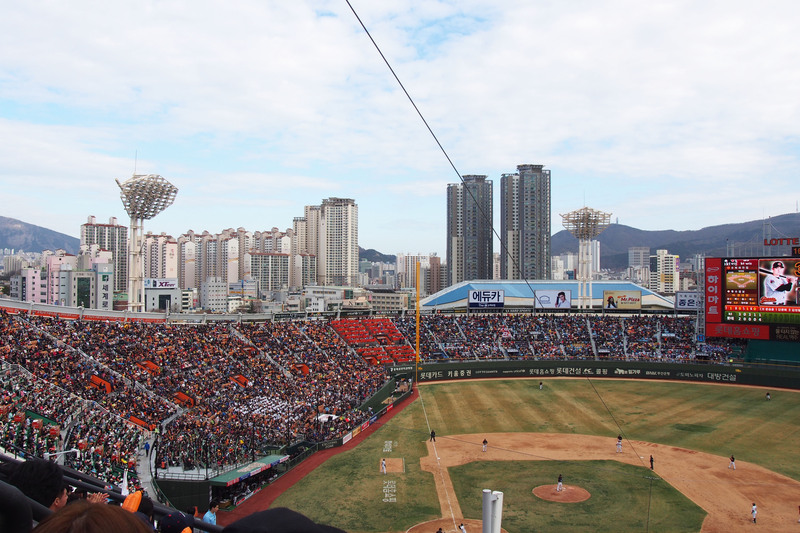 Chants of Lotte Giants cheer everywhere. I posted a video on my instagram. My 3 bodyguards who took care of me when i was sick. My bf , his brother and Soobin his best friend. After the baseball game , we went to Haeundae beach for dinner and met all of Oppa’s high school friend. We had 2 rounds of dinner. 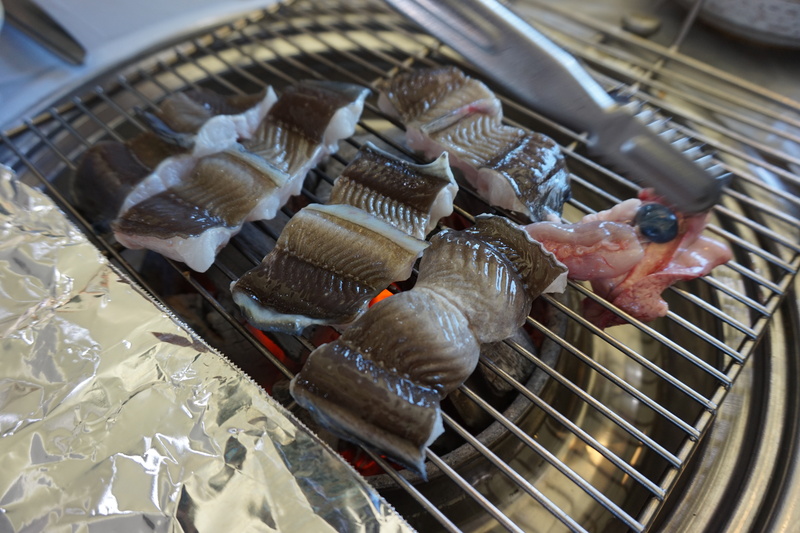 BBQ live eels with soju and beer and 2nd round was Kimchi jiggae and other food. Whole thing ended at 3am and we were dead tired. Soobin Oppa booked a sea view room at Novotel Haeundae Beach for me to show his appreciation and thanks when he came to SG last year. 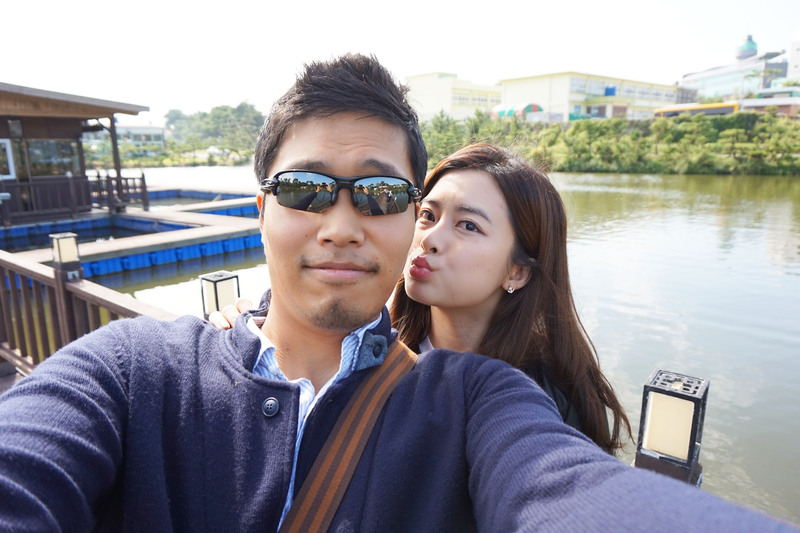 I accompanied him everyday to all tourist destinations in SG for 4 days. And we attended a baby shower. This is the first time i attended a Korean baby shower. Things were abit different compared to Singapore style baby shower. 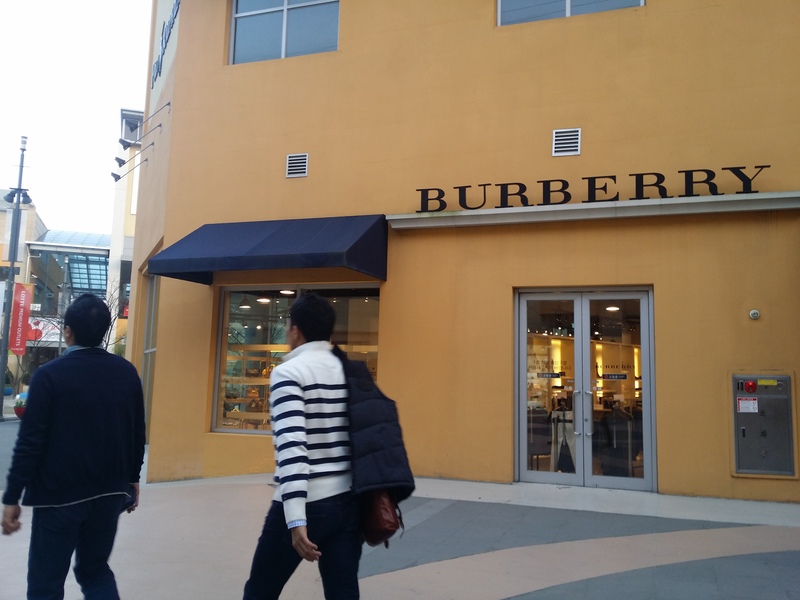 After which , Soobin Oppa brought me to Busan Premium Outlet. But i wasn’t in the mood to shop because i wasn’t feeling good. So the next day , my bf’s bro brought us back to Lotte Premium Outlet in Gimhae to shop after i felt better and my condition was 90%. These 2 outlets are 2 different locations. 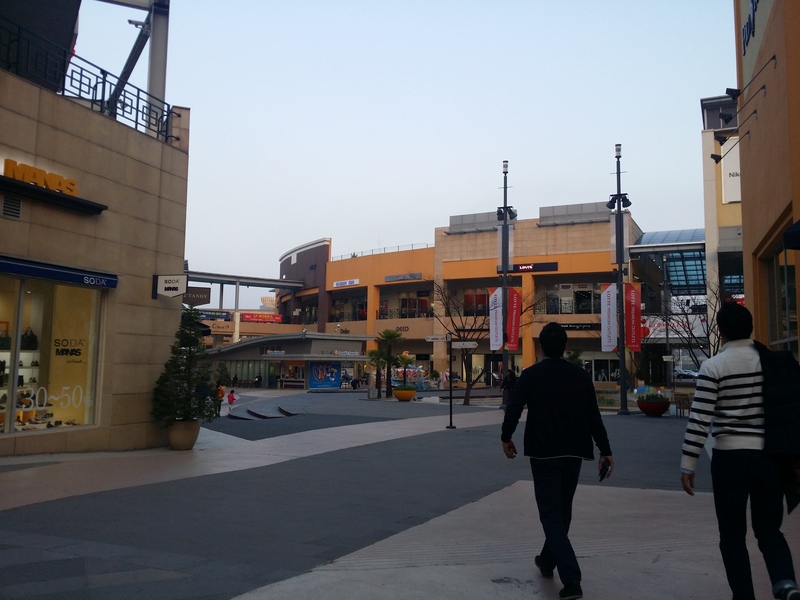 How to get to Busan Premium Outlet ? Take MRT to Jangjeon station and then take bus No 1008. Bus ride takes about 1 hour. Take bus No 37 from Busan Bus Terminal . Journey is about 1 hour. Im not sure if there were any changes made in the bus route so it will be better for you to check and confirm at the MRT or bus terminal. This place is REALLY ulu..like in the middle of nowhere suddenly pop up a HUGE premium outlet. Apparently the one in Busan is Asia’s largest outlet. 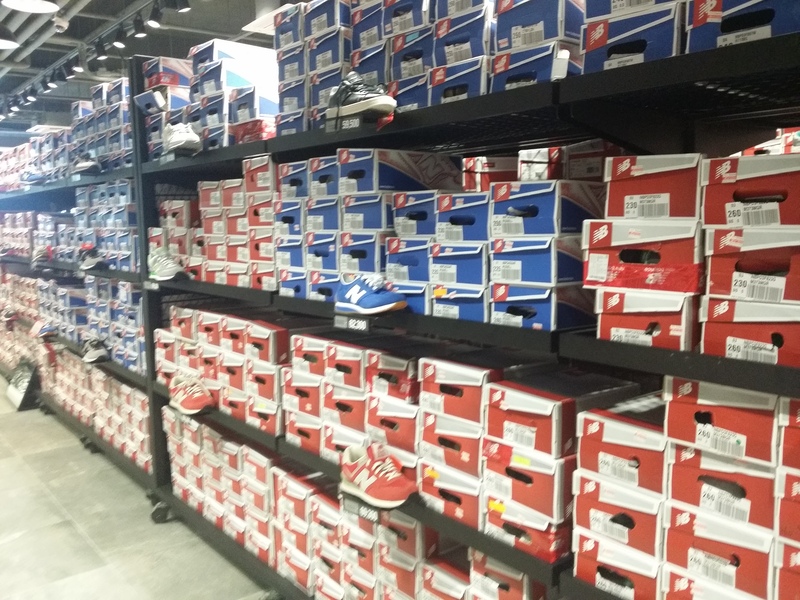 It is a shopping heaven for men because you can buy alot of sports related stuff at outlet price ! Nike , Adidas , New Balance , Reebok , Taylor Adidas etc etc. And if you are traveling to somewhere cold , you can buy North Face jackets at really cheap price at less than SGD 300. A North Face jacket usually cost more $500. For the ladies , you can shop at Roxy , Quiksilver , Michael Kors , Coach , Burberry and any other luxury brands or Lotte Mall for cosmetics and branded stuff like Burberry , Jill Stuart etc etc. The one at Busan has a Lotte Mall and Lotte Mart. 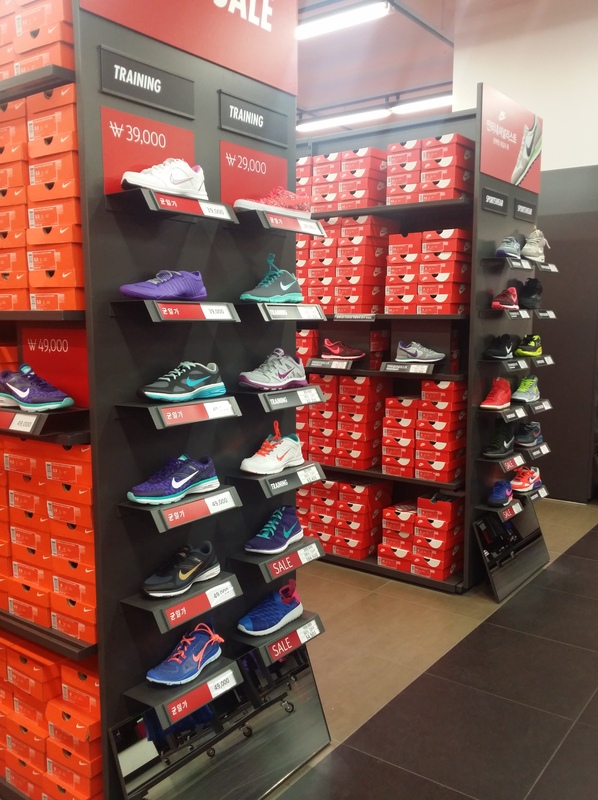 The Nike and New balance shoes are dirt cheap ! I was tempted to get them but i resisted the temptation. I got a pair of Nike sneakers ( white colour with magenta colour Nike ✓ logo ) for only $40. Oppa’s bro bought it for me. Don’t worry , sure have your size. Take your time to shop. Look at the number of boxes of stocks. I got this pair of New Balance shoes below 1.5 years ago at KRW 99,000 and it is only KRW 39,000 at the outlet. There are alot of selections. 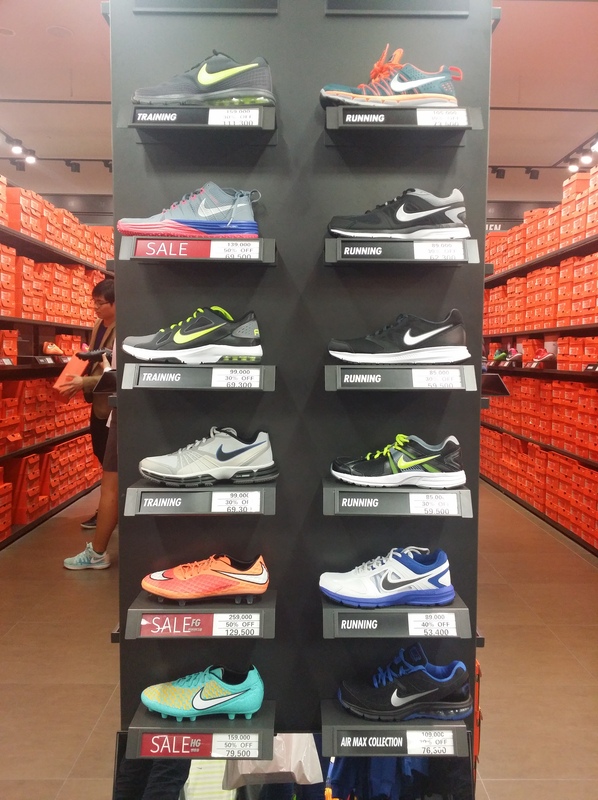 Not only shoes , but you can find sports wear , equipments or whatever. 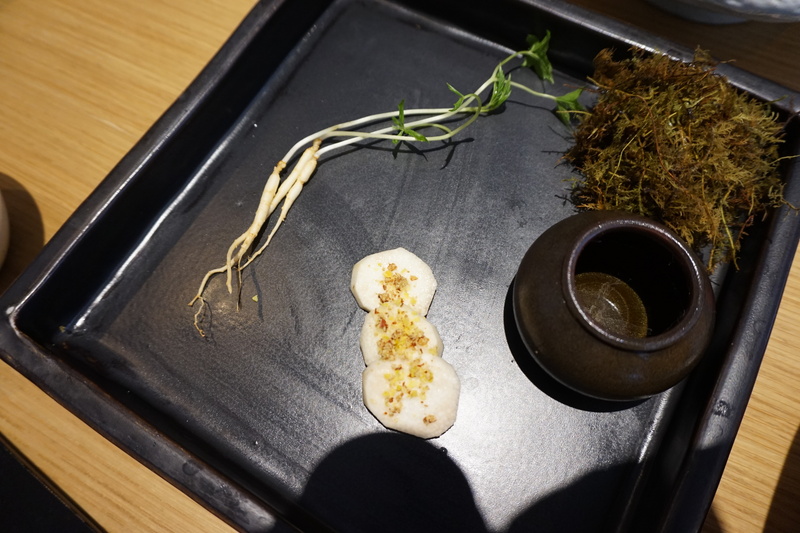 We went to the one at Busan and another one in Gimhae. 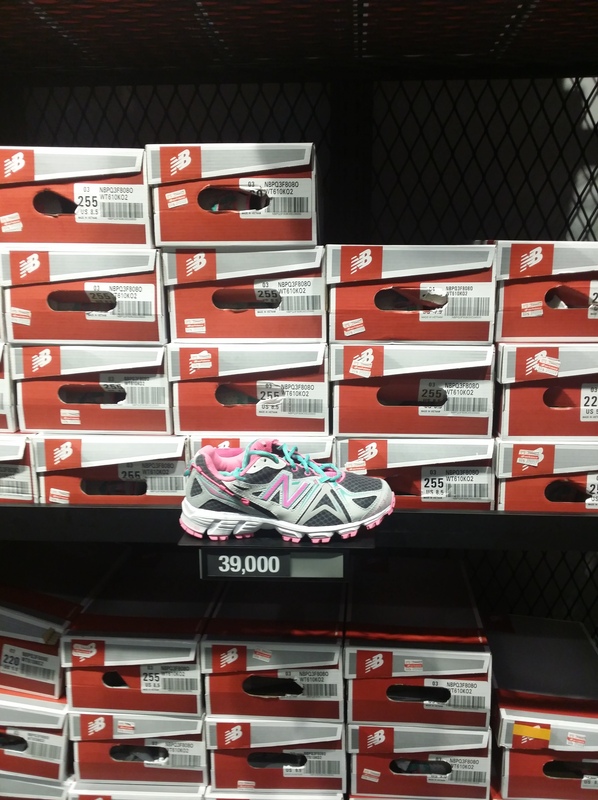 The one in Gimhae is cheaper and has more selections for brands like Nike , Adidas , New balance and Reebook as compared to the one in Busan actually. The one at Gimhae is very near Oppa’s mother’s motel. No wonder she said she goes there often. Tourist Tax Refunds are available and you have to tell the cashier you want tax refund. Then they will give you the envelope and tax refund slip. 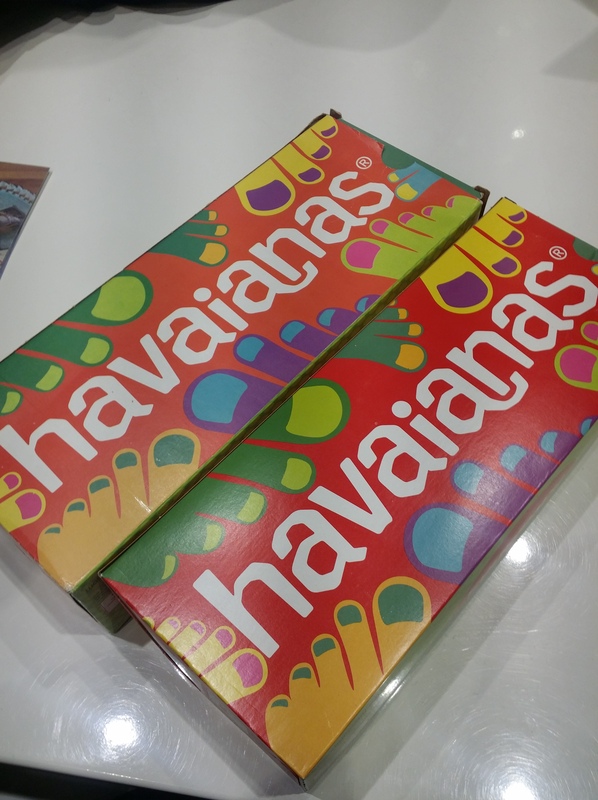 I bought 2 pairs of Havaianas at Busan Premium Outlet’s Lotte Mall. 2 Pairs for only KRW 48,300 after 30% discount. It was cheap even before the discount. One pair in SG is already SGD 59.90 for one with design and the basic one is already $39.90. I got a hot pink basic one with thick straps for KRW 21,000 and $27,300 which is about SGD 60. A good time for me to buy because my dog bite and snapped my havis and im currently wearing a slippery $5 cotton-on slippers. Samsonite luggages there are 30% cheaper too. A handcarry pull luggage is less than KRW 300,000 . Guess who bought the most things ? Not me but Oppa’s brother. It was night time . 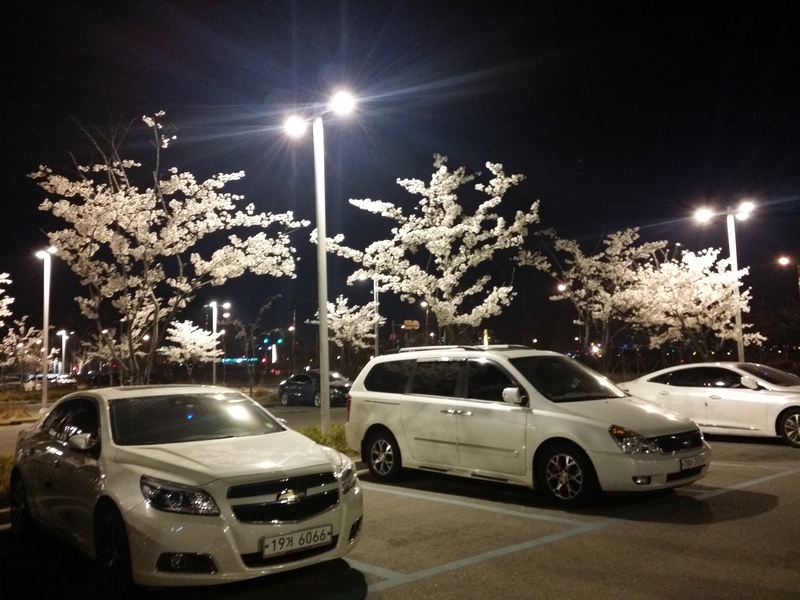 Look at the cherry blossoms glowing at night under the street lights. Walking to Oppa’s car. The weather was really good and we had alot of fun probably because my condition was better after i stopped vomiting and having diarrhea. We had a long day and were so tired. Totally knocked out after that. 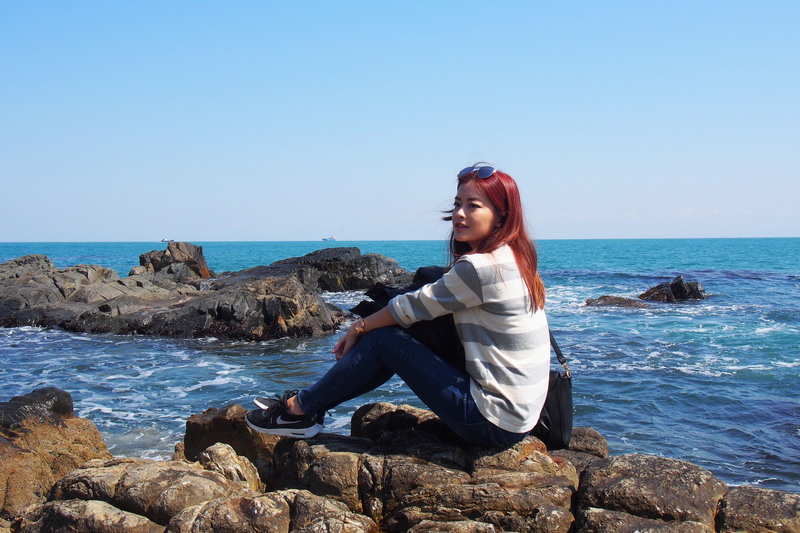 Another update on my trip to my boyfriend’s hometown in Busan , South Korea. 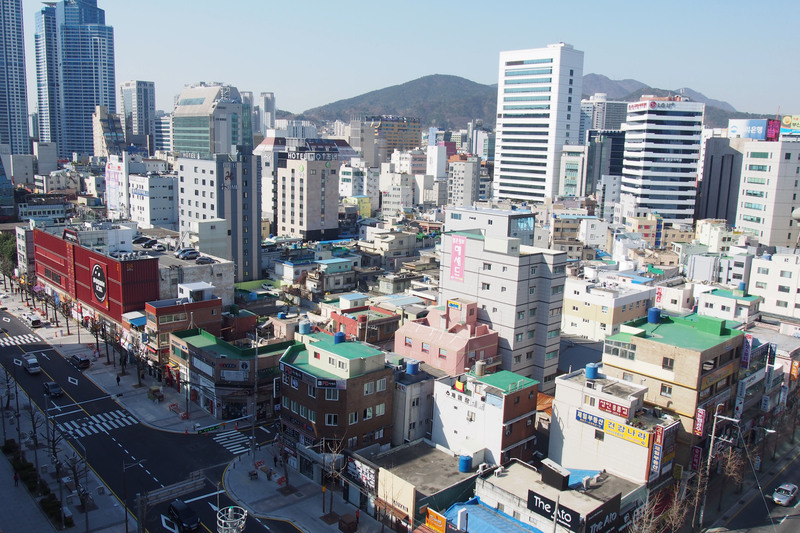 Every morning , i woke up to the view of Seomyeon shopping and medical street. The other side is the view of mountains. The air was so fresh and the breeze was abit chilly though cos it was end of Winter and it was really cold. Freezing at 8 degrees and sleeping on heated bed every night. As you can see the trees were bare from the winter chill. 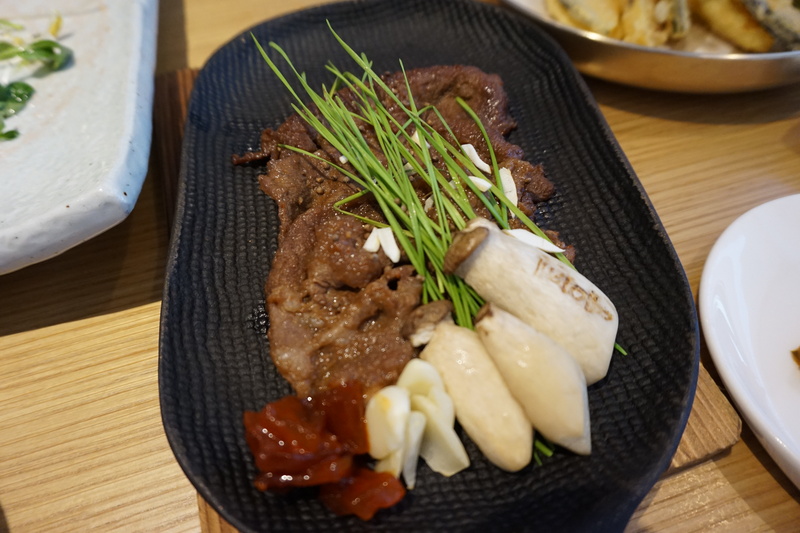 So in the previous post , i blogged about shopping at Seomyeon shopping and medical street. Take the MRT and stop at Seomyeon station and when you come out from the gantry , you will be greeted with lotsa fashion shops and beauty shops like Innisfree , VDL , Clio Professional , It’s skin , Etude house , The face shop , Nature republic , Espoir , Holika Holika , Aritaum etc etc. Whatever brands you can think of that are Korean. The salesgirls in the clothing shops are not very friendly to foreigners. So it will be good if you can speak abit of Korean. And if you can speak and understand Korean , they will also be very aggressive in pushing their sales. Oppa and i spoke in English abit and the salesgirl wasn’t that friendly and i was not allowed to try the top. When we switched to speaking in Korean , the attitude changed. Suddenly become friendly. You will see staircases at the sides , go up and and it is the street level filled with more beauty and fashion shops. The shops at street level are bigger but scattered everywhere. So it will be troublesome for you to compare prices, colours , sizes or whatever you need to compare and hesitate about. If you shop underground , the beauty shops are side by side or just opposite each other. So it is easy to move around the different brands and get everything one shot. There are more fashion shops underground than at street level. We went on a trip to Oppa’s University with his mother. Yup , we were greeted with this beautiful beach/view which is just right in front of his faculty block. I was told this is the place where campus couples usually go on quiet dates and students have picnic here in summer. Imagine sitting here and reading your school notes. Weather was pretty good that afternoon before it suddenly turned soooo cold at night. Checked the weather forecast and it was supposed to be cooling (18-23 degrees celsius ) instead of cold and windy. So I brought bandage and skater skirts , dresses , stockings and high waisted pants to be paired with crop knit tops but i ended up have to buy a new top and new pair of jeans because it was too cold. To be in fashion or keep myself warm ? I prefer to be more practical and that was to keep myself warm. So i borrowed the puffer coat from Oppa’s mother. I only brought a trench coat , denim crop jacket and a biker rider jacket. This is a great place for photoshoot. Found lotsa secret places for photoshoot and if only it was summer , i could have done my shoots here. I got my top from TOP 10 and jeans from one of the shops at Seomyeon underground shopping strip for only KRW 29,000. There are alot shops selling ripped jeans in Seomyeon. I wanted to get more but i don’t wear jeans in SG and it will be waste of money to buy all the colours i want to even though they are so pretty and chic ! So , i only got one pair. Im wearing size M . Their sizing are reallly small. I even wear size 28 for some Korean jeans. The view was beautiful and noon sun was great before the weather turns cold late afternoon. 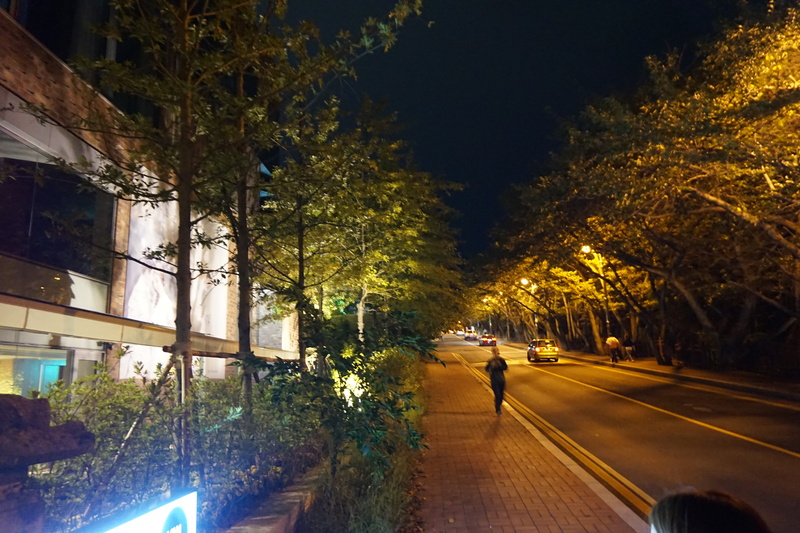 After visiting his University , Oppa’s mother drove us to Gamcheon Cultural Village. It is like Italy’s Cinque Terre where you see colourful houses on the mountains and cliffs overlooking the sea. 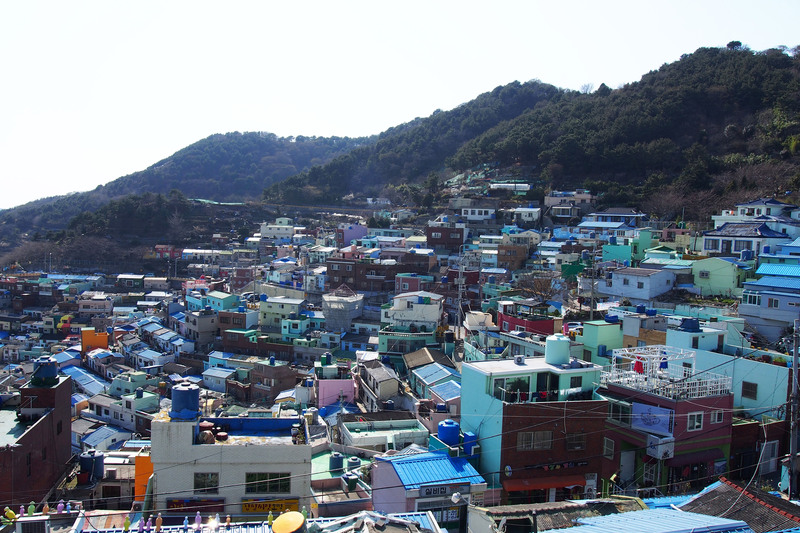 Gamcheon Cultural Village is just like Korea’s own version of Cinque Terre. Over here , you can get to enjoy cool and breezy view. And also learn more about Korean’s way of living back in the 1960s and when it is still not a developed country. There are alot of phototaking points where you can go up to the roof tops to take picture and enjoy the view. 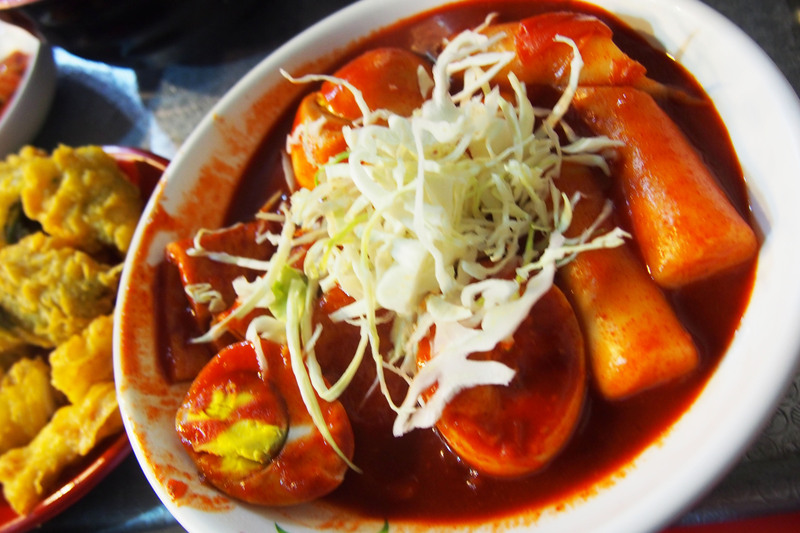 If you are hungry , you can grab abite at the cafes or road side stalls selling hotdogs , spicy rice cakes and grab a cup of coffee if you feel cold. Roof top on one of the cafes where you can write love notes and pin it on the railings. Everyone was queuing up to take picture with this statue. I was on of those who queued for it too lol. It ain’t scary as you think it is to sit here and take a picture with this little guy ! Oppa’s mother was feeling abit tired and cold after the long drive and walk . So we stopped by one of the cafes to have a coffee. There are alot of French themed cafes here. 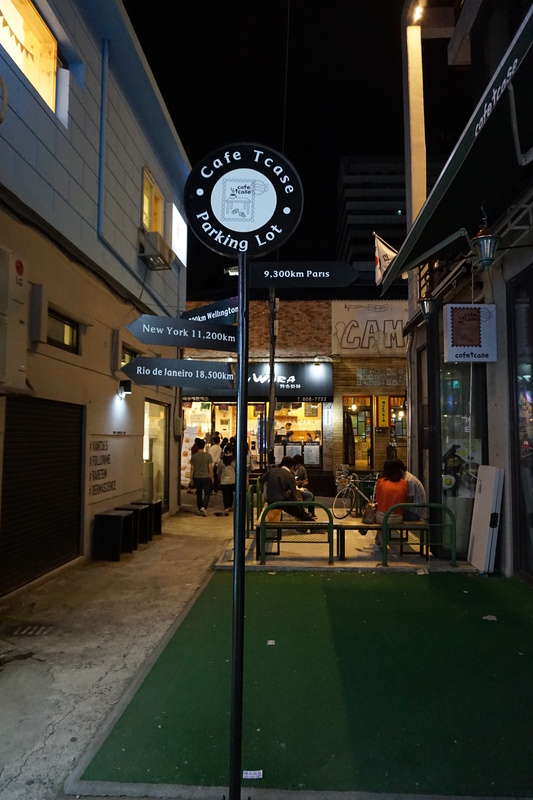 I realized that alot of Korean cafes are very French themed. Eg. 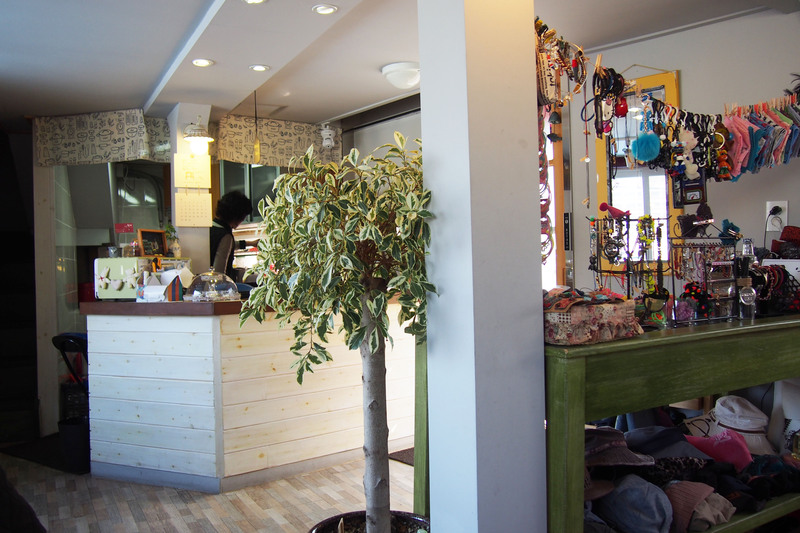 the interior designs and music they played in the cafes. You can buy sovenirs in the cafes but i think they are too expensive and over priced. After Gamcheon Cultural Village , we went to Nampo-dong shopping street. Nampodong Station (Busan Subway Line 1) . 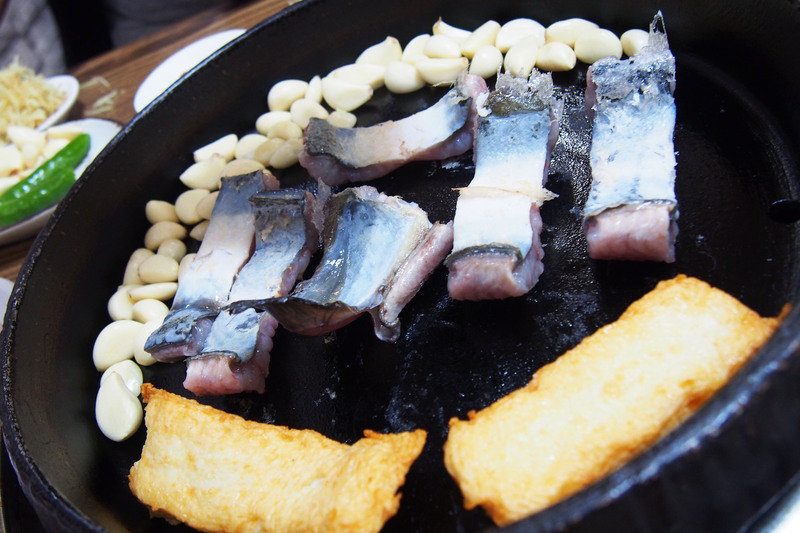 You can put Gamcheon Cultural Village , Nampo-dong shopping street and famous Jalgachi fish market all in one day. 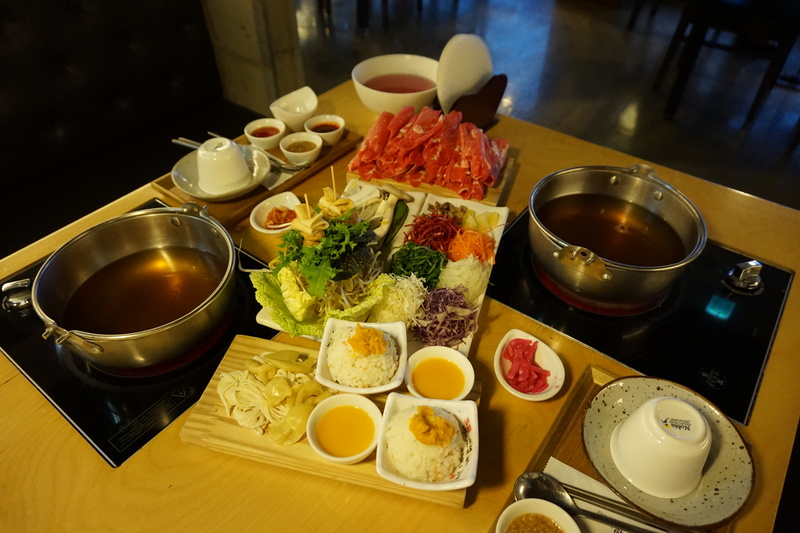 Because Gamcheon Cultural Village is just 10 minutes drive away from Nampo-dong and Jalgachi fish market is just next to Nampo-doing shopping street. 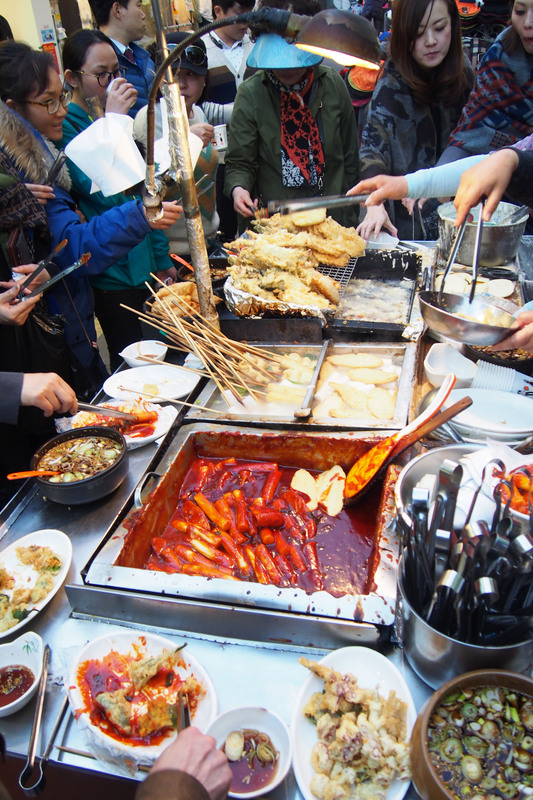 So you can have lunch at Gamcheon Cultural Village or light snacks there , shop at Nampo-dong and then dinner at Jalgachi fish market. 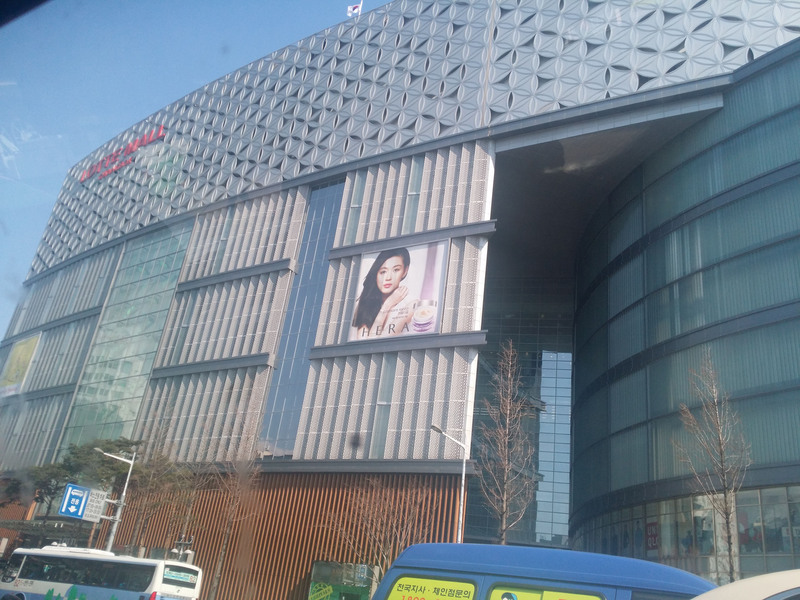 Also a super huge Lotte Departmental Store is located at Nampo-dong. You can do all of them in a day. 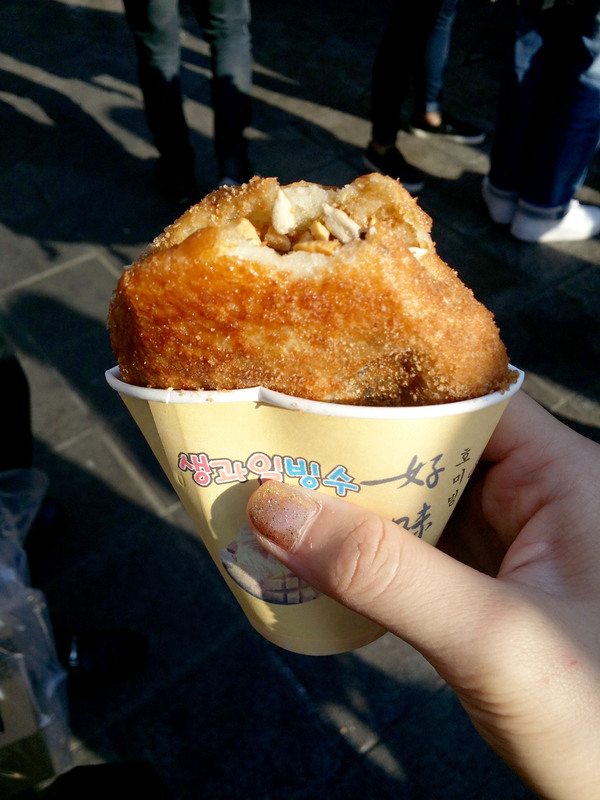 Oppa wanted eat Ho-ddok ( which is a kind of pastry ). So we queued for the famous one. 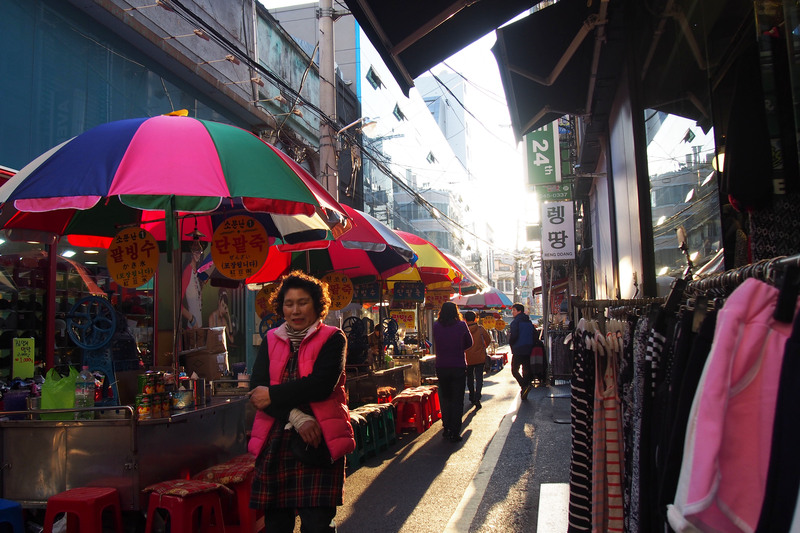 There is a street in Nampo-dong which was lined up with alot of Tarot cards reading stalls and street food stalls. You know those you see in K-dramas. Where they had street food in a plastic sheet covered stalls. Lotte Department Store Gwangbok is just next to Nampo-dong shopping street. Nearest MRT is Nampodong station , Exit 10. The world’s largest indoor musical water fountain and the rooftop park, which is the largest in Korea and it offers a great view of the entire city of Busan. Fyi , Lotte and Shinsaegae departmental stores close at 8pm. So you need to plan your shopping. Street shops don’t close that early and usually before 11 pm. 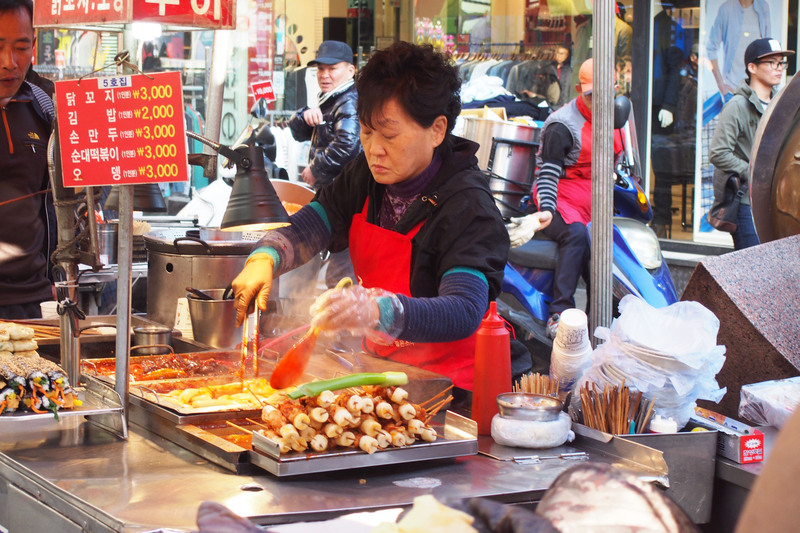 Street food galore. 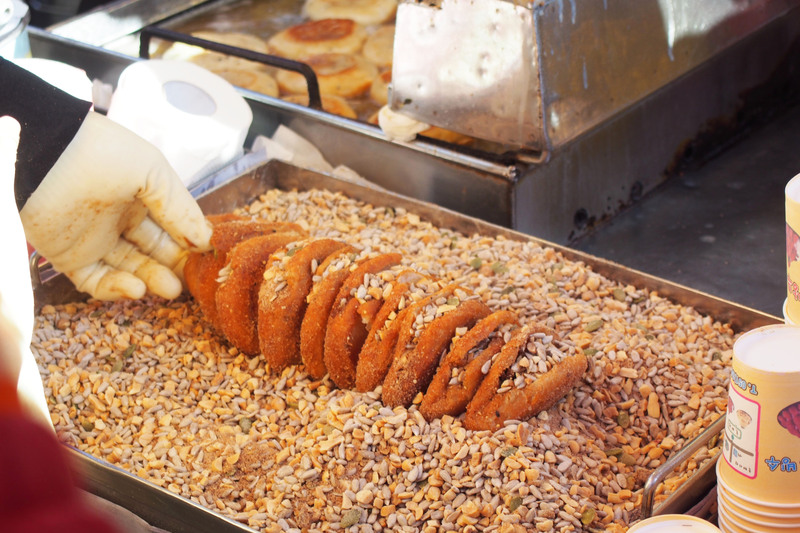 Street food can fill your tummies and there is no need to go to restaurants or cafes. 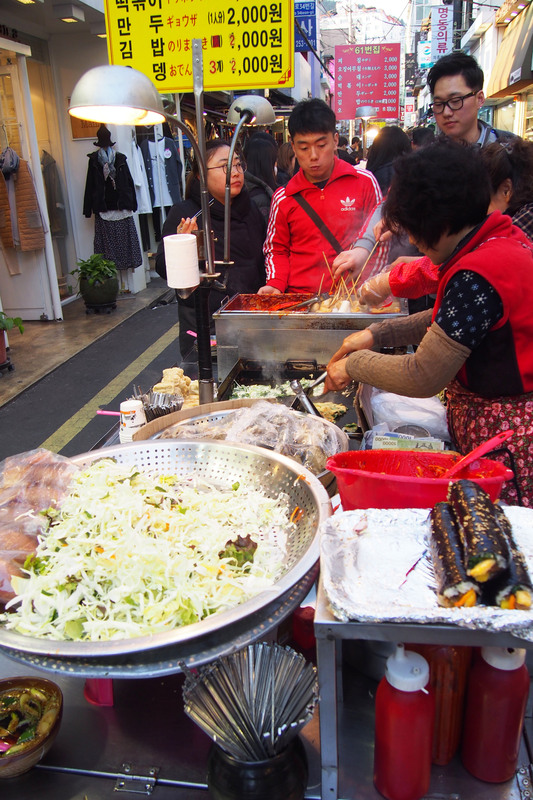 So many things to eat and so many varieties of local food at Nampo-dong street. 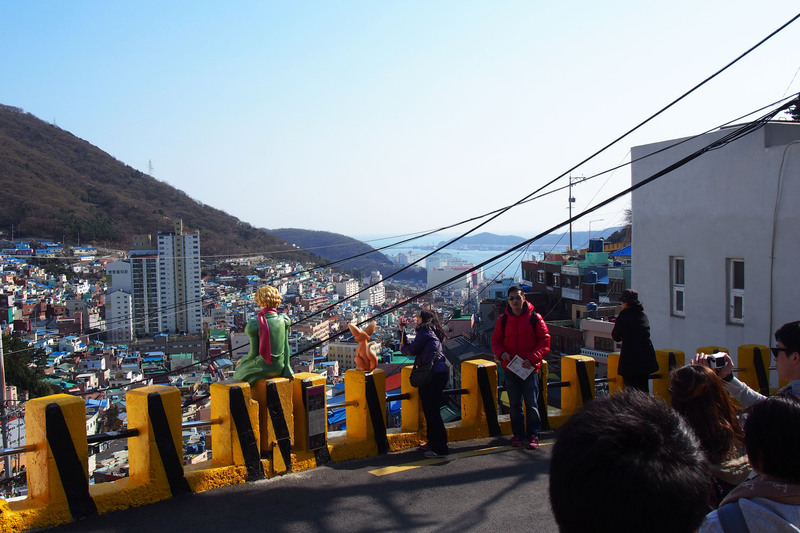 You can also visit Busan Tower located at Nampo-dong. After the street food street is the shopping stretch. 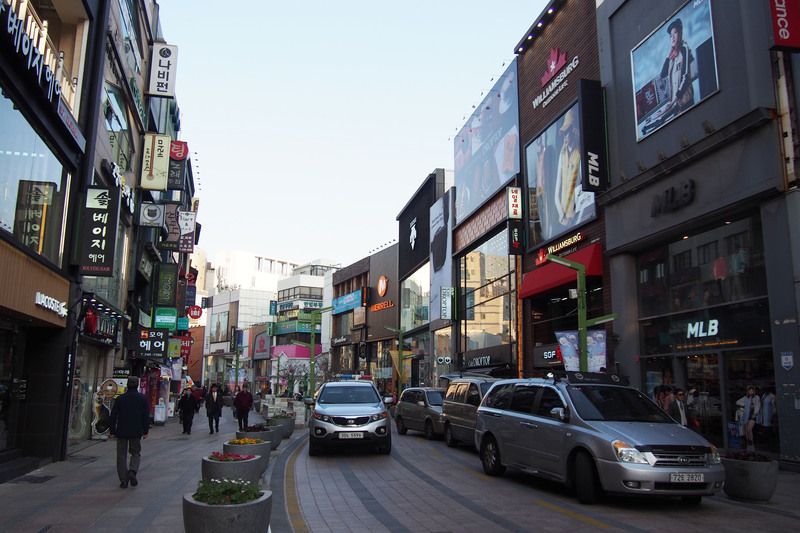 Somewhere along this shopping belt in Gwangbok-dong , you can see an escalator and it leads you to Busan Tower. I have been there 2 years ago so i didn’t go this time. It is the Busan’s version of Seoul Tower. Kinda similar. 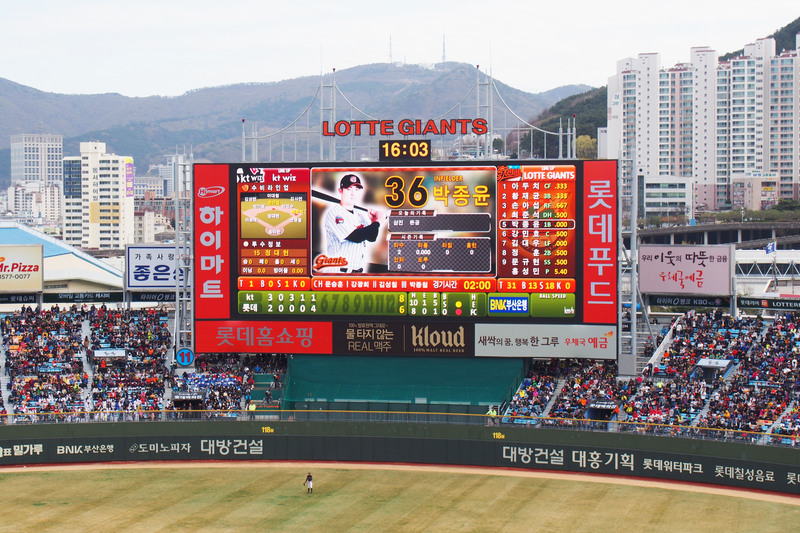 How to get to Gwang-bok dong ? Take MRT to Nampodong station , Exit 1. 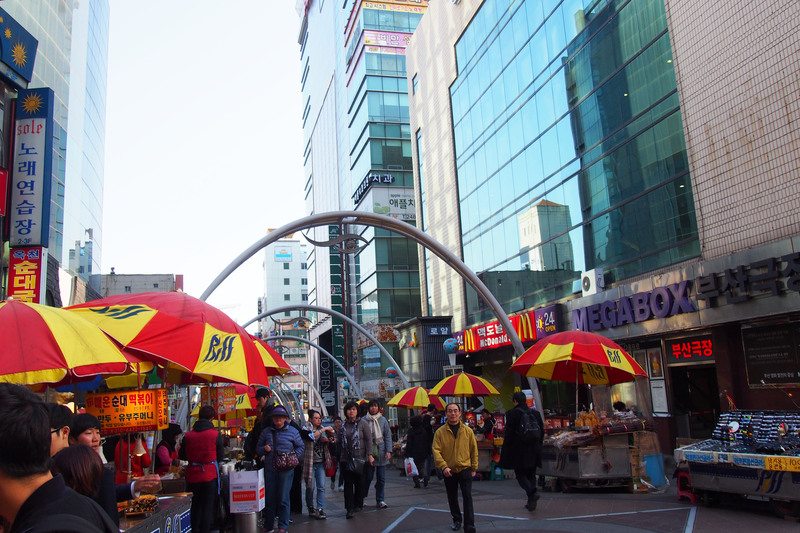 So in fact , you can drop off at Nampo-dong station and shop at Lotte , Gwangbok-dong and Nampo-dong shopping stretch. These 3 places are connected. So connected that you don’t know if you are at Nampo-dong or Gwangbok-dong lol. 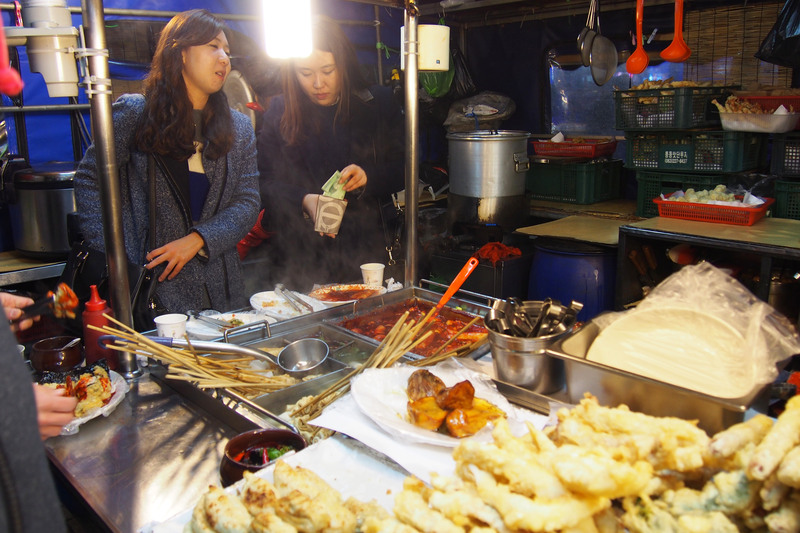 And after that you can walk to Jalgachi market from Nampo-dong for dinner and go back to your hotel via Jalgachi station. 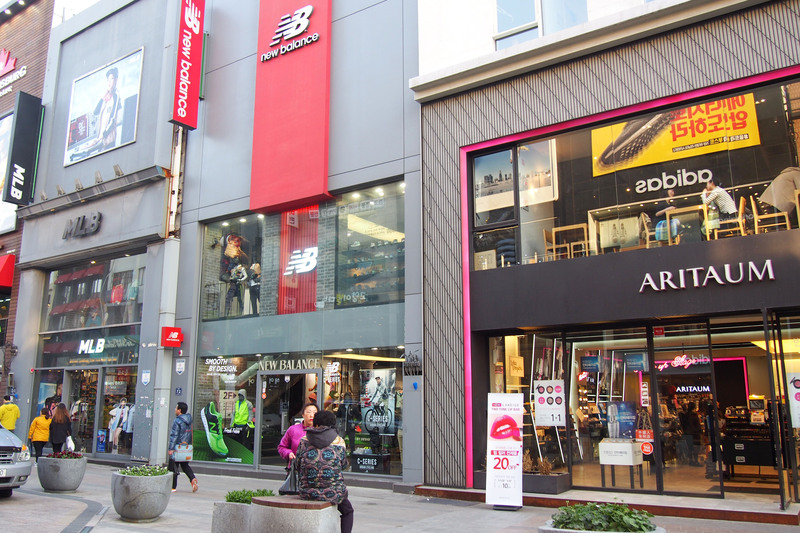 Difference between Nampo-dong/Gwangbok-dong and Seomyeon shopping stretch is that in Nampo-dong/Gwangbok-dong you can find more bigger brand names like MLB , New balance , Adidas boutiques etc and the shops are bigger whereas in Seomyeon , you can find more local designers and smaller fashion shops. Of cos , the ones in Seomyeon are cheaper than Nampo-dong/Gwangbok-dong. But for beauty brands , all outlets sell same things lah. We walked further in to Gwangbok-dong. 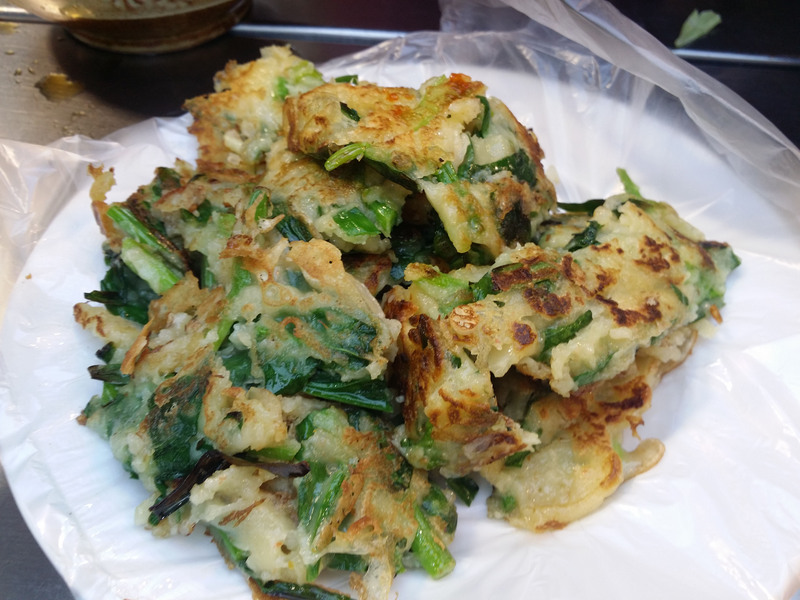 Korean pancake with spring onion. Shop and eat . Shop and eat. Because the street food carts were all lined up infront of the fashion shops. It turned windy and cold so suddenly (8 degrees and im feeling so cold in my outfit ) ,. 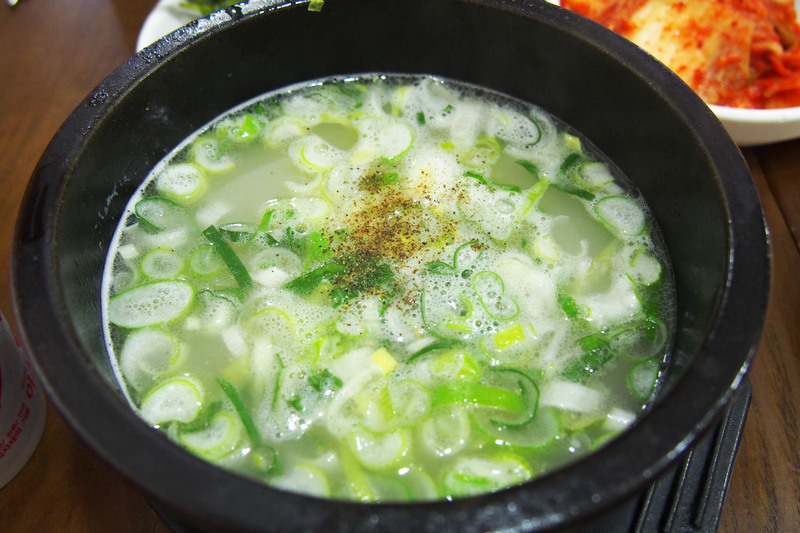 so the only comfort was to keep eating and drinking the free flow of Oh-Muk (fish cake) soup to keep my body warm. 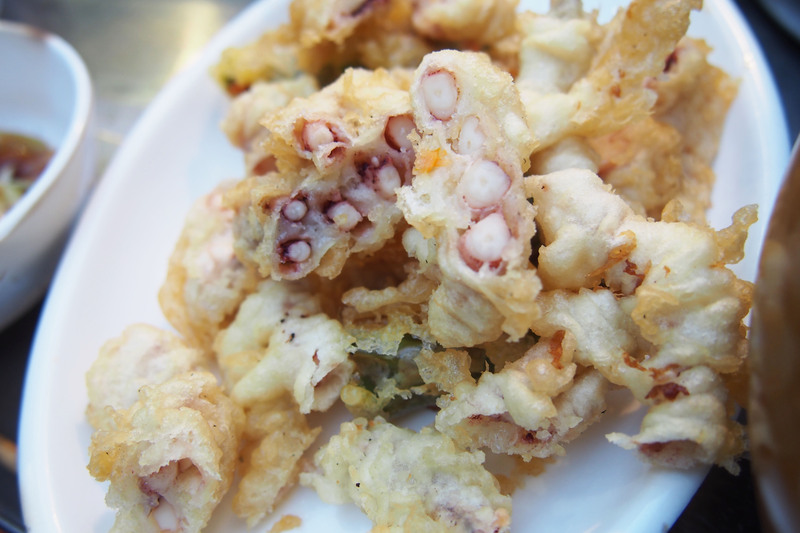 Busan is famous for their Oh-Muk ( Fish cake ) . You should buy them home or eat at the road side stall. We were standing at the stall eating the street food for dinner and i don’t wanna leave because i felt so warm eating and drinking the hot soup. 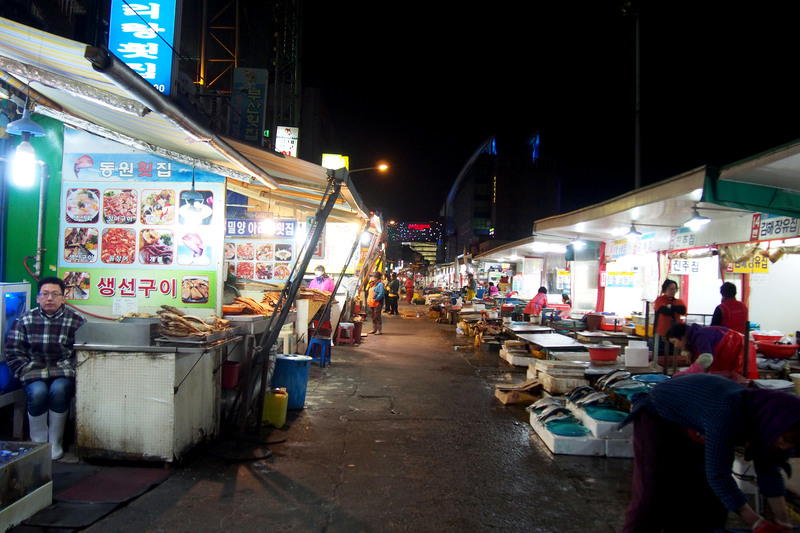 Jalgachi Fish Market at night. So cold lor…i cannot take the cold and just want to go to the nearest Lotteria for a cup of hot coffee. 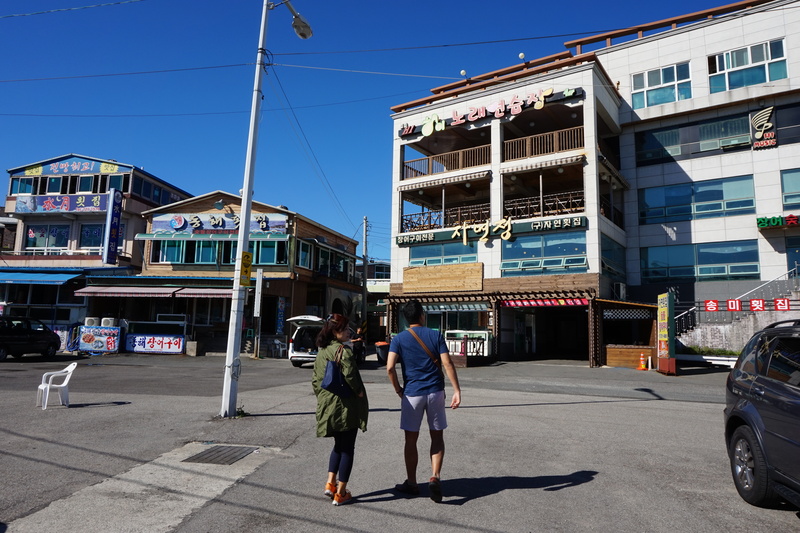 So we just rushed through a small stretch of Jalgachi fish market , walked back to Nampodong for final dose of Oh-Muk Soup before we head back to our home in Seomyeon via Nampodong station. 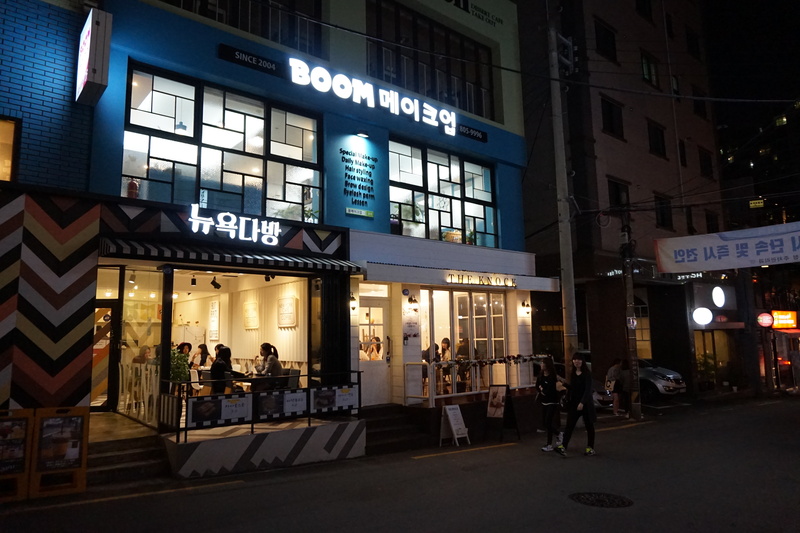 I bought alot of beauty products and make up when i shopped at Seomyeon which is just opposite our house. Last post , i blogged about the A.H.C (Korean professional skincare line) which was widely used in aesthetic clinics. 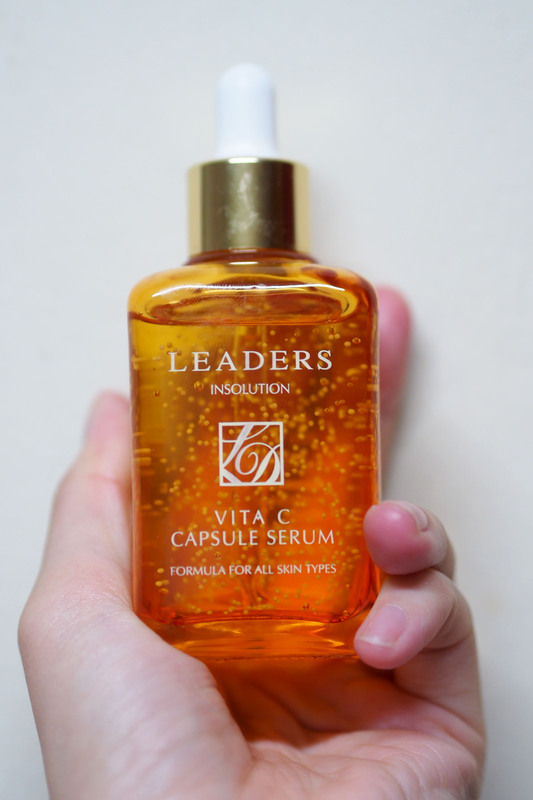 This post , gonna blog about a new serum i bought from Iope and a Leaders Vitamin C serum Oppa’s mother bought for me. I heard about this brand called Leaders before but i don’t have the chance to try it because it is sooo hard to find. You can buy their masks in SG but not their serums , creams or cleansers etc. This brand was created by dermatologists from Seoul University. I tried this serum and i love it . 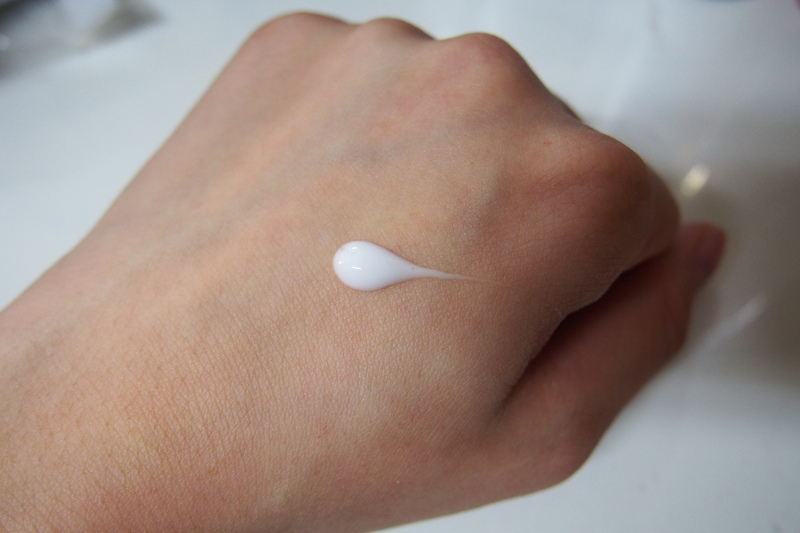 Easily absorbed and after applying the serum , i can apply my emulsion , moisturiser and creams without worrying that it will make my skin oily. It comes with capsule beads which contains high concentration of Vit C. I have been using this for a week already ! I saw that there is a slight improvement in my skin tone. With this Vitamin C serum and other products im using , i think it makes my skin tone looks better and brighter. This is not easily available online and Oppa’s mother bought from the HOME SHOPPING TV program. Lol. That is her favourite TV channel. I tried to find it in Gmarket but it is not available. 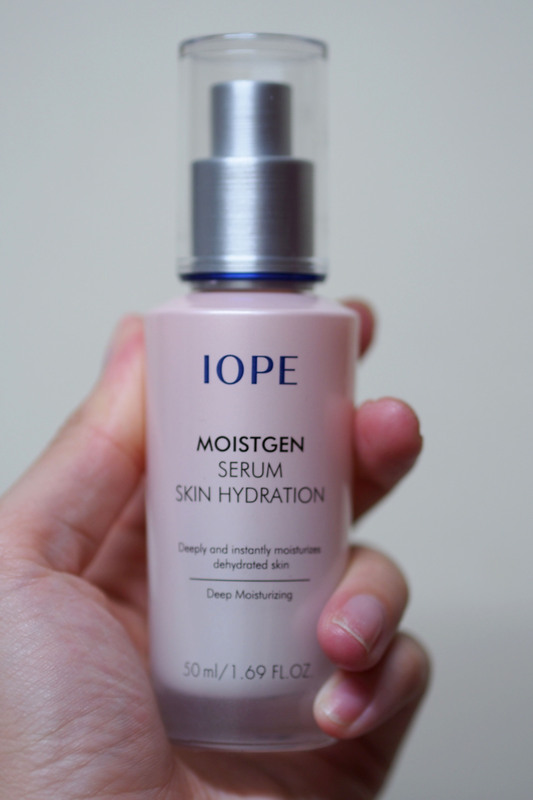 Iope Moistgen Serum Skin Hydration. I tried the samples before i bought this full size bottle. Some times you must be thick skin abit and ask for samples before you buy the full size bottles. I always ask for samples to try first so that im sure the product suits my skin condition before i spend money and buy. If im not wrong it is about KRW 49,900. Lol. I threw away the boxes and can’t remember the price. 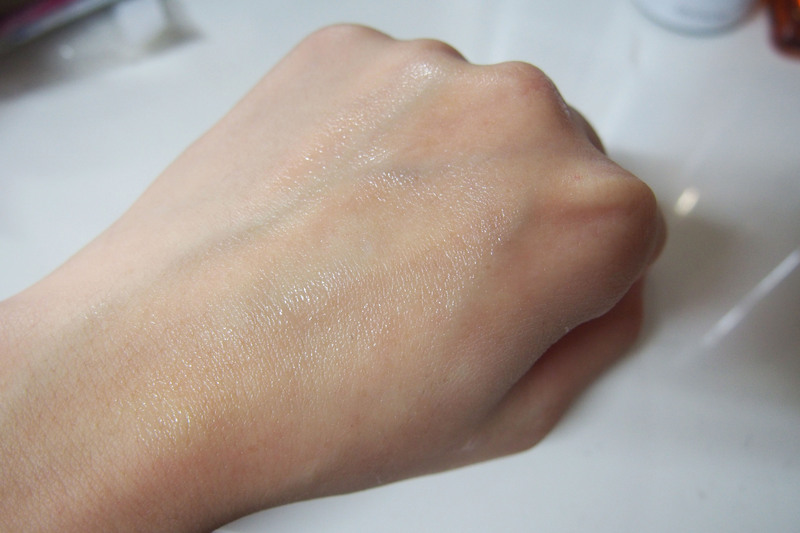 What i like about this is that it is not oily and easily absorbed. Im currently using this and Hera’s Waterin Serum. 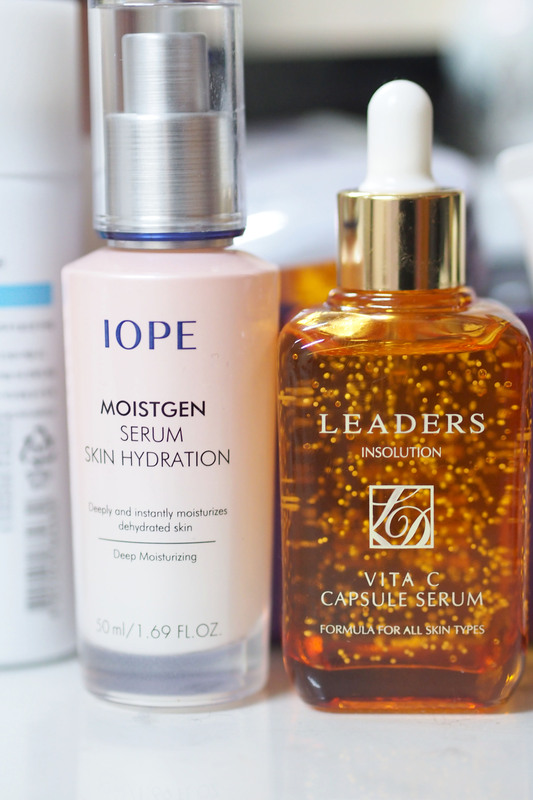 I switched Hera’s Waterin Serum to night because the texture is more sticky than Iope’s. I find it easier to apply make up if i used the Iope one. Hera’s Waterin Serum is good and really hydrating too. I had my Eyelashes done at Seomyeon eyelash extension studio. I walked around Seomyeon and all the eyelash extension shops there are having promotion of KRW 30,000 which is approx SGD 35 only. I did it 3 weeks ago and the eyelashes are still very dense till today and i am happy with the results. Usually the ones i did in SG all dropped off within 2 weeks. But the one i did in Korea are still going on strong and dense even at the 3rd week. I took pictures with my HP but i have problem transferring them to the lap top to post it here. Once i have resolved this problem , i will post a picture for you all to see. The shop i went to was called Magic Face. They do not have any website. I just chanced upon it and read from naver blogs and reviews from other Koreans. You can go to any beauty shops in Seomyeon to ask for the price and usually outside the shop , they will hang a banner or poster if there are any promotions. Seriously you should get it done in Korea instead if you are there for holiday because it is so cheap ! I had eyelash permed and extensions done for total of KRW 50,000 ! I checked with my Korean girlfriends. For eyelash extensions , usually it is only KRW 30,000 even in places like Seoul . It should not be more than KRW 50,000. So im back from my 2 weeks stay in Korea. This trip was an important trip because im meeting my bf’s mother. Lotsa things happened during this trip . 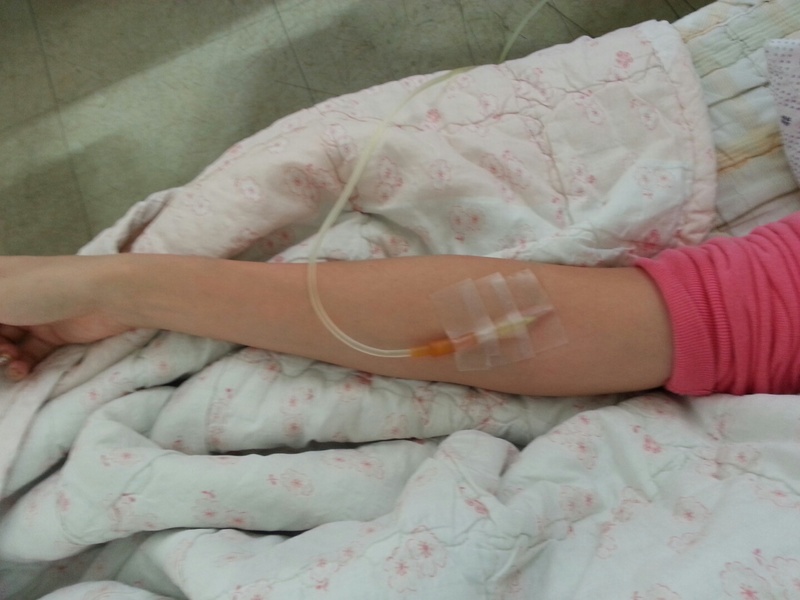 The major one was that i fell sick and was hospitalized and on IV drip. I was bedridden for 5 days because i vomited and had diarrhea non-stop. Anything i ate were excreted or vomited out. I haven’t had anything and i don’t want i still can vomit and had diarrhea non stop. And the scary thing was that only clear water came out. Yes i vomited water and had clear watery diarrhea. Felt so dehydrated that i only go to the toilet to pee once a day. The feeling was terrible. And the weather was cold during the first week because it was the end of winter and that was when temperature suddenly dipped and got very windy. So i was feeling really bad and spend most of the time on the heated bed and resting. Because i couldn’t eat anything , i lost alot of weight . I couldn’t blog for 2 weeks because i was traveling and working at the same time. Holidays are meant to be relaxing but not for me because even though im away , i still have to allocate at least 6 hours for work and i usually do that at night or early in the morning from 6am to lunch time. Also when i was bedridden , i can only surf the net through my phone and update my instagram account. Well , at least i got to eat fresh and live sashimi , street food and BBQ before i fell sick. We have 2 home bases. 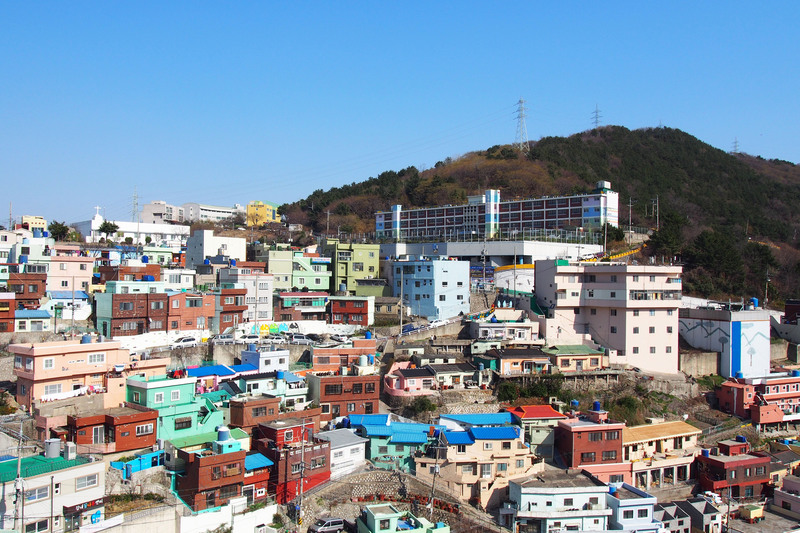 One in Gimhae (oppa’s mother’s motel) which is located at the north west of the Busan MRT line and a studio apartment ( also known as officetel in Korea and it was oppa’s brother’s bachelor pad ) at Seomyeon which is located at the center of Busan. Jinjae oppa’s bachelor pad is just right in the middle of Seomyeon. It is very convenient because the shopping district is just right opposite his house where i can find my favourite brands like Aritaum , Etude house , The Face Shop , Innisfree etc etc and an underground shopping area which is swamped with make up and skin care brands , fashion shops etc etc. 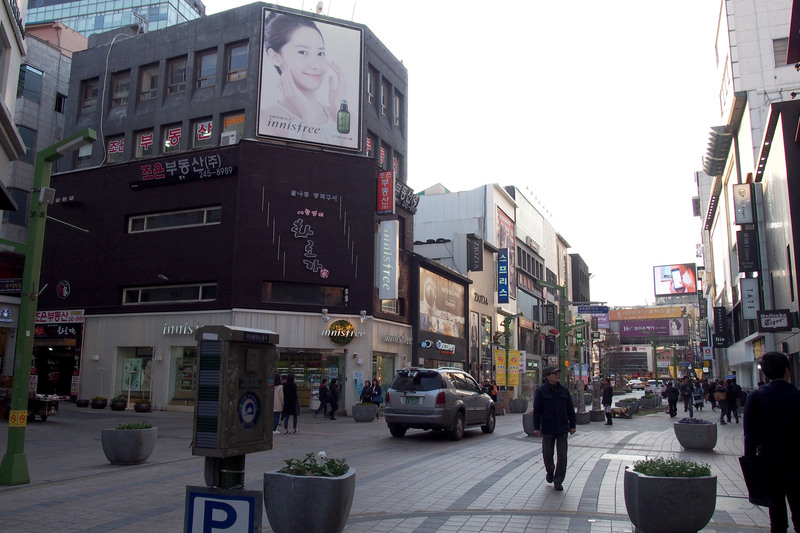 And also , Seomyeon has a medical street where the entire street was filled with plastic surgery clinics and hair salons. I just have to cross the traffic light to get to all these places. We arrived on Sat night and sleep over at oppa’s mum’s motel. She allocated the biggest room for us with jacuzzi. 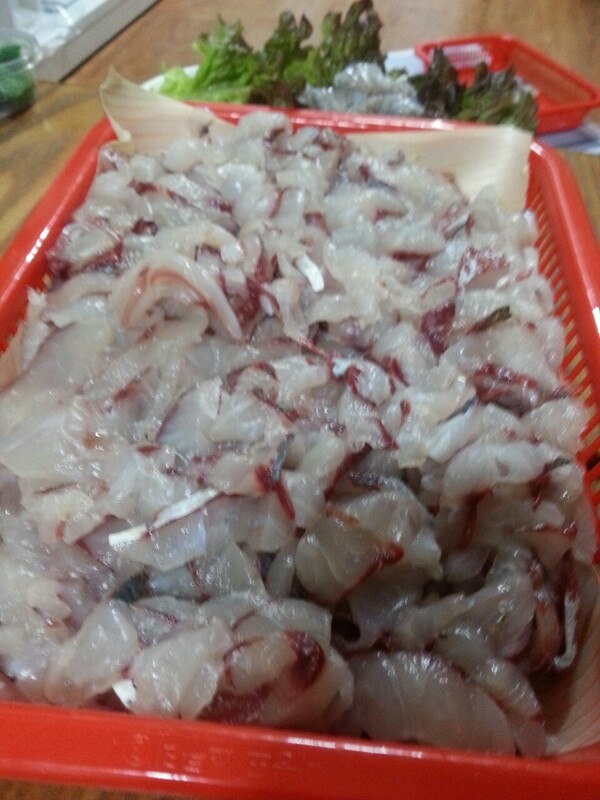 On the first Sunday morning , oppa’s brother Jinjae brought me to Yongwon fish market to buy fresh sashimi. It was very cheap and fresh. 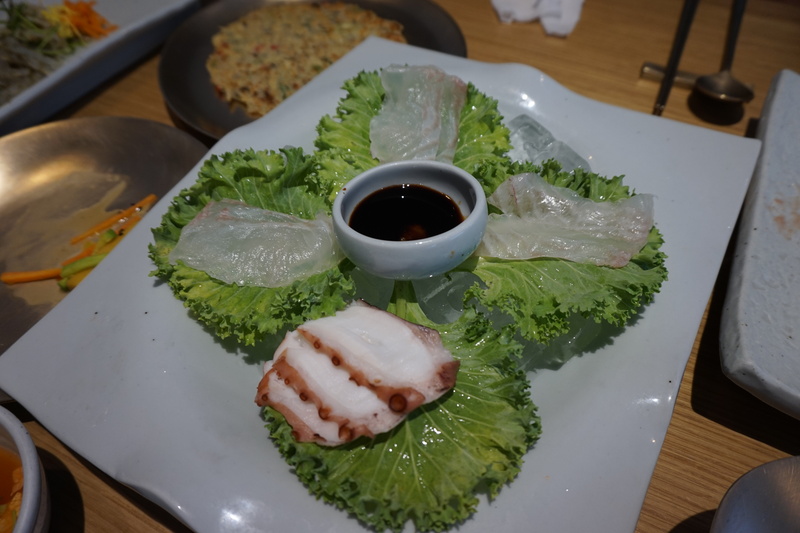 3 live fish sashimi for only KRW 35,000. 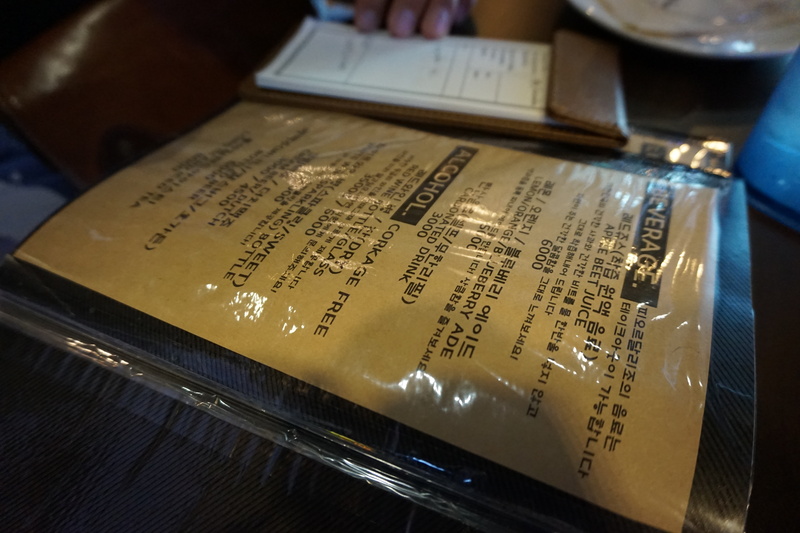 If you were to have this in SG’s Korean restaurant , you can expect to pay up to $400 but in Korea , it was just KRW 35,000 which is approx SGD 40. That’s 10 times difference. 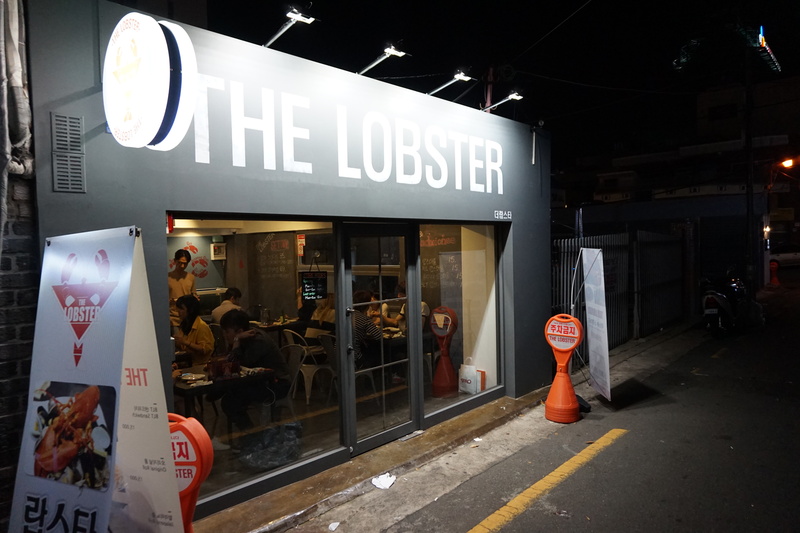 So if you are heading to Busan or any cities/towns at the southern part of South Korea, you really have to try their seafood especially the sashimi (lobsters , prawns , octopus etc etc). Instead of going to Jalgalchi , Jinjae oppa said the one at Yongwon is nicer. Yongwon is 20 mins drive away from Gimhae. The fishes were live and sliced live right in front of me. 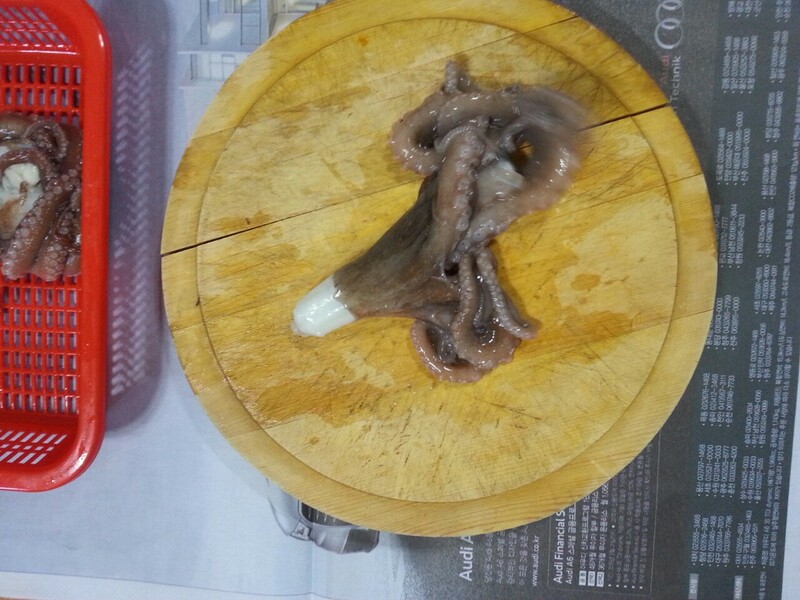 I felt very sad and guilty looking at the Ahjumma cutting away it’s head and slicing its body while it is still moving. 30 minutes ago , it was in the tank and next it was on our dining table. And i was carrying the live octopus in the plastic bag to bring back home to get it chopped and eat it. Looks cruel but it was really yummy. Sashimi was really fresh. Soooo fresh and chewy. So that was my first day in Korea. Sunday was spent having lunch with oppa’s mother and then we head to Seomyeon which is the central of Busan. And that was when my shopping for skincare and make up started. I bought some new skincare products which i think is pretty good. I will blog about them one by one because im just starting to use them. I didn’t buy alot this time and only bought the ones i wanted and that are good. Also , many were asking about my Busan itinerary which i will blog about too and the place where i want to have my C curls done and where i had my eyelash permed and extensions done for only KRW 30,000 ! I shall start from the next post onwards. Because im going for work trip this coming week with a friend and i have alot of work to do after i came back from Busan as well as to prepare for my work trip. They are my priority right now before i start blogging about my Busan trip , the skincare and make up products i bought and where i had my hair and eyelashes done. Some of the new products i bought were from AHC , Iope , Leaders , Cel Derma masks , Hair steam masks , Hera and other aesthetic and clinic brands etc etc. If you are going to Korea soon and want to ask me about some stuff , you can email at peonykissblog@gmail.com . Sorry , i know many of you are waiting for me to blog about my trip , products and services i went for in Korea so that you can also plan yours . But if it is urgent , you can email me first because i guess im gonna start blogging only after Monday night.